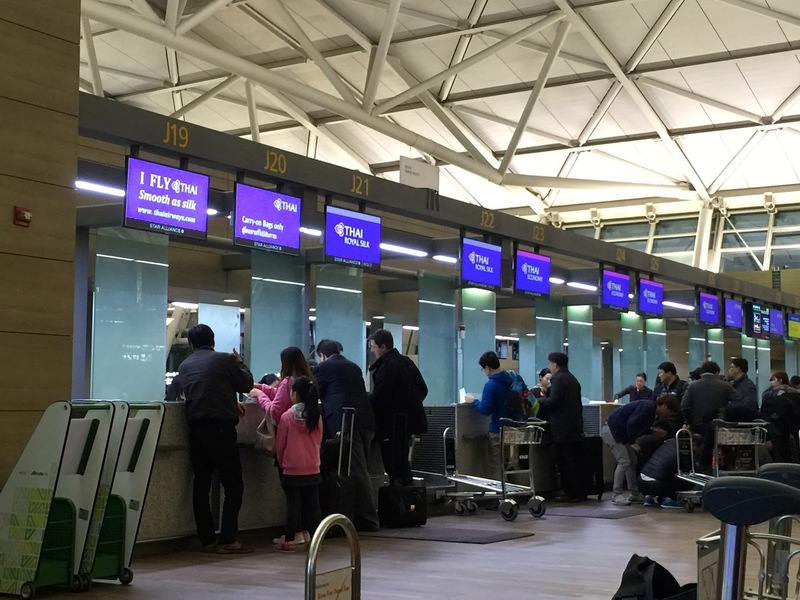 Thai Airways uses the check-in counters at Row D in Kansai International Airport. 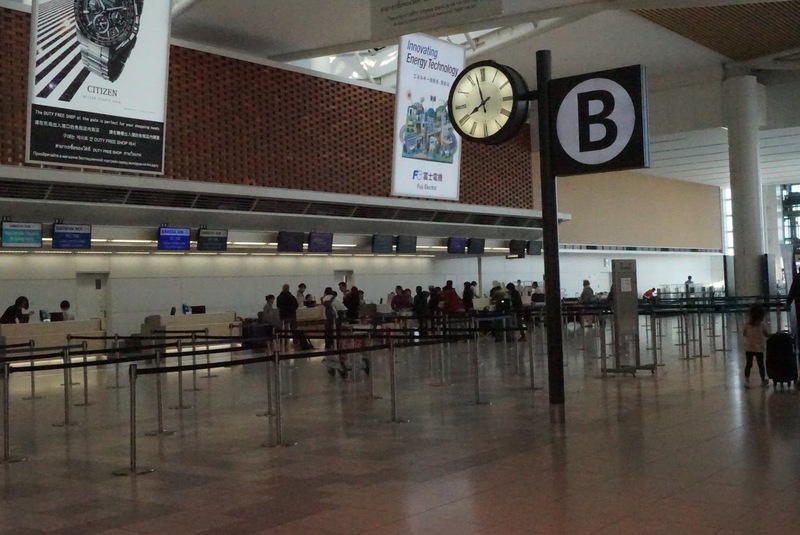 The check-in rows are located in the middle of the terminal building. There are 4 queues at the Thai Airways counter. Despite having 4 counters serving Economy Class passengers, the queue seems not to be moving much. There is another queue dedicated to passengers who have completed internet check-in, served by 3 counters, which is quite short. There is 1 queue for Business Class passengers, where the waiting time is rather short as well, thanks to the 3 counters serving passenger travelling in this class. 2 counters are dedicated to passengers travelling in First Class, where the queue is the shortest. First and Business Class passengers are given an invitation to the Thai Airways Lounge and a fast lane pass to clear immigration. However, I do find this pass a tad useless as it only gave access to a separate entrance to the airside. 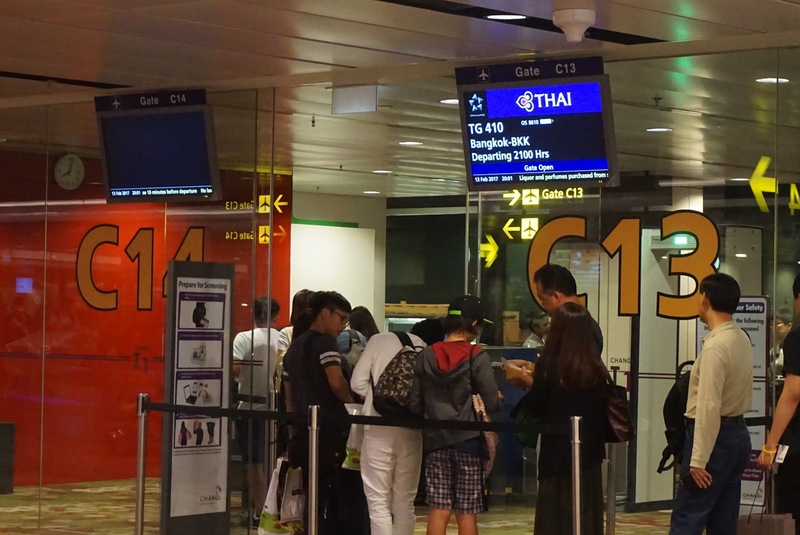 Unlike premium class passengers travelling out of Bangkok Airport, where there is a dedicated immigration counter for premium passengers. 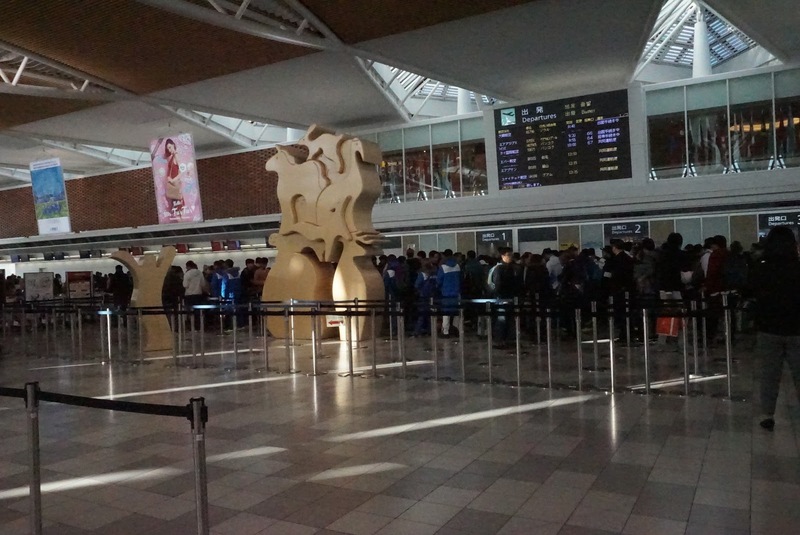 Passing through this entrance, premium class passengers are still required to join the queue together with other travellers leaving KIX at the immigration counters. 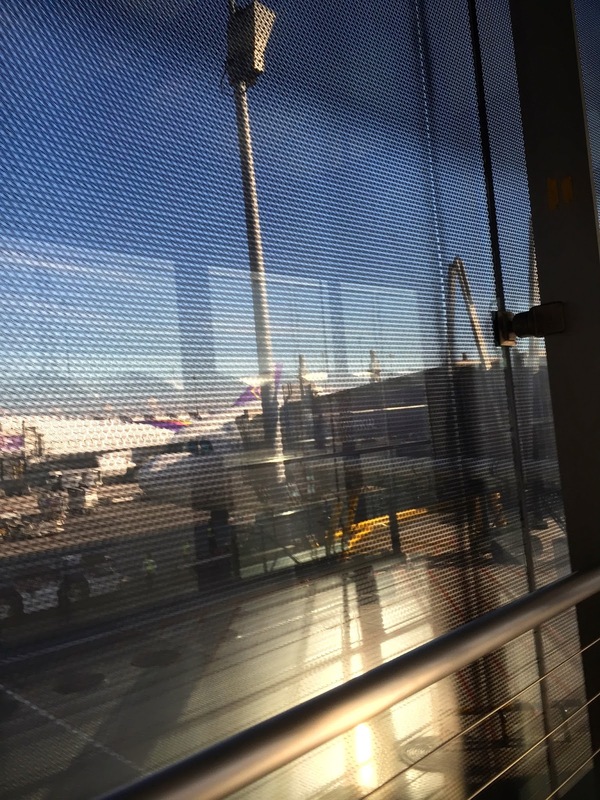 Thai Airways departs from the satellite terminal in KIX, which is a short internal train ride from the main terminal. 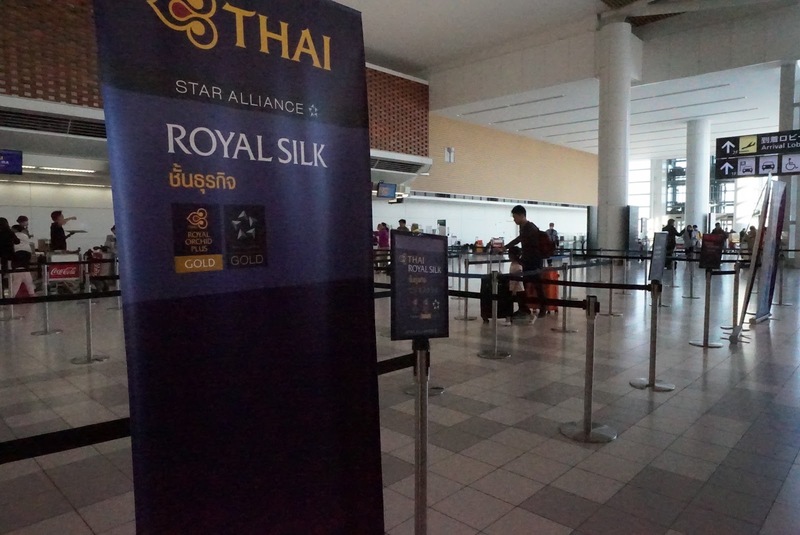 The airlines departed from Gate 11, which is a stone’s throw distance from the Thai Airways Lounge in the satellite terminal. There is a dedicated boarding queue for passengers travelling in Business Class cabin (together with First Class passengers). Business Class passengers were given priority to board before boarding commences for Economy Class passengers. 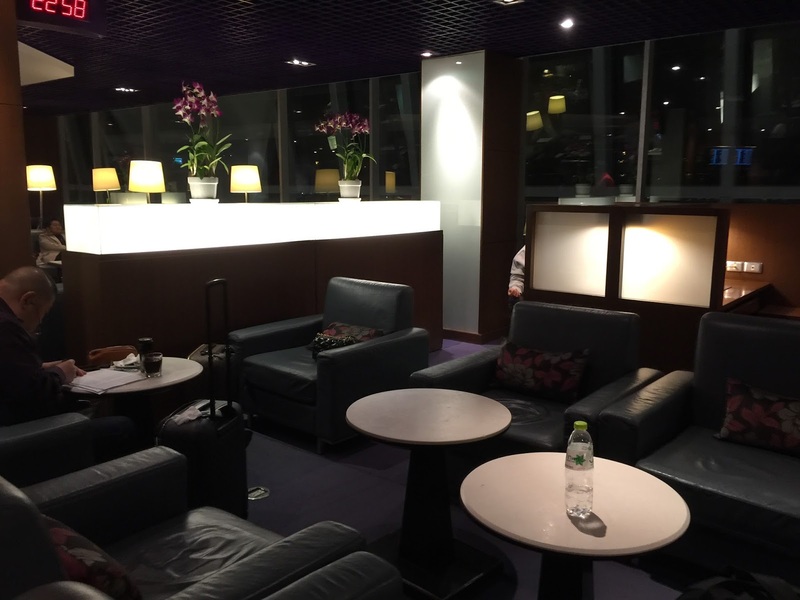 Thai Airways has their dedicated lounge in KIX. 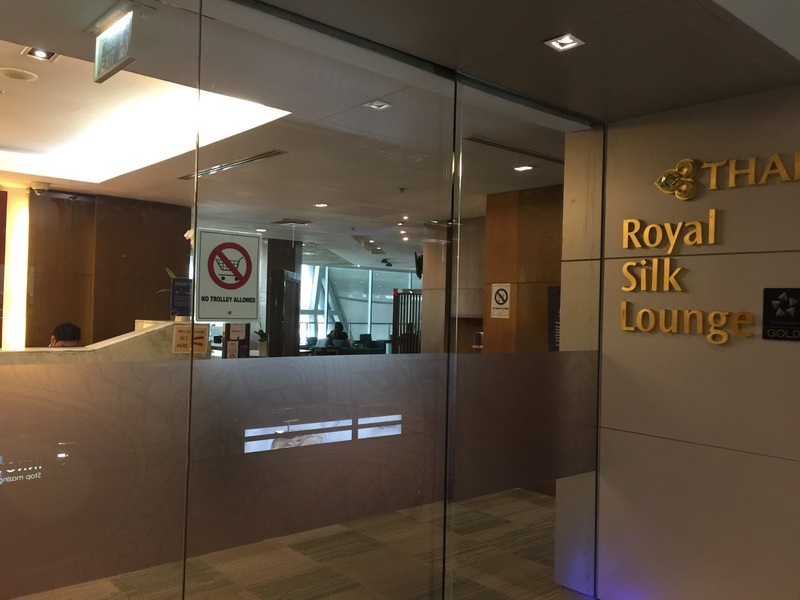 The Royal Orchid lounge is situated in the satellite building, which is very near to the boarding gate that was used by the airlines. 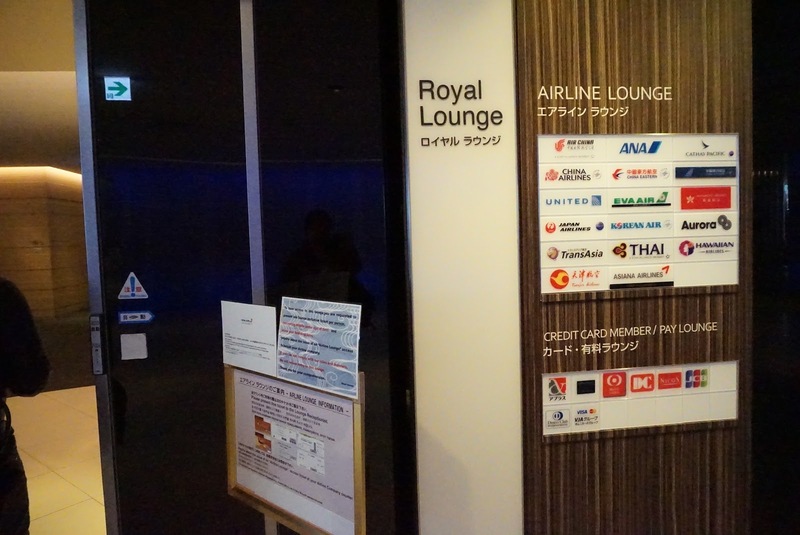 Royal Orchid Lounge in KIX occupies a rather small real estate. 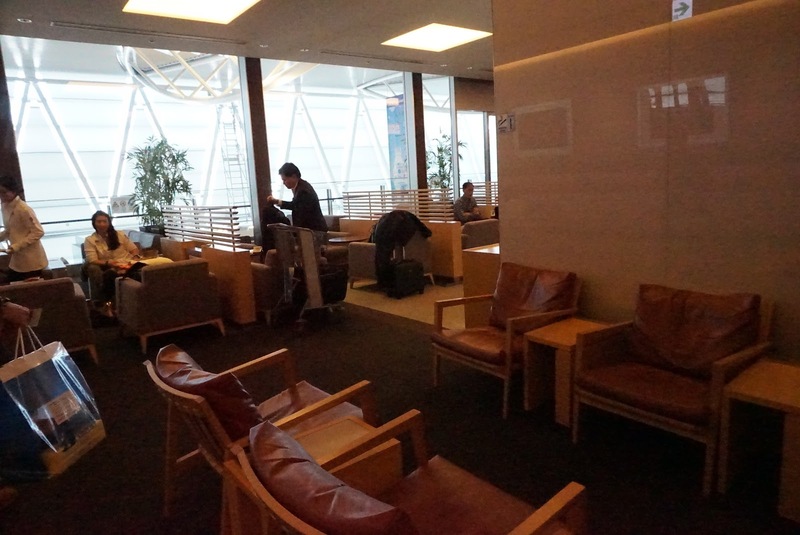 There is a section of the lounge for passengers to sit, with a sitting area arranged very close to each other. There is hardly any walking space between 2 separate set of seats. 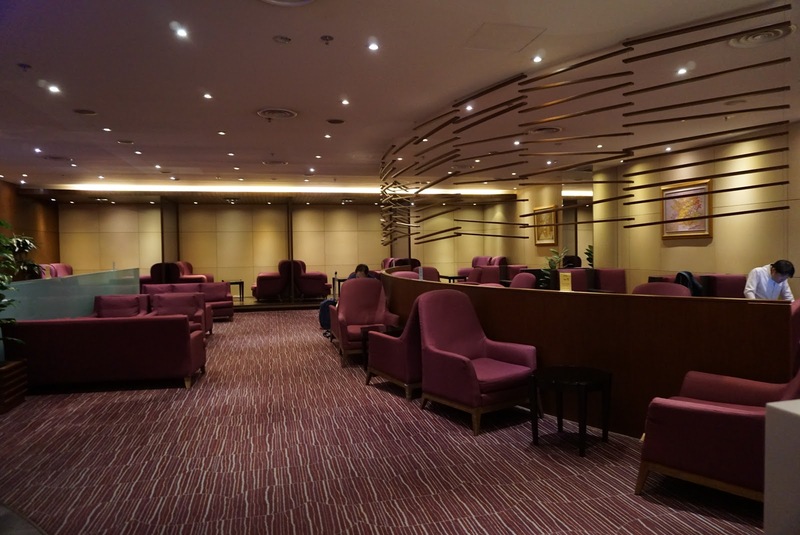 Part of the lounge is dedicated for passengers travelling in First Class Cabin. The food offering in the lounge is very limited. 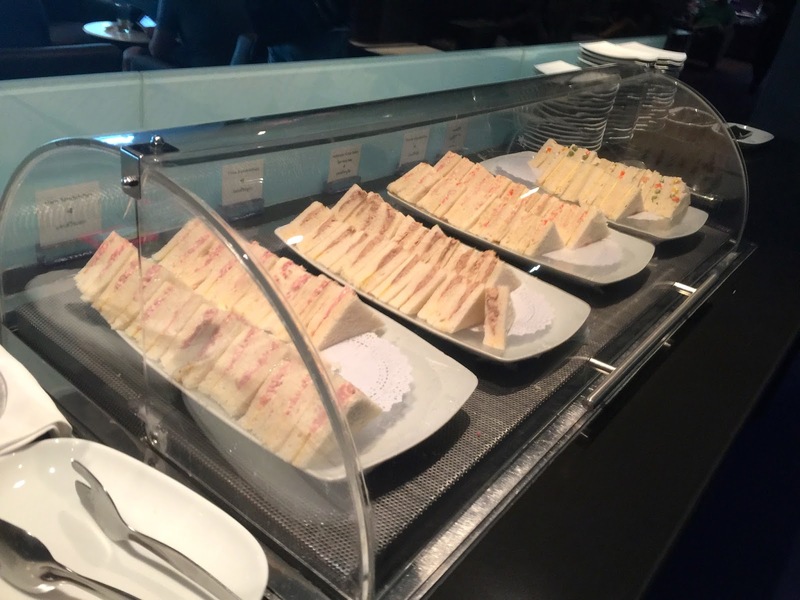 Snacks such as Onigiri, cup noodles, sandwiches and some Japanese snacks are served in the lounge. 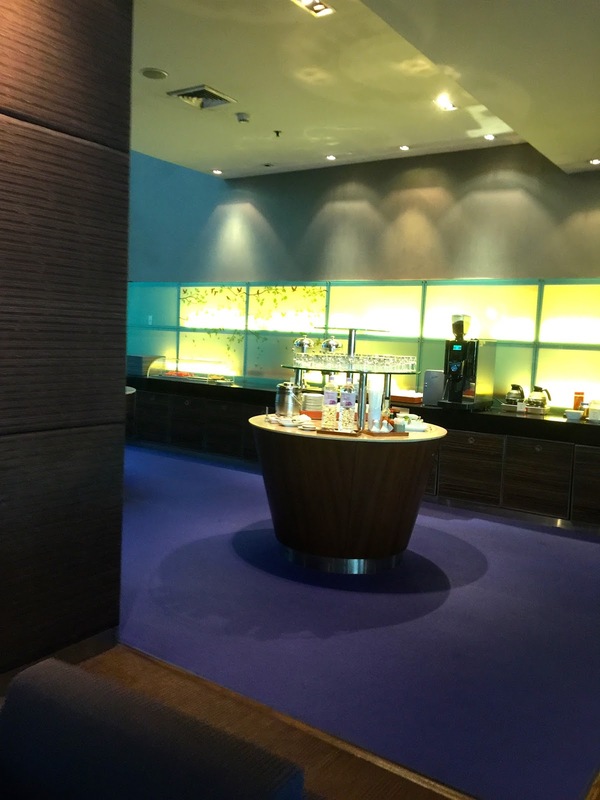 Coffee and tea, as well as beverages such as soft drinks, wine and beers, are also available in the lounge. 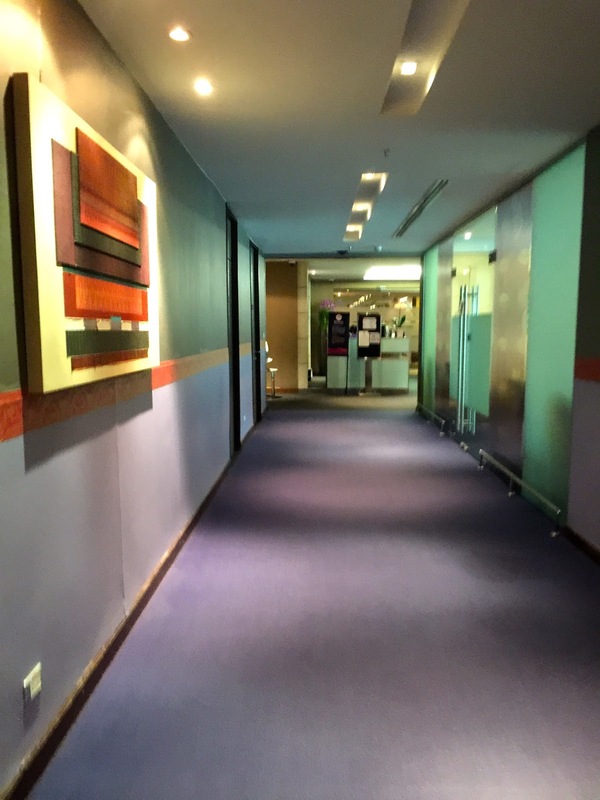 It is a shame that the lounge does not face the departure gate where Thai Airways aircraft depart in KIX. 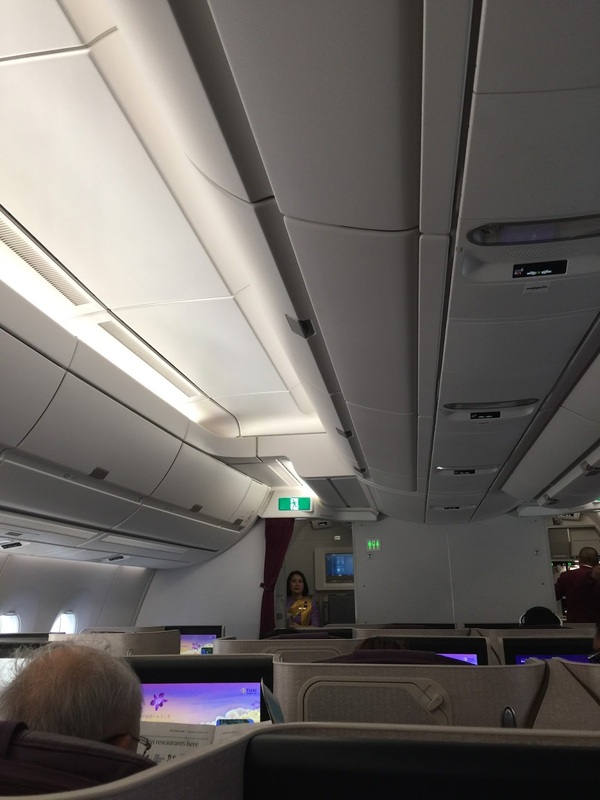 The entire Business Class cabin onboard Thai Airways A380 is located on the upper deck of the aircraft, spread out in 2 sections with 60 seats in total. The front section is the bigger section, carrying up to 48 passengers while the rear section sits 12 passengers. 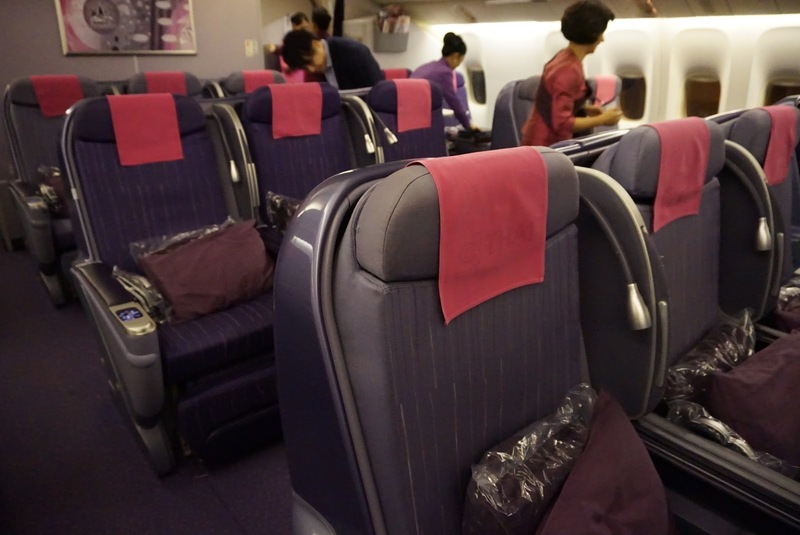 Business Class cabin onboard Thai Airways A380 is decked in the familiar light purple colour scheme that is used across the entire Thai Airways fleet. The purple exudes a calm and relaxing feel for passengers travelling in this cabin. 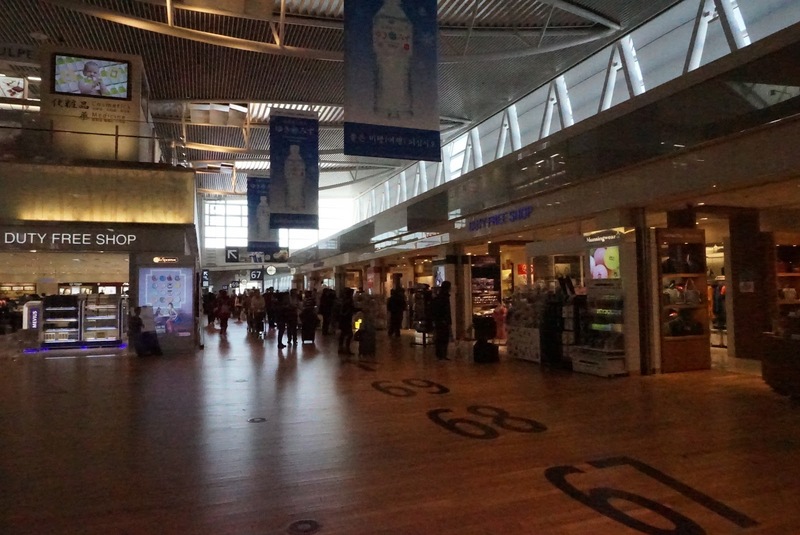 Lights are tuned to the brightest during boarding. Mood lighting is used during different phases of the 6-hour flight for passengers to adapt to the time of the day. Lightings are turned off after first meal service for passengers to catch up on their rests. The lavatories in the Business Class cabin onboard Thai Airways A380 is of a good size and feels bigger than the Economy Class lavatories. 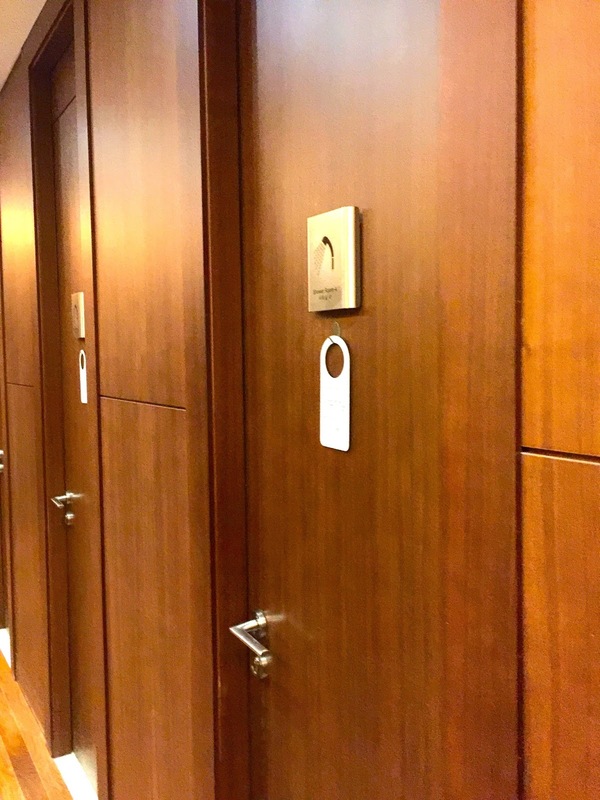 The Business Class lavatory is decked with wooden furnishing from the cabinets to the flooring, giving it a classy and premium feel. 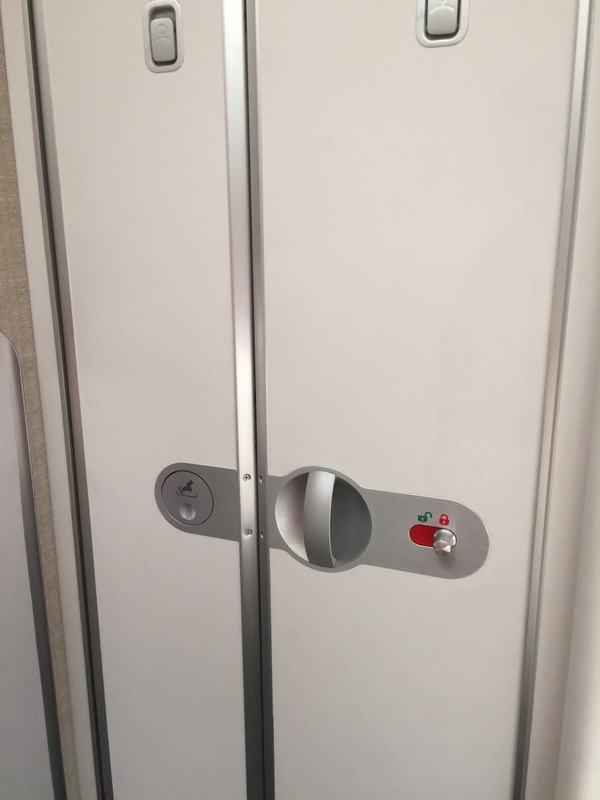 The lavatory has more amenities compared to the Economy Class lavatory. 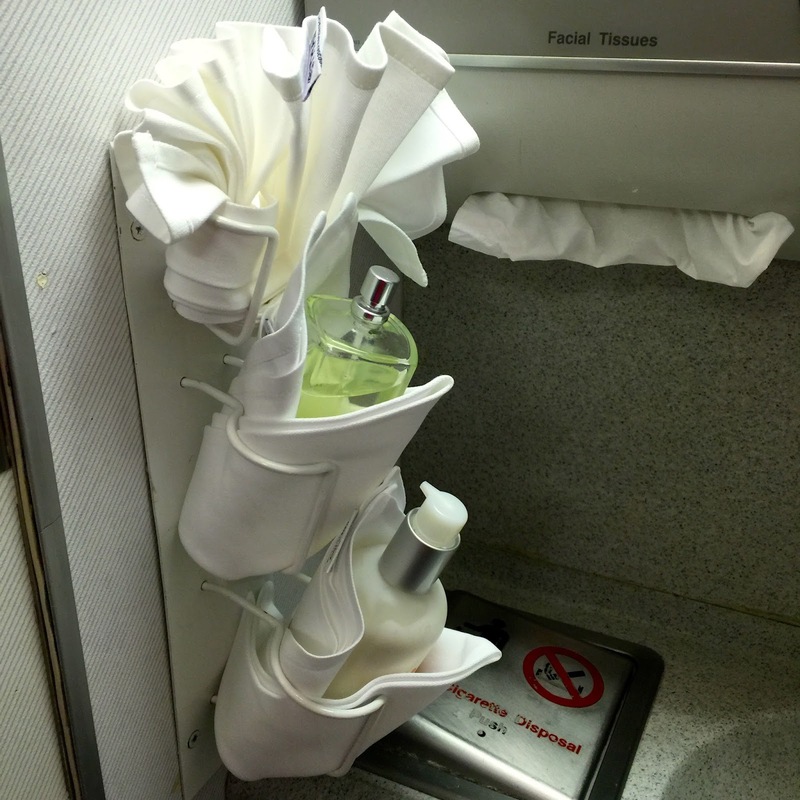 On top of the hand soap, cologne and tissue found in Economy Class, hand lotion and handkerchiefs are found in the Business Class lavatory. 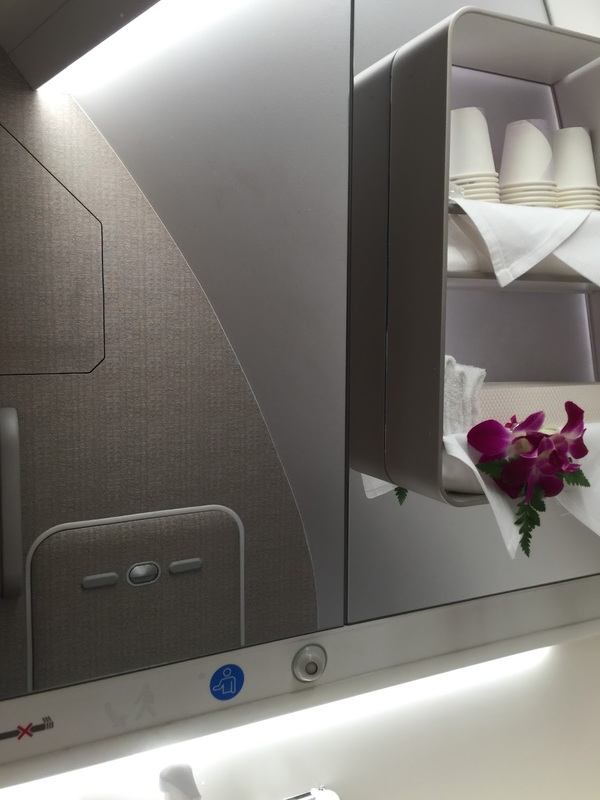 Thai Airways decorate their Business Class cabins with orchid flowers to give it a more premium feel. 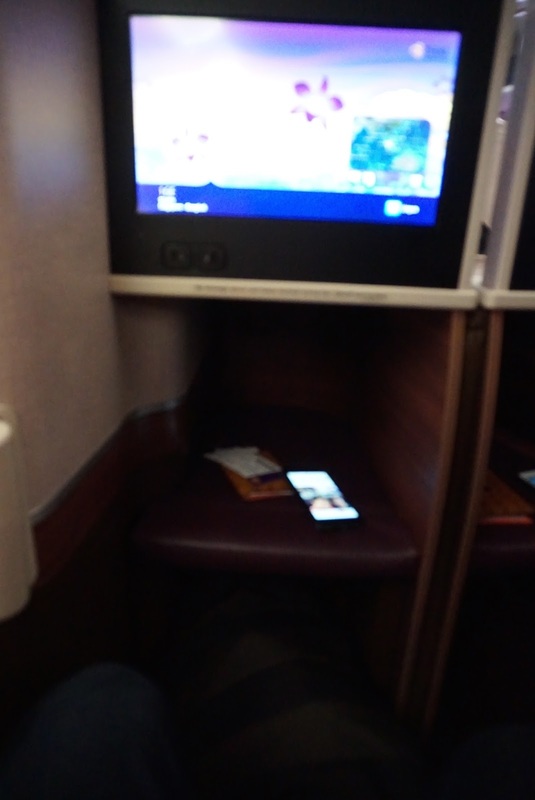 There is a small table on the right side of the Business Class seat onboard Thai Airways A380. Reading materials such as in-flight magazines and menu as well as the aircraft safety card are neatly stored in the seat pocket located above the side table on the right side of the seat (on some seats, the small table and the seat pocket are located to the left side of the seat). 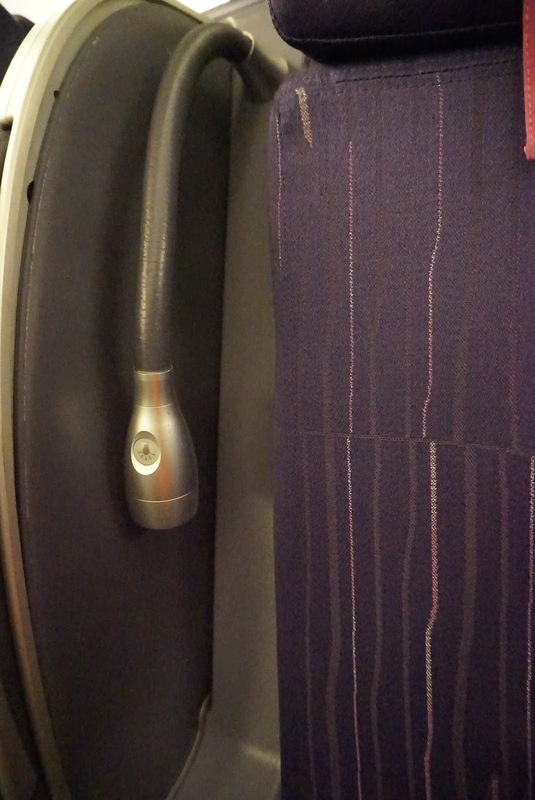 Just beside the seat pocket, closer to the seat is where a small reading light is placed for passengers to use. The reading light can be adjusted for different levels of brightness. Opposite the seat pocket, on the bulkhead next to the IFE screen is where the coat hanger and tray table are located. The tray table is quite big and swings up to the bulkhead when stored and can be moved forward for passengers to exit the seat when deployed. 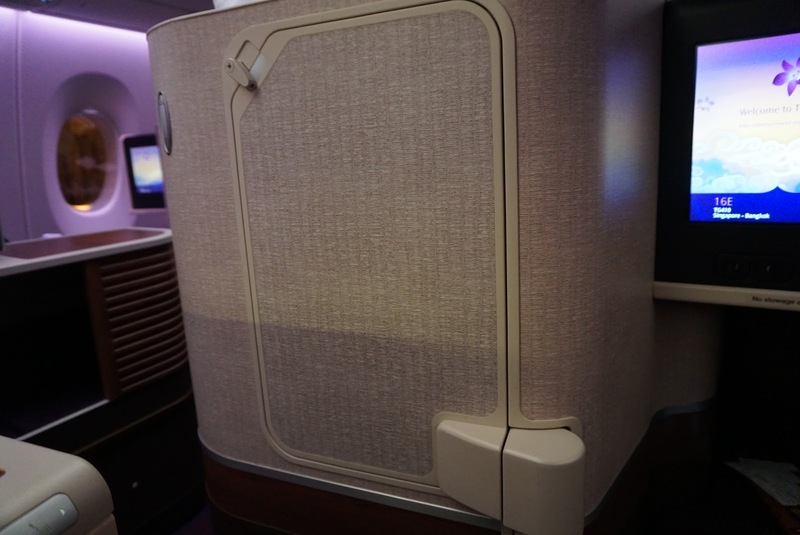 There is some practical storage space in the Business Class seat onboard Thai Airways A380 aircraft. 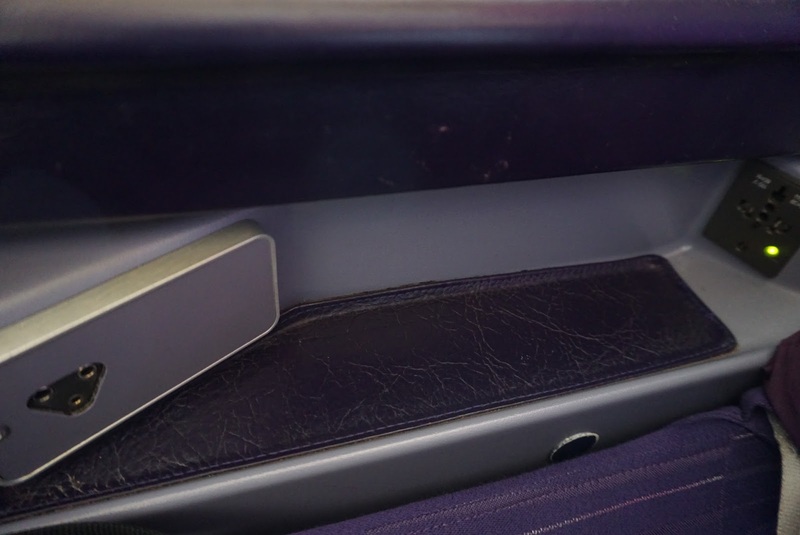 A small bin by the side of the seat just beneath the left armrest, allows passengers to store things like their iPad or a book other than passports and mobile phones. 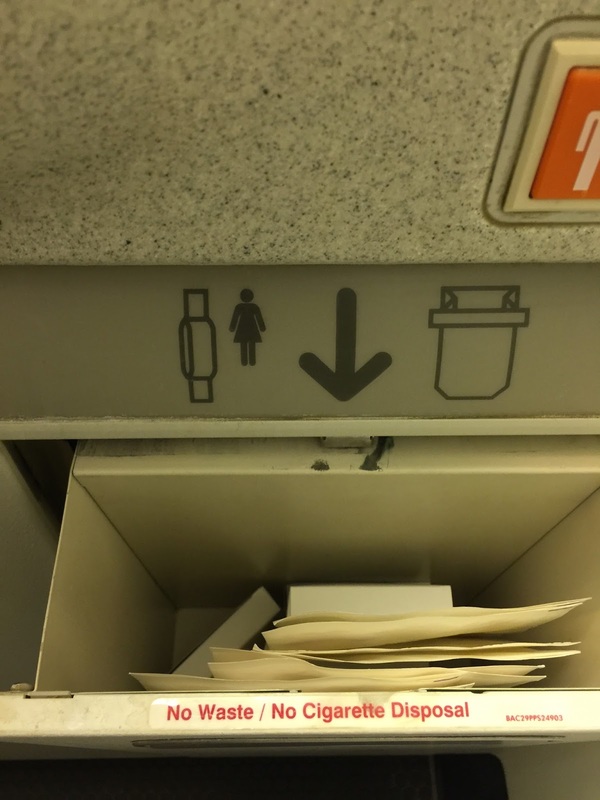 This bin is larger than those found on the newer Thai Airways A350 Business Class seats. 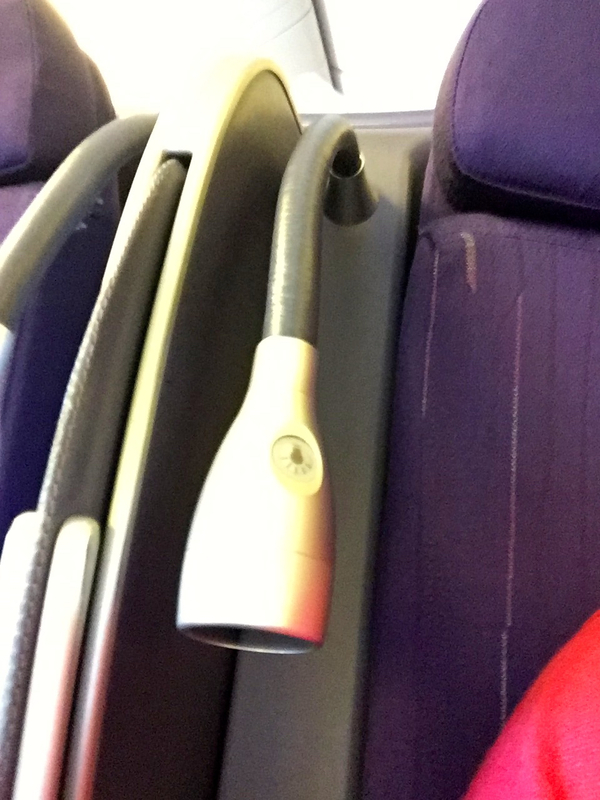 The headphone jack is located by the armrest on the right of the seat alongside a power socket located slightly below the headphone jack. Seat control and the IFE controller can be found mounted to the seat bulkhead above the armrest on the right side of the seat. 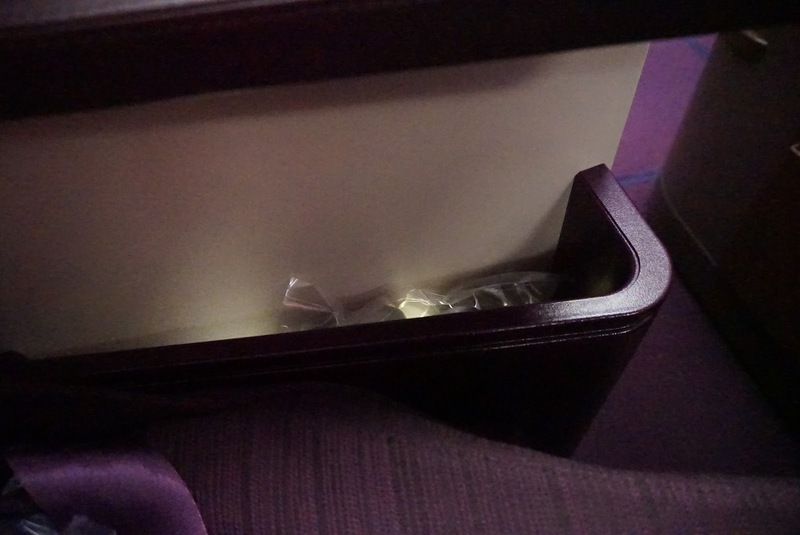 There is an additional storage bin for passengers sitting by the window onboard Thai Airways Business Class cabin. 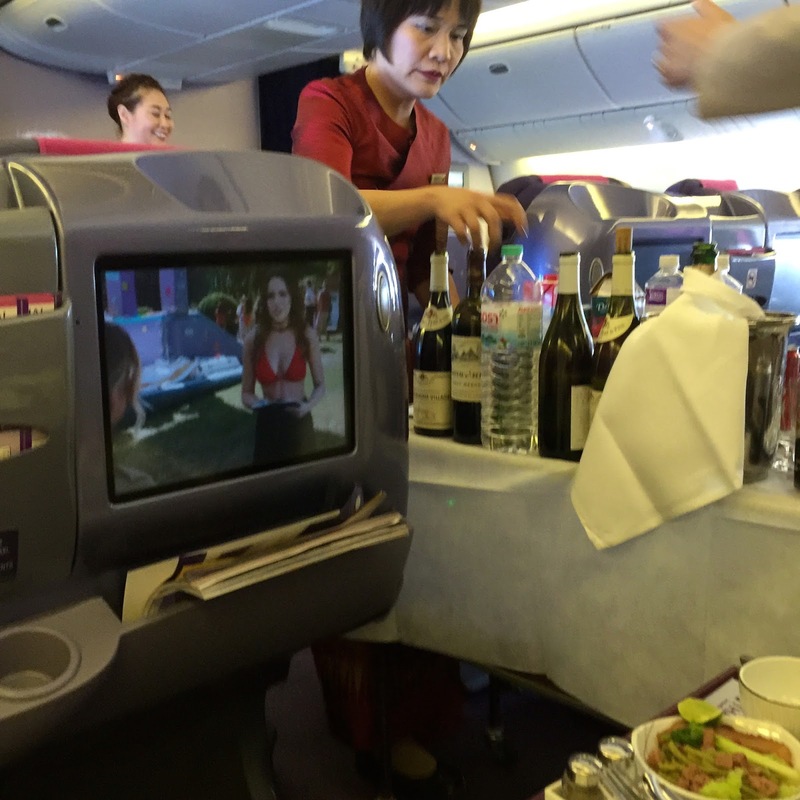 Thai Airways has a superb in-flight entertainment system that keeps their passengers occupied throughout the fight. Passengers can choose from movies from Hollywood and Thailand as well as sitcoms and radio stations. There is even a menu for young passengers containing movies and TV shows that are targeted to children. One can also be entertained by the games in the IFE system, though I find the games a tad boring. 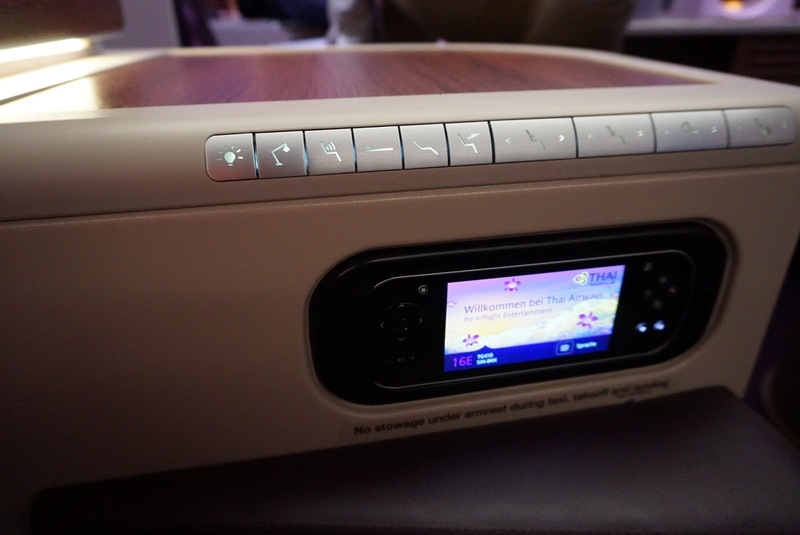 Seats in the Business Class cabin onboard Thai Airways A380 are equipped with a large 15″ touchscreen monitor. The monitor is quite sensitive and the touchscreen function did not lag at all. 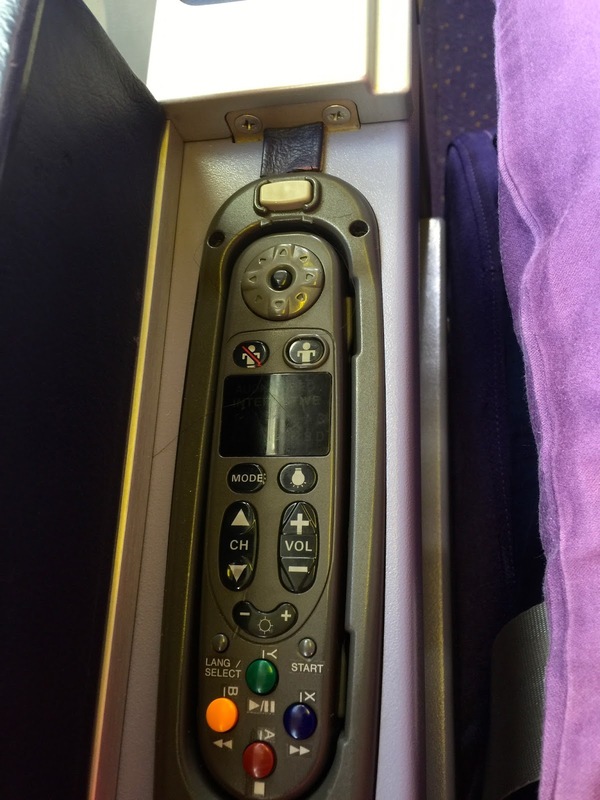 Alternatively, Business Class passengers can toggle through the IFE menu using the remote control stowed above the armrest in the seat. 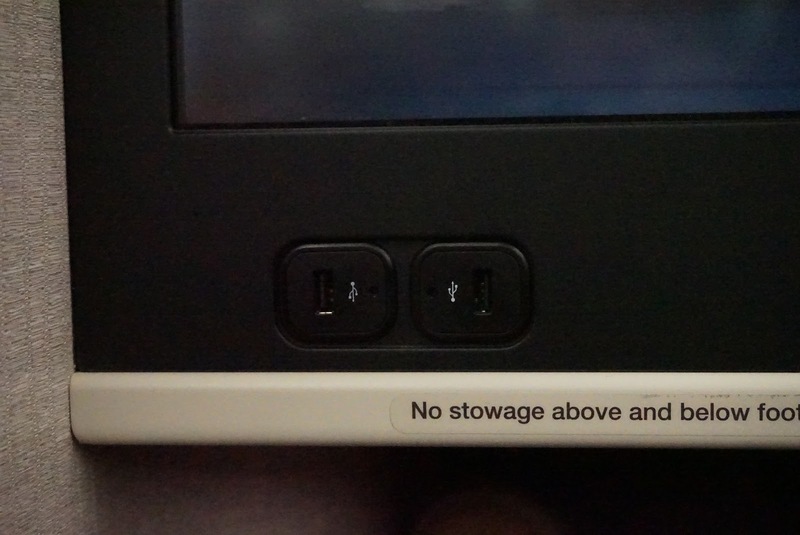 There are 2 USB outlets located below the IFE TV screen. However, I find watching the TV when the seat is in the flatbed mode to be impossible due to the lighting on the LCD screen. There are also no tilting functions on the IFE screen. I do find the lounging position on the seat is most ideal for catching up movies on the TV screen. 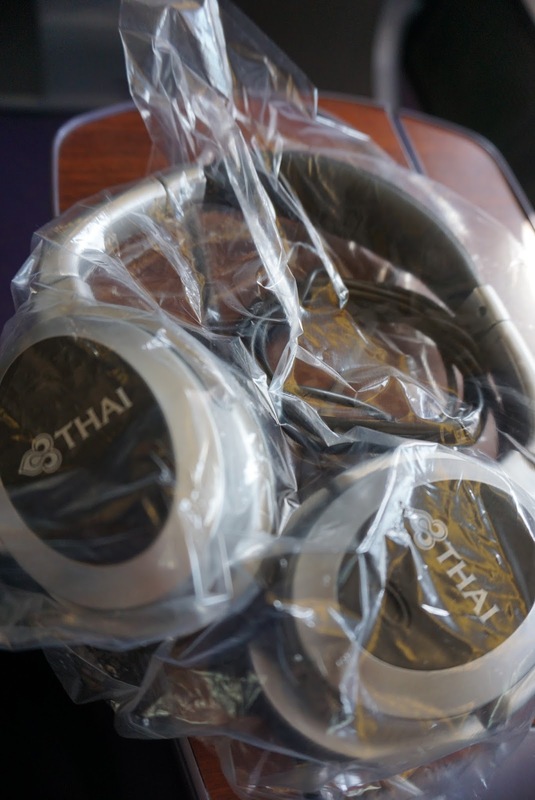 All Business Class passengers were issued with noise cancelling headphones, which are very comfortable when wearing and is very effective in blocking out the noise. 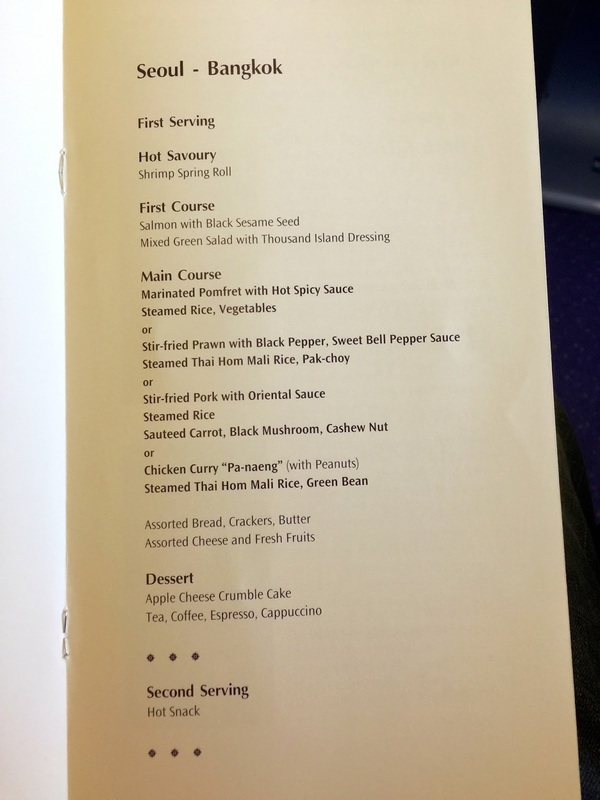 Business Class passengers on Thai Airways were well fed throughout the fight. As soon as I boarded the aircraft, after settling into my seat, flight attendants come around serving pre-departure drinks. 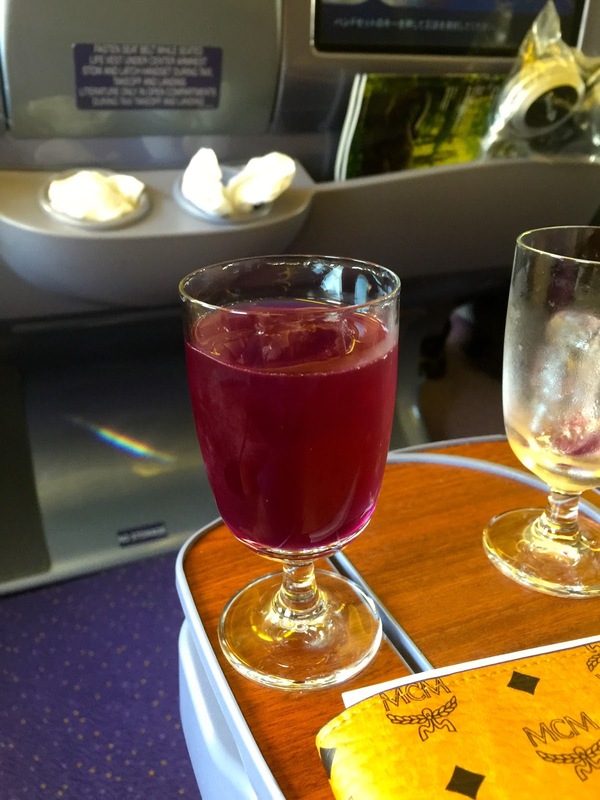 I always go for “Violet Bliss” (butterfly-pea drink) as the pre-departure drink which is very refreshing and is slightly sweet. As this drink was not on the tray that the flight attendants hold when they come to me, I had to request for this drink which the flight attendants served with a smile. As soon as the seatbelt signs were turned off, flight attendants sprung into action to distribute nuts and another round of drinks, while taking order for the first meal. 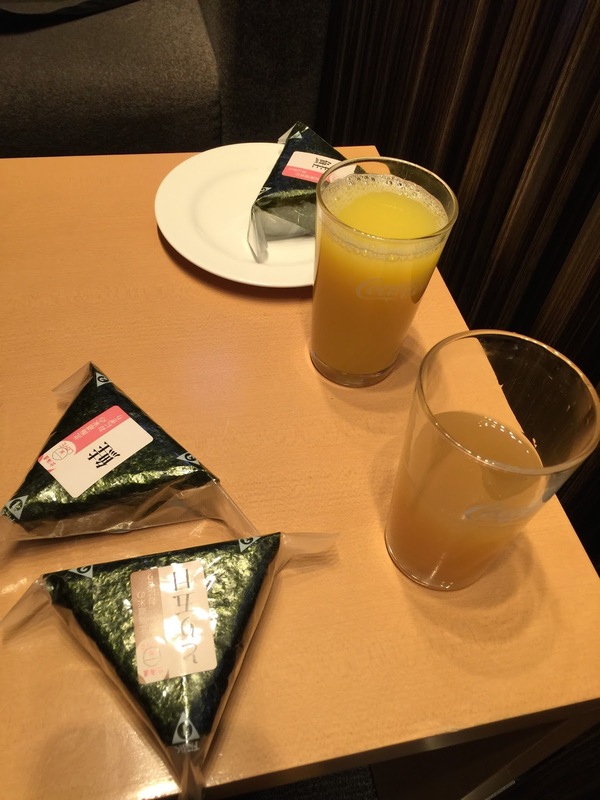 For the first meal, I ordered the Japanese cuisine. As this is a medium haul flight, meals were served course by course in the Business Class cabin. 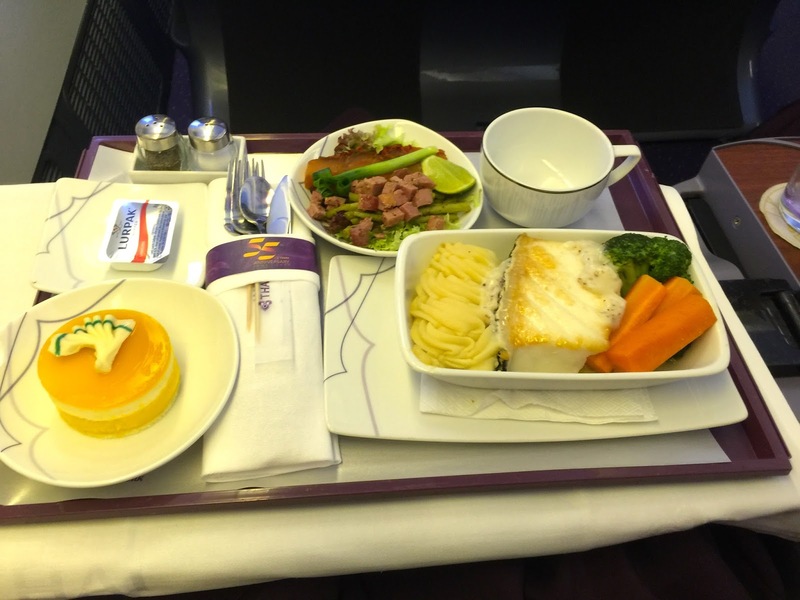 The first meal started with a serving of crab salad and smoked duck as the appetiser presented in Thai Airways china. The crab tasted fresh flavourful and the duck was not too tough. There is even a scallop that is served together with the appetiser. Flight attendants come around with a bread basket for passengers to choose from after the appetiser was served. 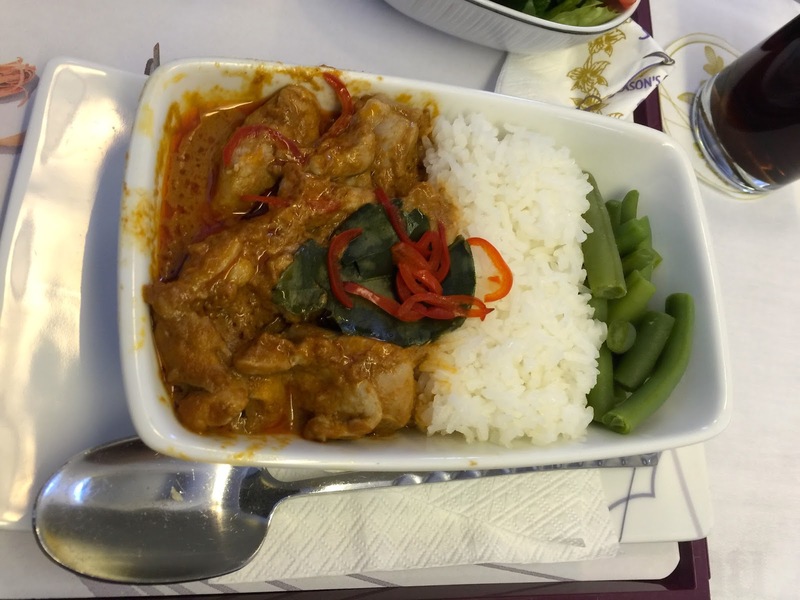 The main course was served after the flight attendants cleared the appetiser. 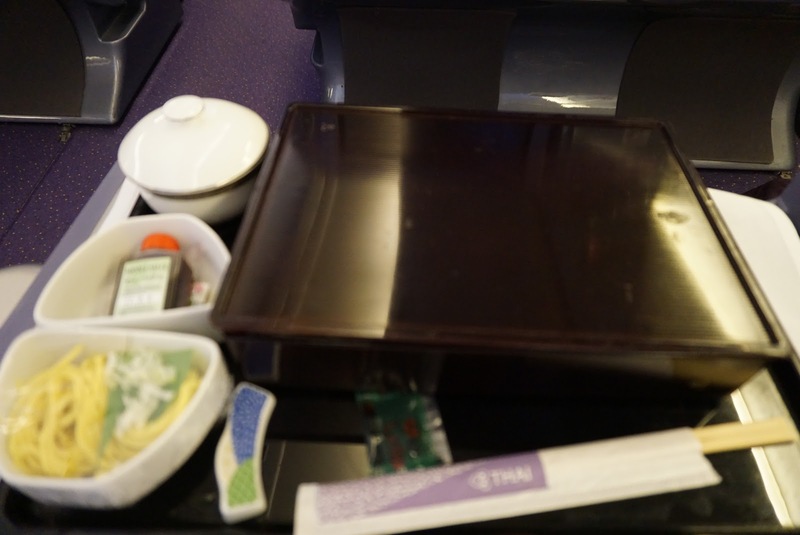 The Japanese Cuisine was served in a silver with purple lining Thai Airways bento container. The bento set contains an assortment of Japanese cold dishes such as cold soba with crab, tamago egg roll with fried salmon, steamed prawn and unagi sushi to name a few. 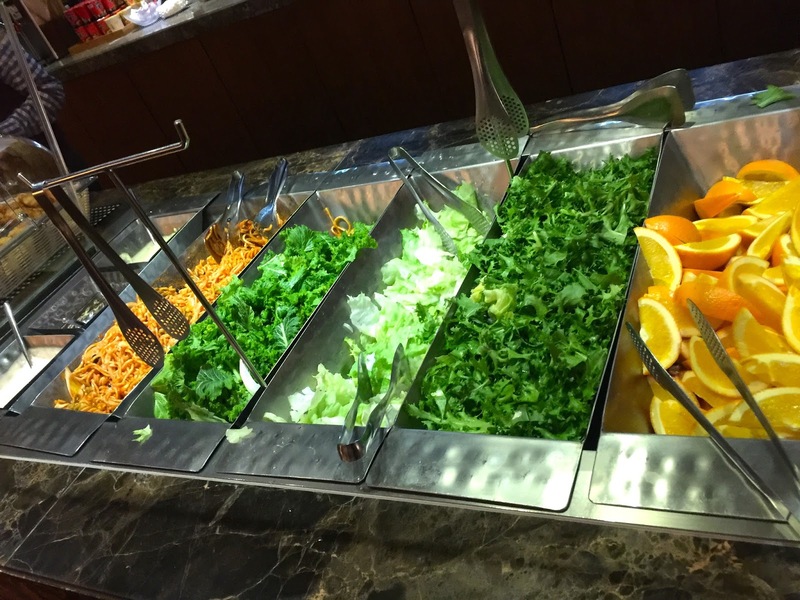 These cold dishes are very fresh and tasty. The meal is served with Japanese rice, miso soup and beef cheek sukiyaki. The beef cheek tasted very tender but I find some parts of the beef to fattening for my liking. But the broth it comes with is very tasty. My friend opted for the pork loin, which presentation wise does not seem appetising but the taste is great and well seasoned. After we are done with the main meal, the flight attendants cleared the table to make way for fruit and cheese as a prelude to the dessert. For dessert, I opted for the Thai milk tea ice-cream which is very refreshing. Tucking into the milk tea ice-cream, I feel as though I am drinking the Thai Ice tea on the streets of Bangkok. 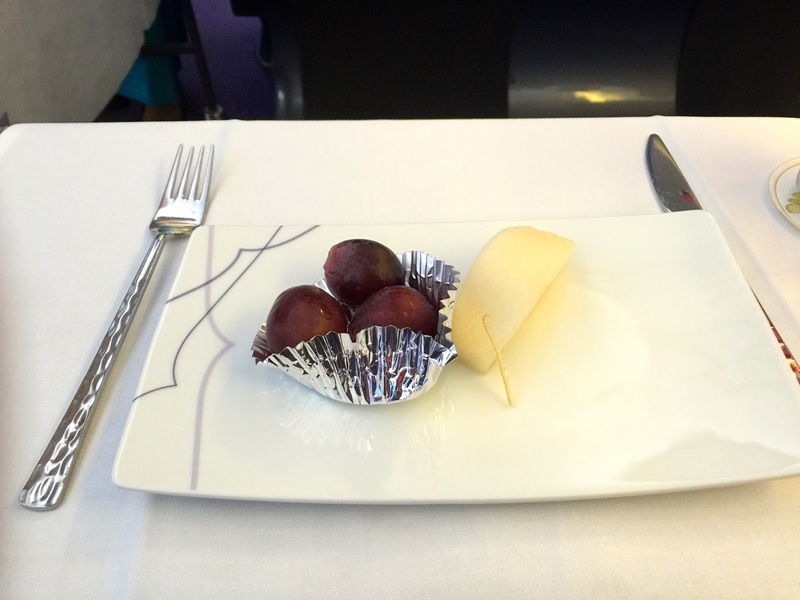 Shortly after the flight attendants served the ice-cream, another attendant placed a piece of chocolate on the table. What a nice touch! The second meal was served 2 hours before landing. For the afternoon tea set, I opted for scone and latte. The scone tasted fluffy and sweet due to the thin layer of sugar glazed onto the scone. However, the scone only comes with jam and does not come with cream. It would be perfect if it comes with cream. 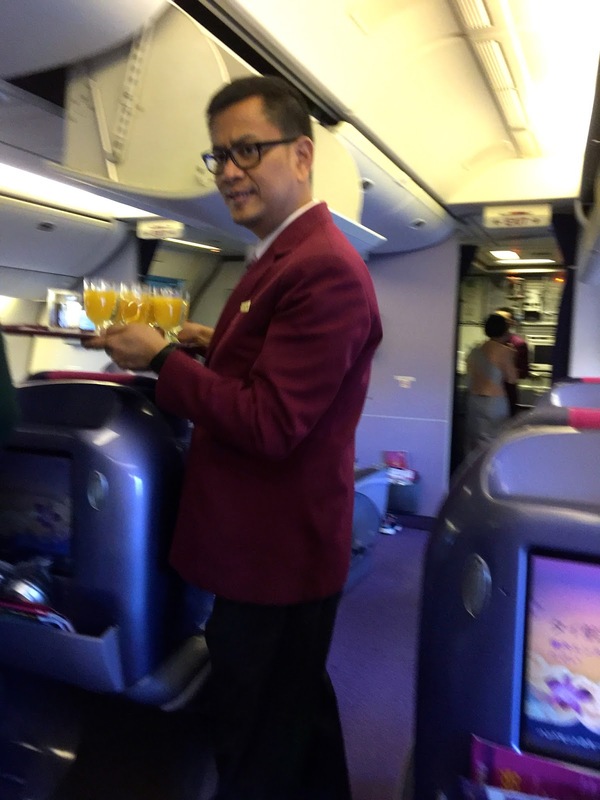 The service I received onboard this Thai Airways flight on Business Class from KIX to BKK is impeccable. 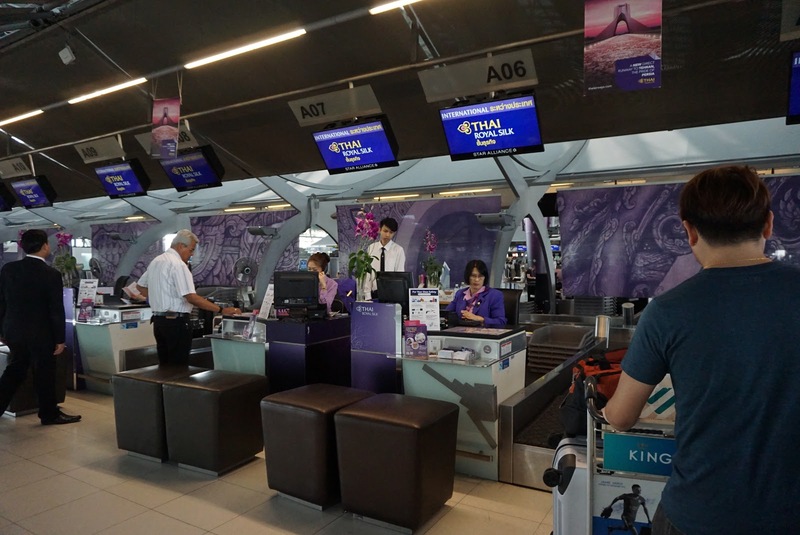 The excellent service started at the check-in counter, where the ground staff representing Thai Airways was very patient with my questions and helped us settled our luggage during check-in. 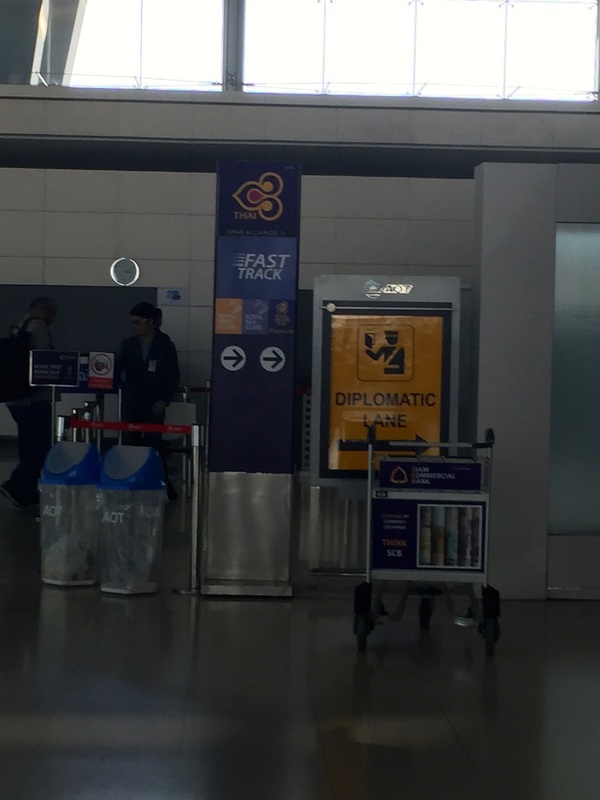 The staff also gave very detailed directions on where the fast lane is and where the lounge is located when our boarding pass is handed over to us. The service in the lounge is very good as well. As soon as we walked into the lounge, we were made to feel welcome with smiles and cheerful greetings. The staff manning the lounge area ensured that the food is replenished on time and tables are cleared promptly. 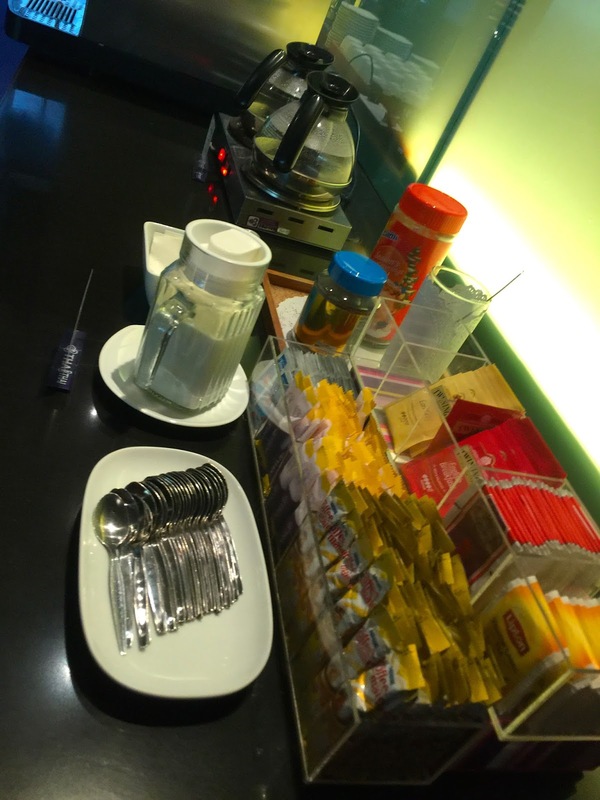 There is this instance that I wanted to get hot water for the instant noodles and informed one of the staff at the lounge that the hot water had run out, the staff immediately apologise (though I think she does not have to do that) and promptly swap out another flask with hot water. She even volunteered to prepare the noodles for me and had it delivered to my table. 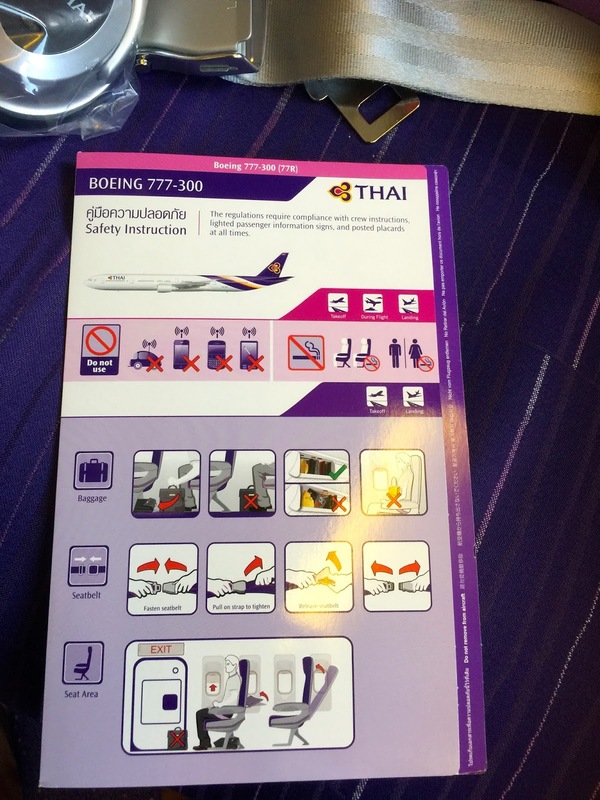 The service onboard is immaculate and is the best service I have received so far flying Thai Airways. The excellent service started when friendly flight attendants received passengers at the door with the Thai Wai and showing us to our seats. 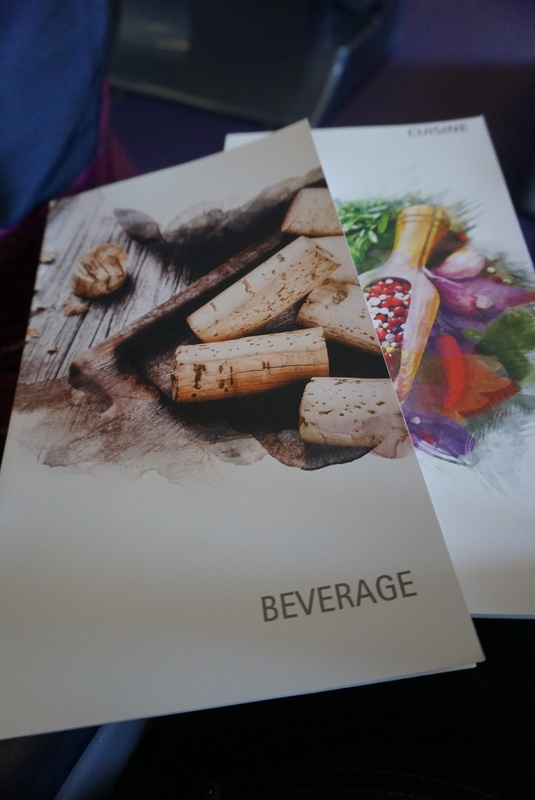 While at our seat, the flight attendant introduced some features of the seat and also where we get find copies of the menu. Despite the drink that I wanted was not on the tray, the flight attendant hastened to get my drink and served with a smile. This is my first time seeing flight attendants going around the cabin introducing themselves to the area of passengers they are serving. During meal service, flight attendants gracefully laid the table and presented the meal of our choice. They seem to be very observant and promptly cleared the plates after we are done with our meal without us having to ask them to do so. The service onboard is very prompt with meals and drinks served in an efficient manner and with grace and smiles throughout. The flight attendant also asked if we are full and wanted more food. Flight attendants are seen patrolling the cabin frequently throughout the flight. 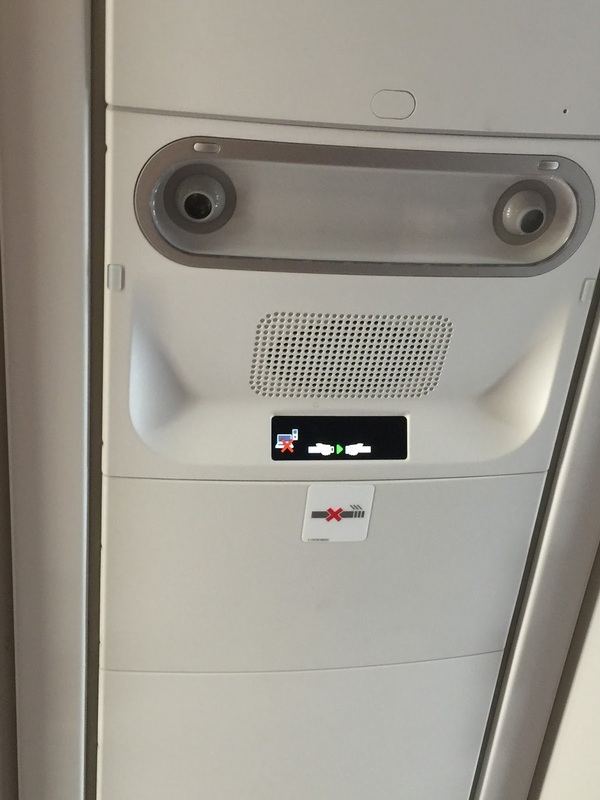 They are also seen wearing their smiles all the time throughout the duration of the flight. 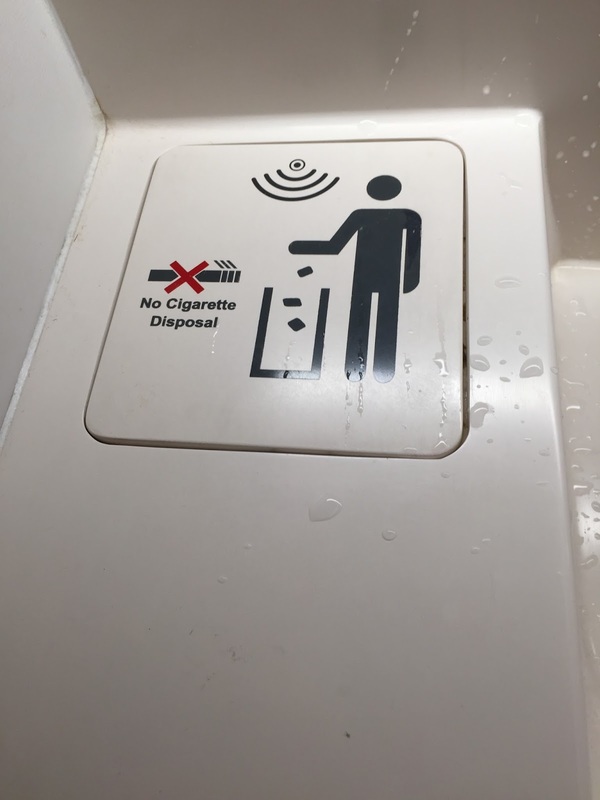 I was pleasantly surprised when the flight attendant went around distributing free wifi access cards, which is a very nice touch in Business Class cabin. 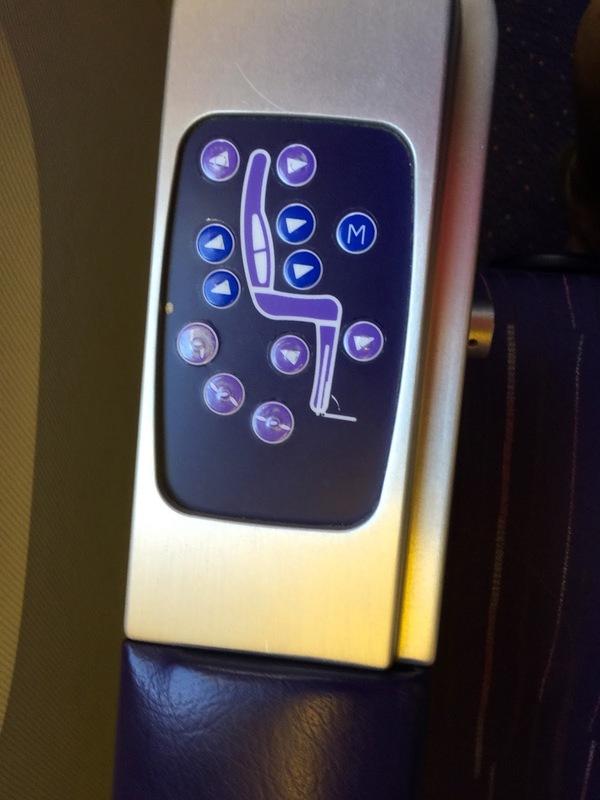 Thai Airways A380 Business Class product is excellent. 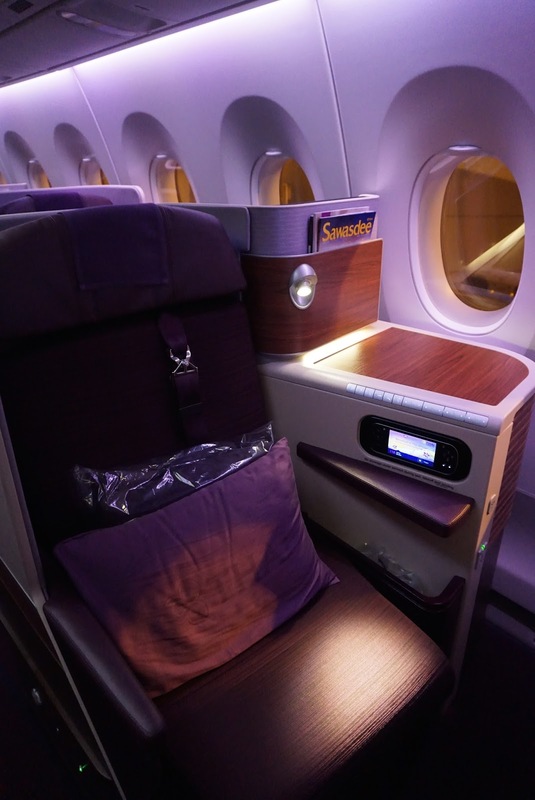 The Business Class cabin exudes a sense of calm and classiness with the purple hues used in the decor of the cabin. The seats are comfortable and the legroom is excellent. 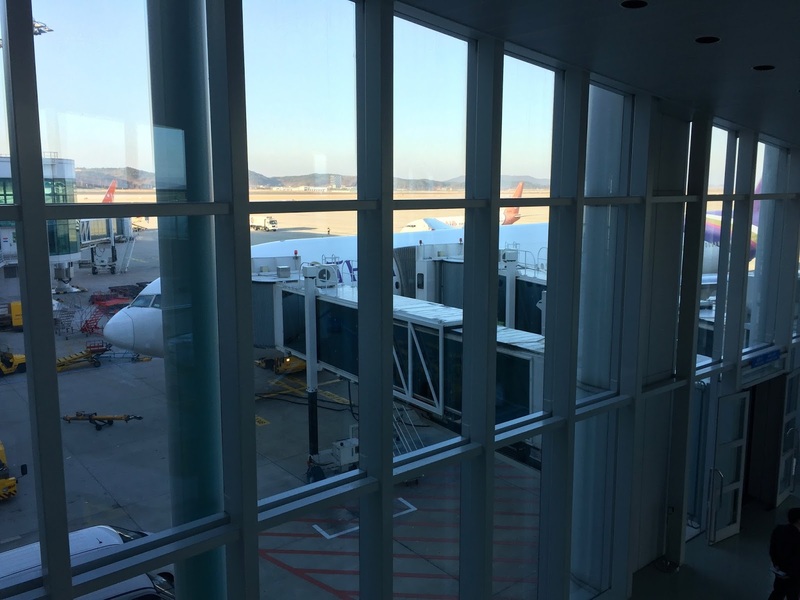 I felt the space in Business Class seat onboard A380 is bigger than that in their newer A350 aircraft, as I did not have to struggle to get in and out of my seat with the tray table deployed. The design of the Business Class seats in A380 is very well thought out, there are storage spaces in the seat for small items and the depth is just right. The IFE system kept me entertained throughout the flight, though my only complaint is that the screen is not viewable when the seat is in flatbed mode. 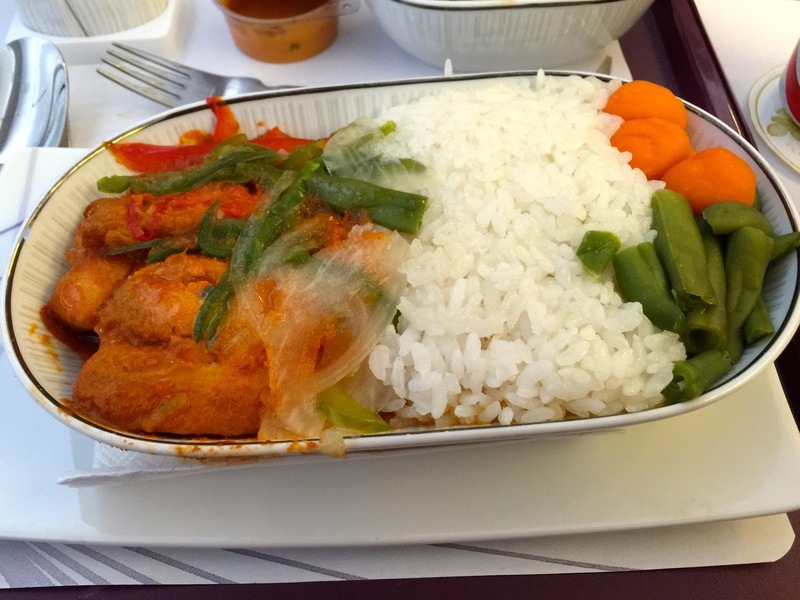 The food served onboard is very flavourful and tasty. Meals are served course by course, making me feel as though I am dining in a restaurant. 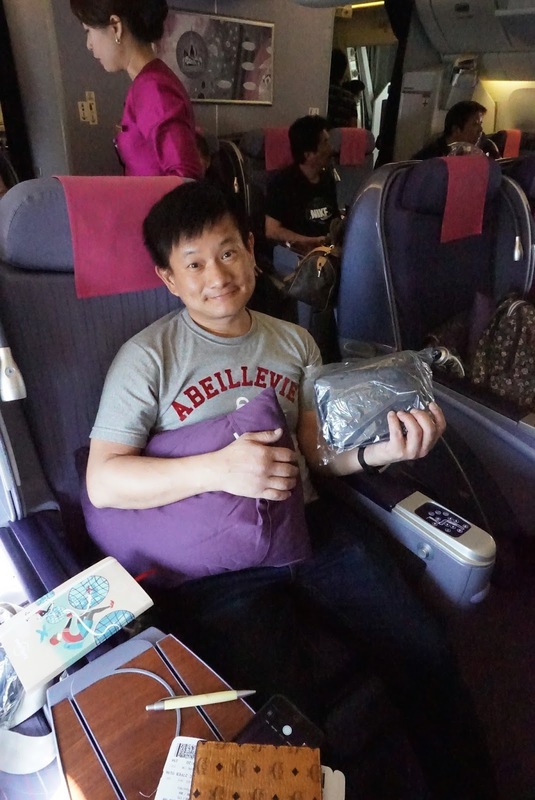 The best impression of flying Thai Airways Business Class is the service. The flight attendants took pride in their work and ensured all passengers are well taken care of during the flight time. They are seen wearing their smiles all the time and are very prompt to respond to passengers’ requests. Flying with this excellent set of crew onboard Thai Airways, I felt welcomed and the warmth that the Thais are renowned for. 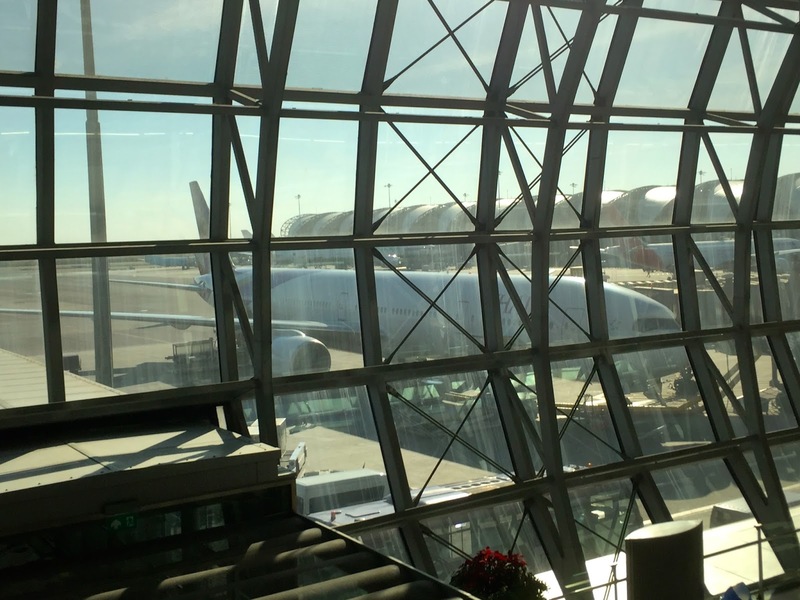 Overall, this experience flying with Thai Airways onboard their A380 Business Class cabin is a very pleasant experience. 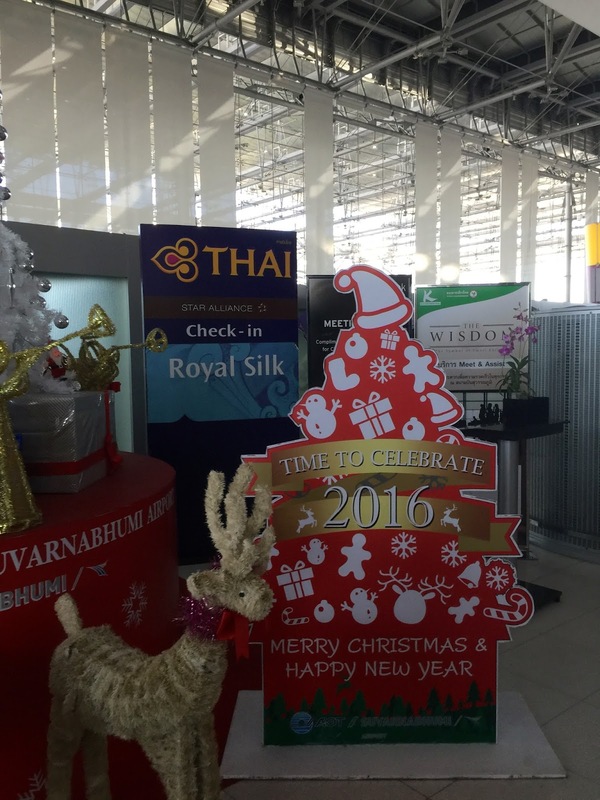 The previous flight arrived at Bangkok Suvarnabhumi Airport on time and was parked on the tarmac. 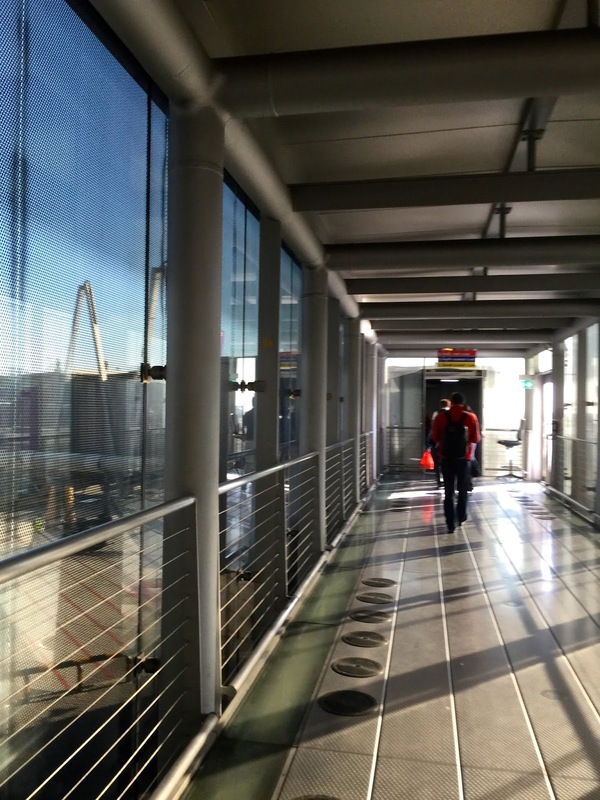 Instead of entering the airport terminal from the aerobridge, we were brought to the terminal by the airport bus. 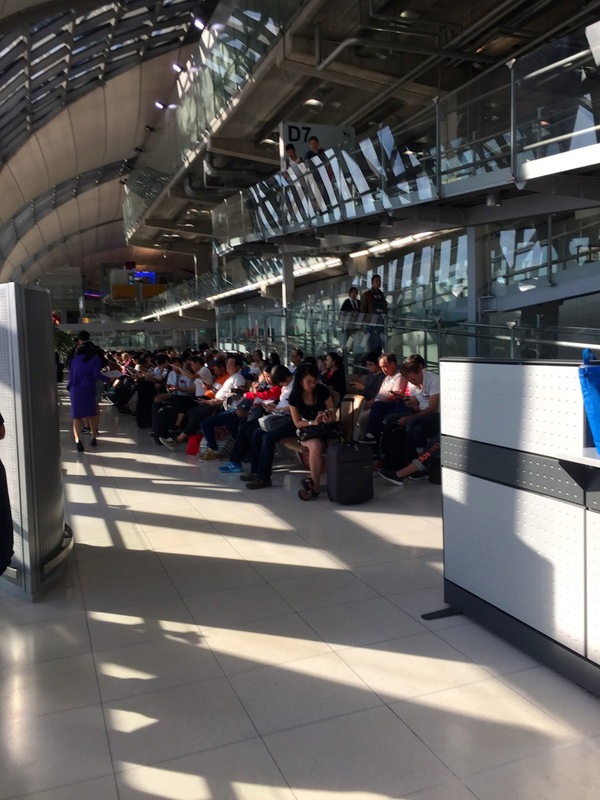 It seems that Thai Airways only catered 1 bus to transfer a full load of passengers to the terminal, as such instead of having 1½ hour transit time, I only had 20 mins to rush to the next departing gate. 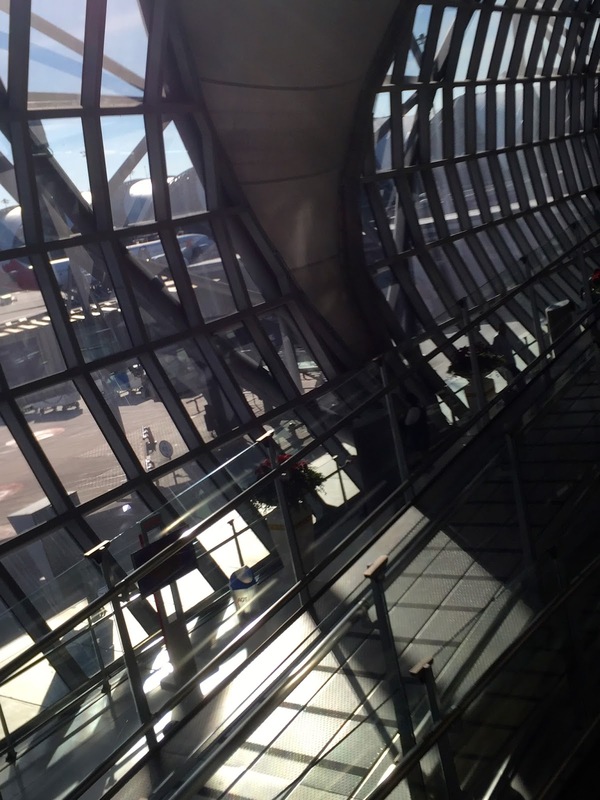 Suvarnabhumi Airport is quite big which means I had to run to the boarding gate. By the time I reached the gate, it is about to close. 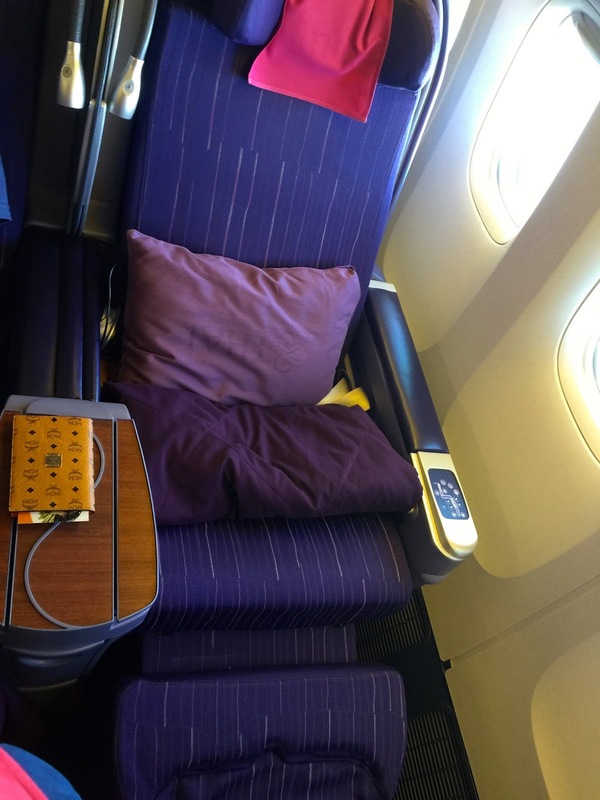 The seats in Economy Class Cabin onboard Thai Airways A380 is decked with the familiar vibrant colourful seats with hues of purple, orange and yellow. This colour scheme makes the cabin look cheerful and certainly brightens the mood of holidaymakers. 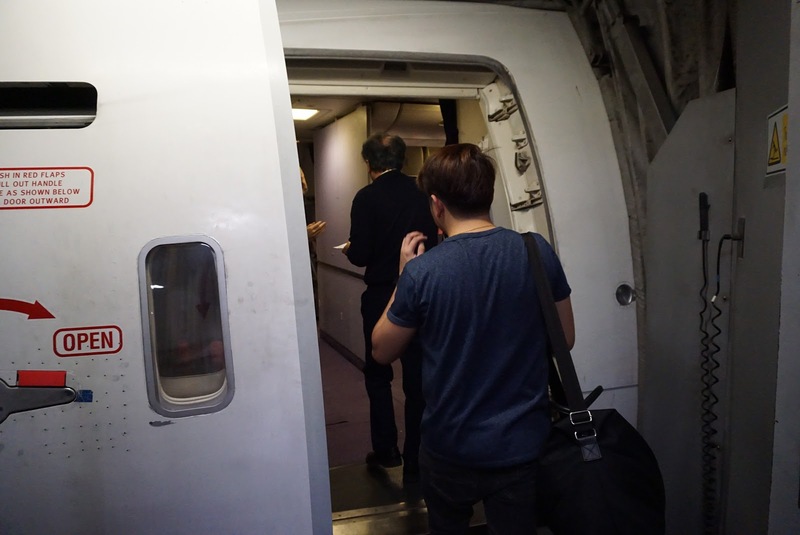 There are a total of 435 seats in the Economy Class Cabin. 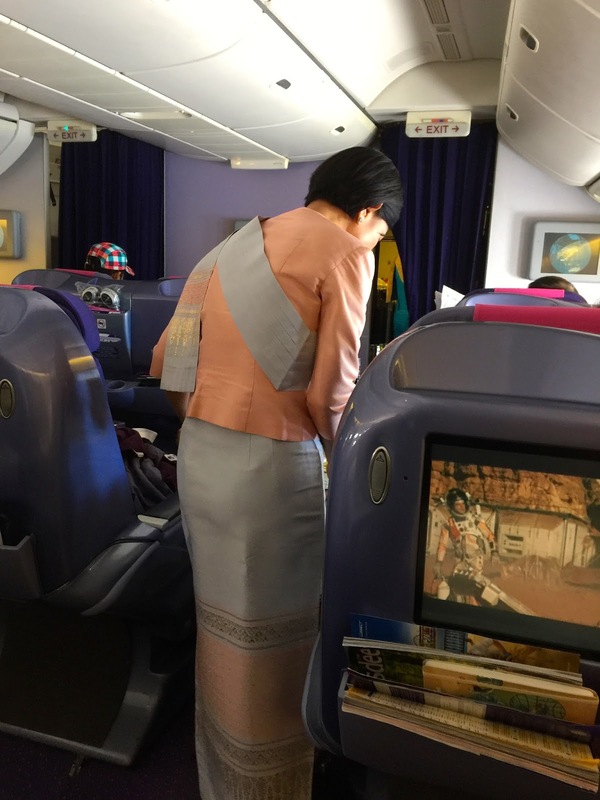 The main bulk of the Economy Class Cabin onboard Thai Airways A380 occupies the lower deck of the aircraft, with 361 seats split into 3 sections spreading across the entire lower deck. 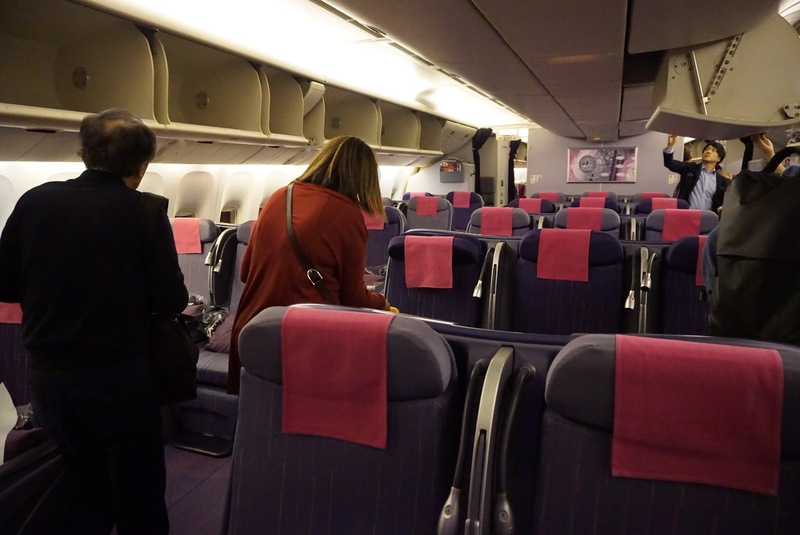 There are 74 seats at the rear of the upper deck, just behind the Business Class seats. The Economy Class seats are reserved for higher paying travellers in this class, passengers travelling on promotional prices are not able to select these upper deck seats until the internet check-in opens up (which is 24 hours prior to departure). As the seats on the upper deck are full at the time I checked-in online, I was only able to get the seats on the lower deck. There are numerous lavatories spread across the entire lower deck. 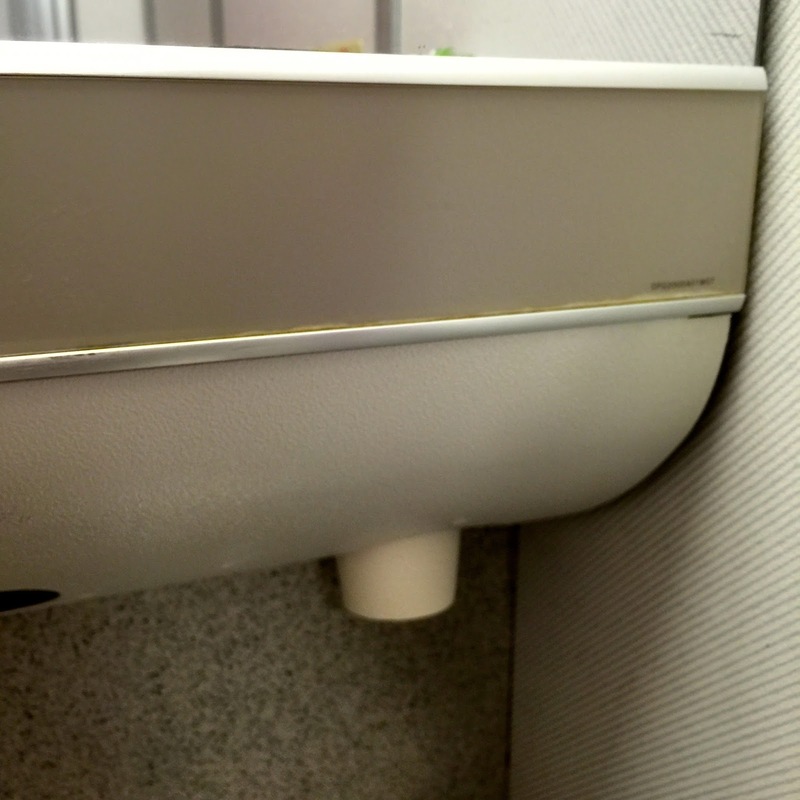 The lavatories are rather small compared to some other airlines such as Singapore Airlines. However, they sufficiently serve the purpose they are meant for. 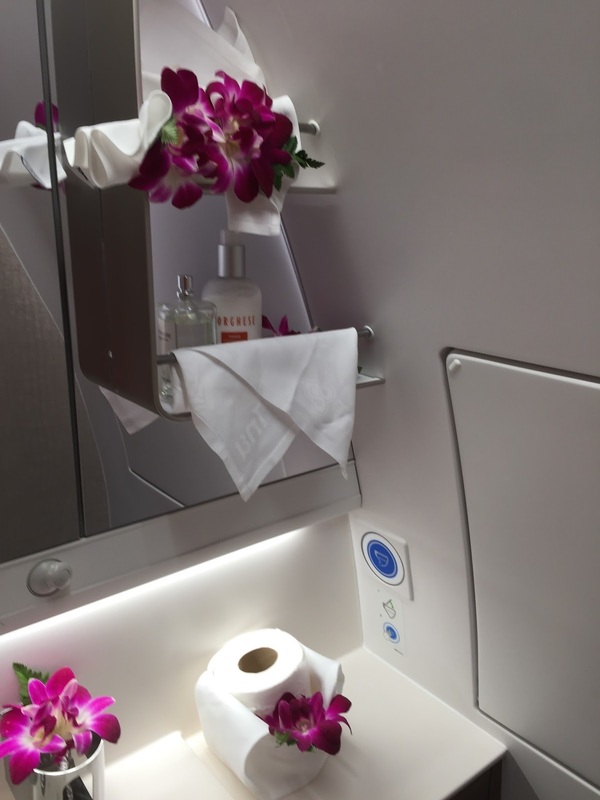 The lavatories are decked out in white colour, with the signature Thai Airways light purple coloured on the cabinets below the sink. The clever use of white lights makes the lavatory looked clean and bright and does not give one a claustrophobic feel. As with most Thai Airways aircraft, the tap is sensor activated which makes it both convenient and hygienic for passengers. 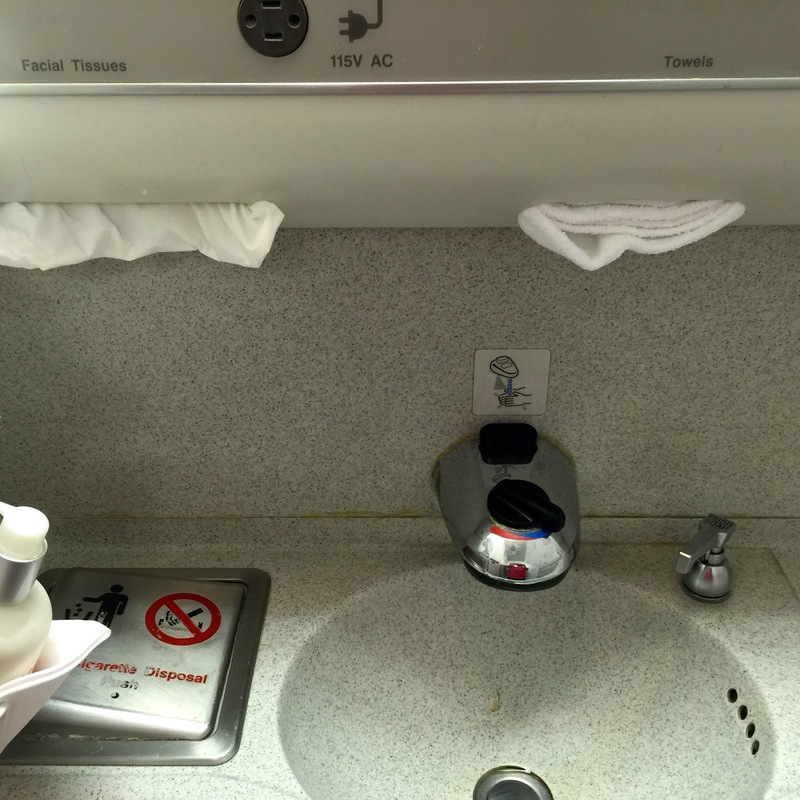 The amenities in the lavatory is limited to hand soap and cologne on top of the tissues and paper cups. Passengers flying on red-eye flights (as with this flight I flew on) have to bring their own toothbrush and toothpaste to freshen up. 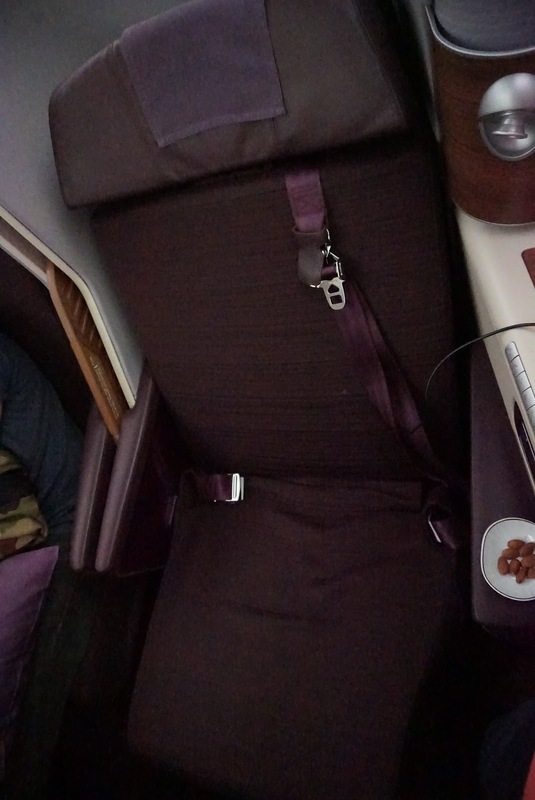 Unlike some other airlines, Thai Airways do not distribute amenities pack for overnight flights. 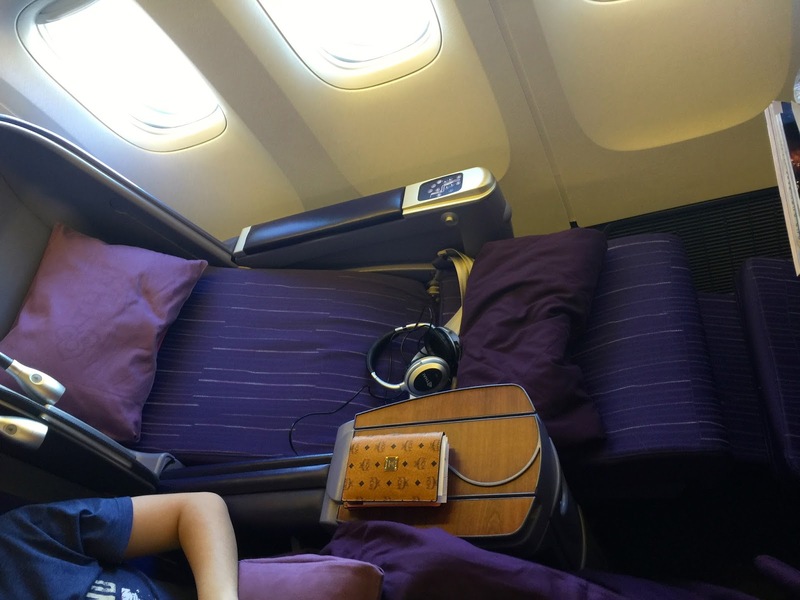 The seats in the Economy Class Cabin onboard Thai Airways A380 is very comfortable. Each seat has a 32″ pitch and 18″ width. The legroom on these seats are very good, I had ample legroom in the Economy Class seat that enabled me to snooze throughout the flight. 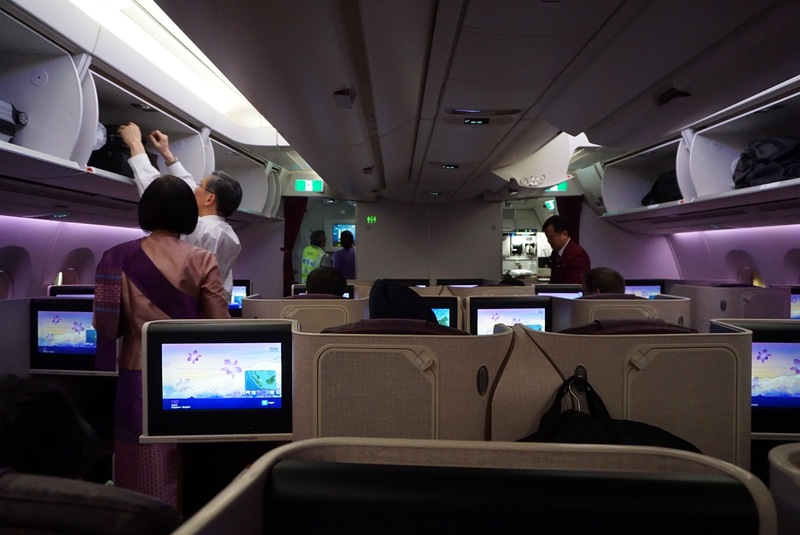 The Economy Class seats onboard Thai Airways A380 are arranged in a 4-3-4 configuration on the lower deck, and 2-4-2 on the upper deck. 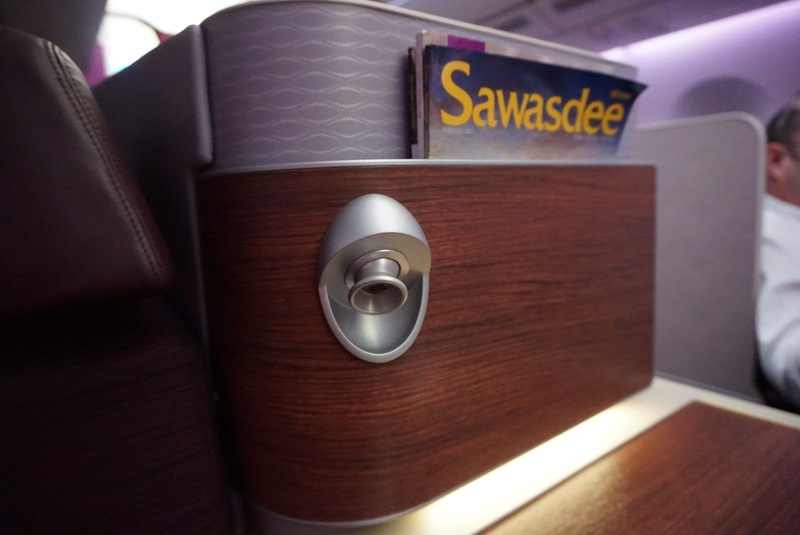 I like the design of the tray tables on the newer Thai Airways aircraft, which features a bi-fold design that is capable of folding away half of the tray table when passengers do not need to use the full table. 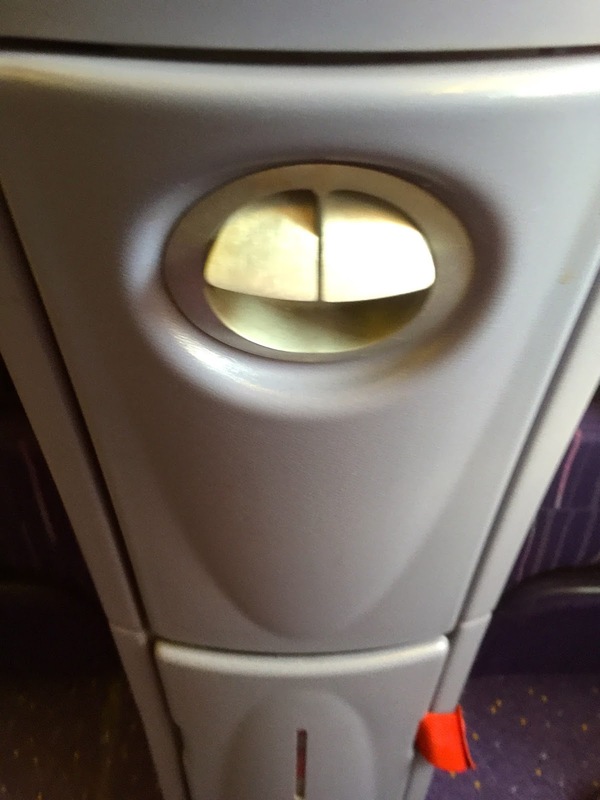 This allows passengers sitting in the inner seats to gain access to the aisle without the need to put away the table. There is a leg rest on each seat in the Economy Class, however, I do find these leg rests to be a tad too uncomfortable when resting my foot on them. 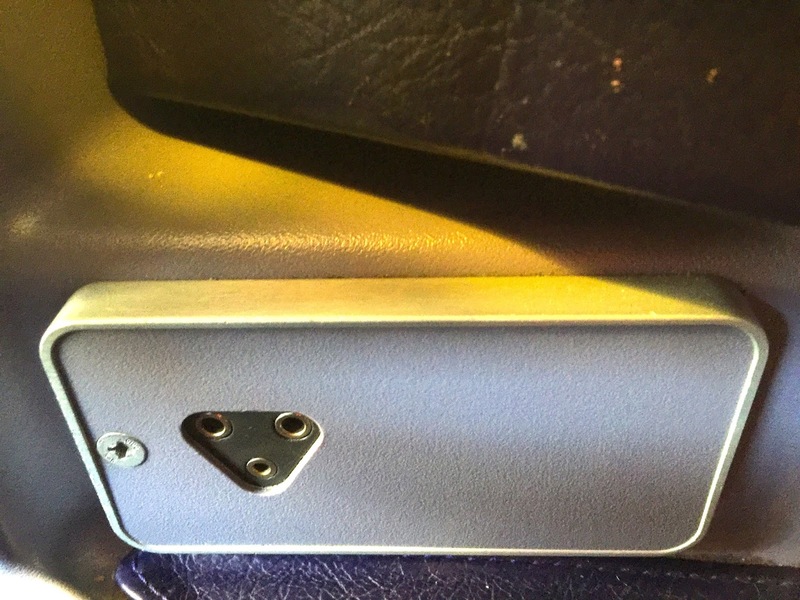 The headphone jack and the seat recline button on these seats are found on the left armrest. Seats can be reclined sufficiently that provided me with a comfortable rest on this red-eye flight. 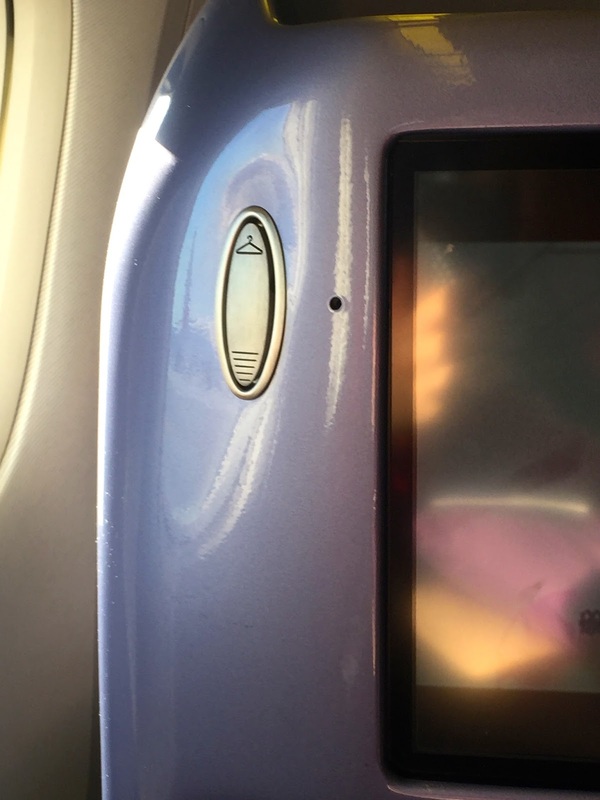 Each Economy Class seat onboard Thai Airways A380 comes with a USB outlet that serves as a charging port located on the bottom left side of the TV screen, and a hook on the bottom right side of the screen. The seat pockets, where in-flight magazines are provided in each seat as well as the aircraft safety card, are rather deep (and capable of storing my camera). I like the idea of including a small seat pocket in front of the main seat pocket which I used to put my mobile phone in. Thai Airways has a very good in-flight entertainment system. All Economy Class seats onboard the A380 comes with a 10.6″ touchscreen TV which can be tilted to suit the sitting position and the degree of reclined on these seats. The touchscreen function is very responsive and does not seem to lag when I used it. 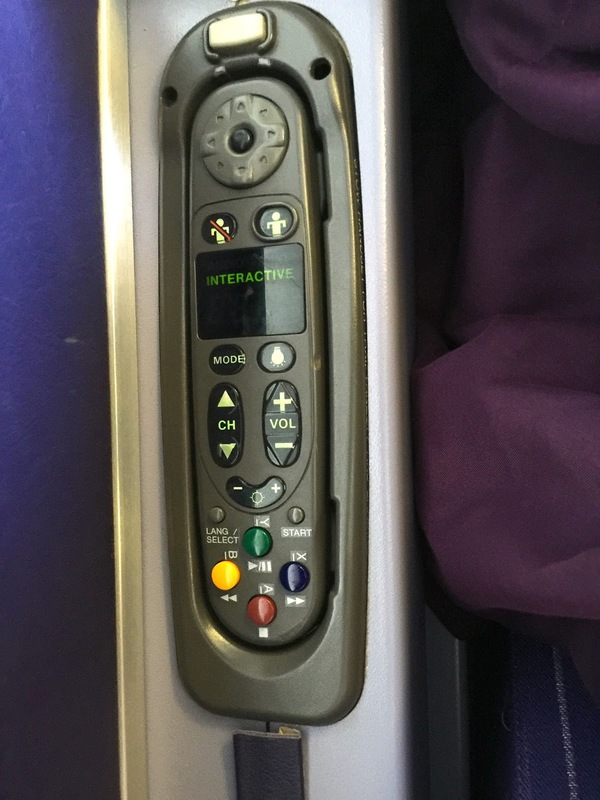 The In-flight entertainment system can also be controlled via the remote controller located at the bottom of the TV screen. At the time of boarding, headphones are already placed on each seat, though these headphones are not noise cancelling. The in-flight entertainment system is loaded with movies ranging from the latest Hollywood Blockbuster to Thai movies and short TV series that kept me entertained when I was not sleeping on the flight. The entertainment system is arranged in an intuitive manner that makes scrolling through and looking for a movie to watch easy. There are games that are loaded in the in-flight entertainment system, though I find these games to be a tad boring. 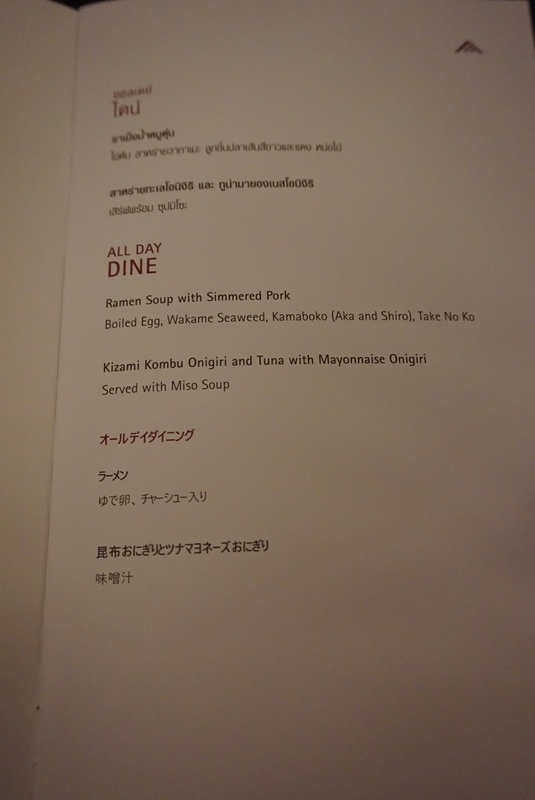 2 meals are served on this flight from Bangkok to Kansai. As soon as the seat belt signs are turned off, flight attendants disappear into the galley. Moments later, they were seen going around the cabin distributing a bag with the print “Any Time Treats”. This bag contains a ham and cheese sandwich and a bottle of water. I thought to distribute this bag of treats a very nice gesture on the part of Thai Airways. By doing so, passengers have ensured an undisturbed sleep on this red-eye flight and at the same time, allowing passengers to have something to eat when they wake up or whenever they choose to consume the sandwich. On top of the bag of sandwich, flight attendants were also seen going around the cabin serving drinks to passengers. Flight attendants were also seen patrolling the cabin in the night serving passengers who are not asleep drinks. 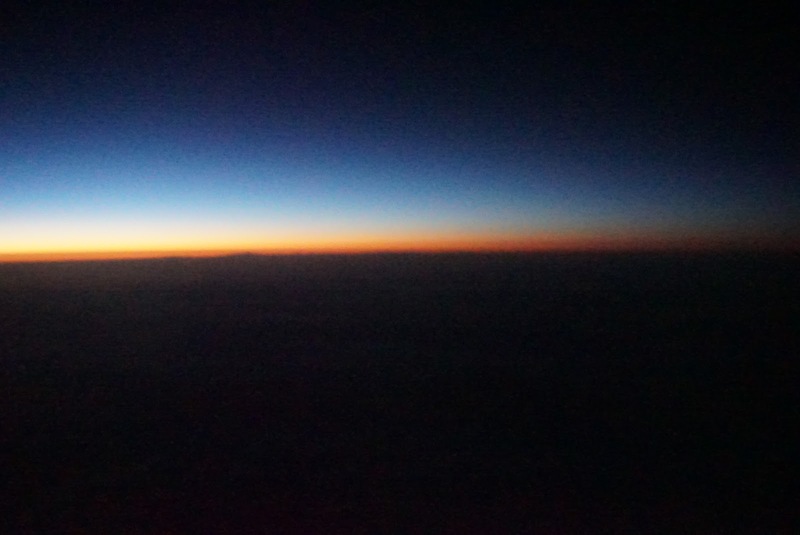 About 2 hours before landing, the Economy Class cabin lights were turned on for breakfast service. For breakfast, I opted for the pork with rice that comes with fruit salad, yoghurt and a cup of orange juice. 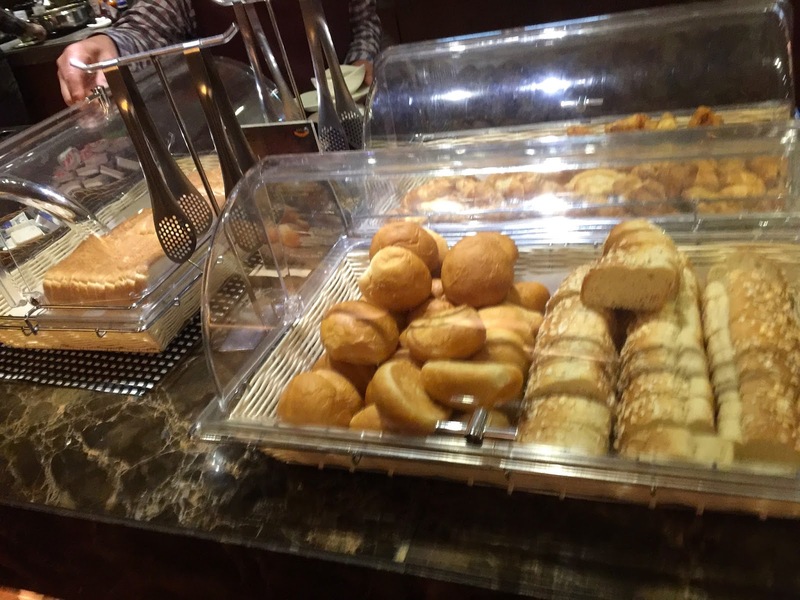 Croissants are also distributed with the breakfast. The flight attendant gladly gave me 2 croissants upon my request. Shortly after the meal service, flight attendants went around the cabin distributing drinks and coffee and tea followed the drinks service. The pork I opted for is very tasty, and flavourful especially the gravy it is soaked in. 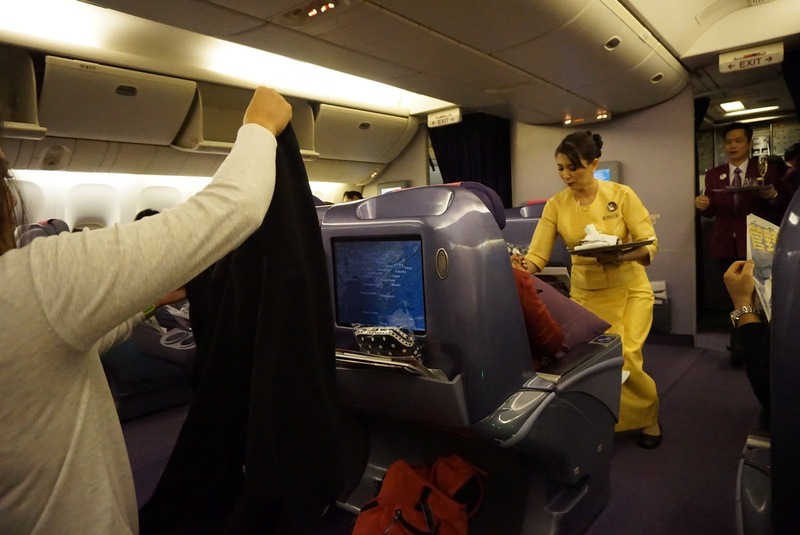 Service is excellent onboard Thai Airways A380 Economy Class cabin. The service started as soon as I stepped onboard the aircraft to be welcomed by the flight attendants with the traditional Thai hand gesture. Flight attendants were placed throughout the cabin during boarding guiding passengers to their seats. The flight attendants sprung into action as soon as the seatbelt signs were turned off to prepare for meals. The flight attendants were efficient in preparing the meal and in their meal service and which ensured that passengers get their food without having to wait too long. 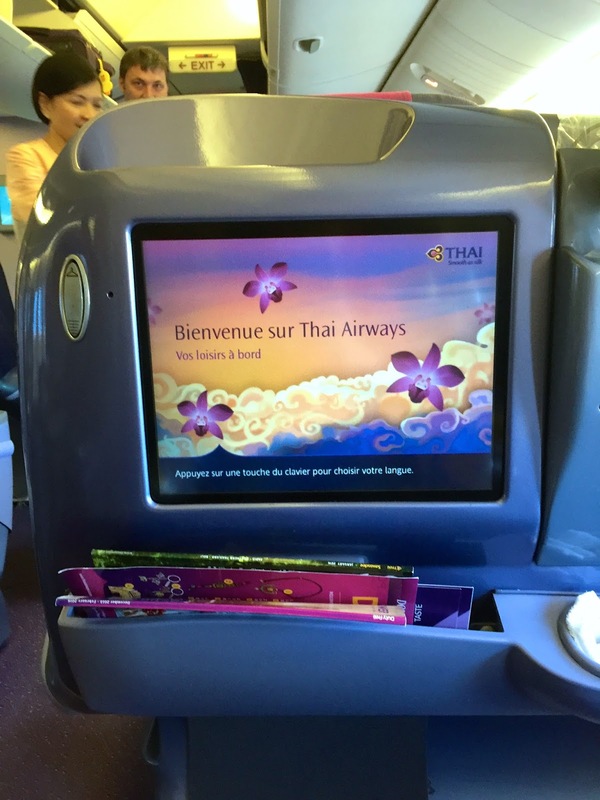 Service is always presented with a smile, that made flying with Thai Airways enjoyable. Flight attendants were seen patrolling the cabin constantly to answer to requests from passengers and to clear away trash. 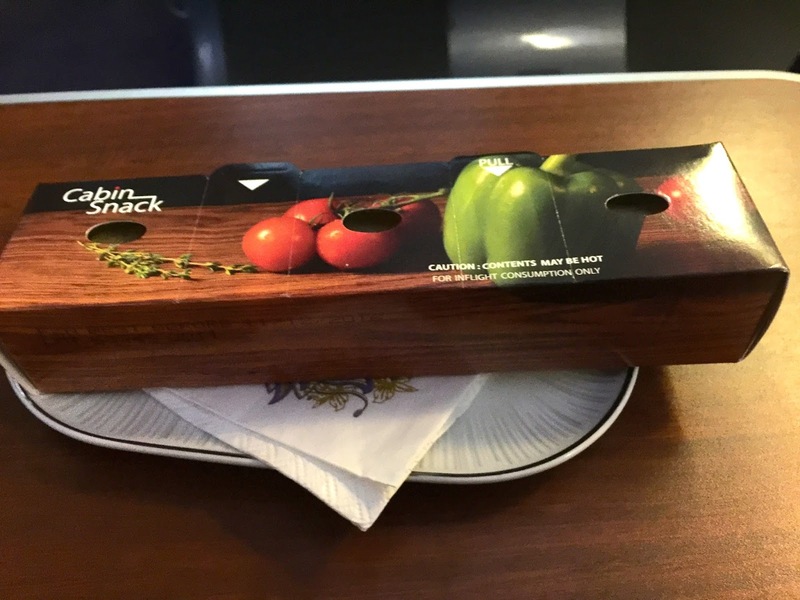 Meal trays were collected efficiently after passengers had their meals and flight attendants would return to passengers to check if they would like any drinks. Throughout the flight time, I was made to feel well-taken care off by the flight attendants. 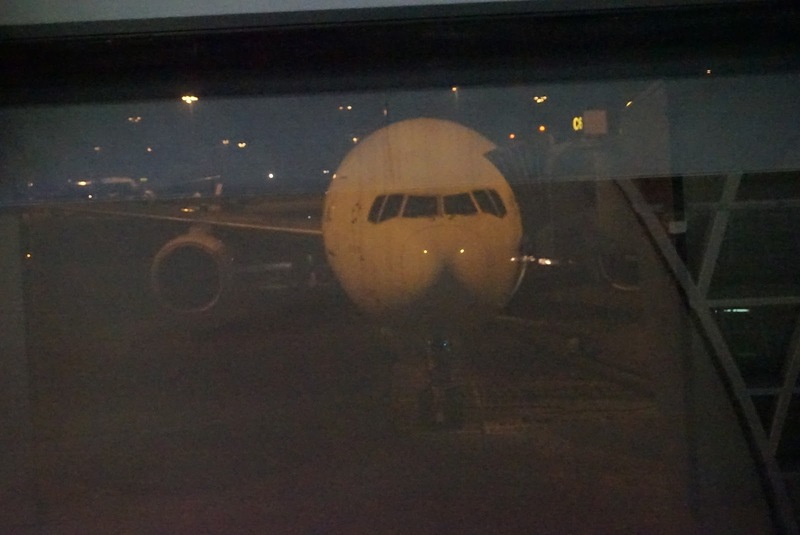 This is my first time flying A380, the aircraft is very comfortable in the Economy Class. Legroom was fantastic and I did not feel cramp in my seat. The seat is comfortable and I had a good rest on this red-eye flight. The IFE onboard is very well organised, making scrolling through to select movies very easy. The IFE is well stocked with movies and games that kept me entertained when I was not sleeping. 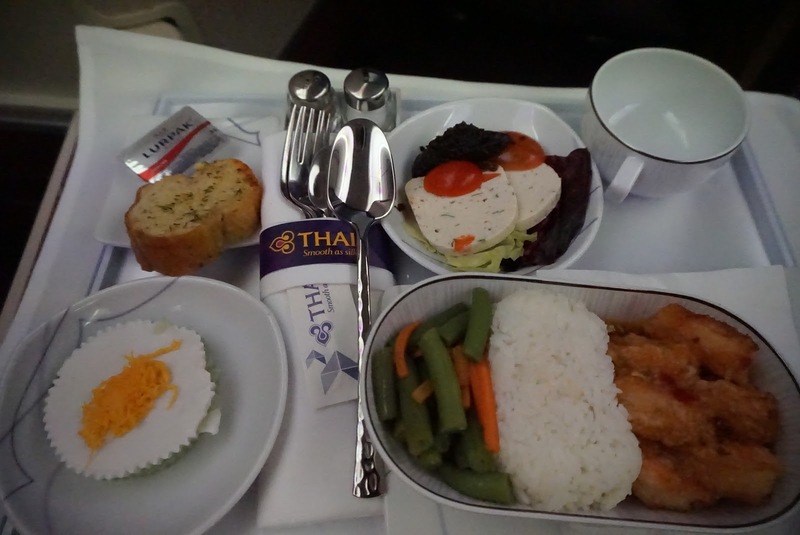 Service is very good onboard with flight attendants displaying the warm hospitality that the Thais are renowned for. 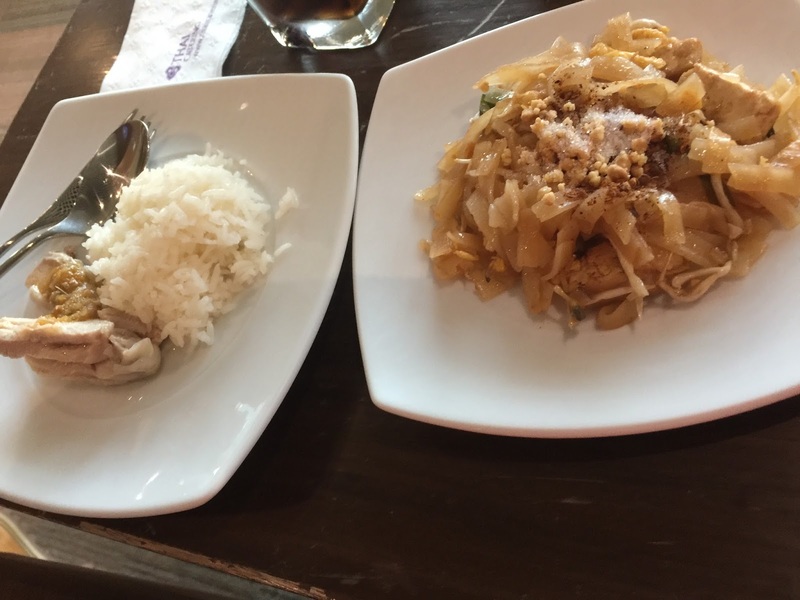 Meals are very delicious and flavourful and the pork does not taste dry. I like the idea of giving out “Any Time Treats”, which ensured that passengers do not feel hungry despite in the middle of the night. 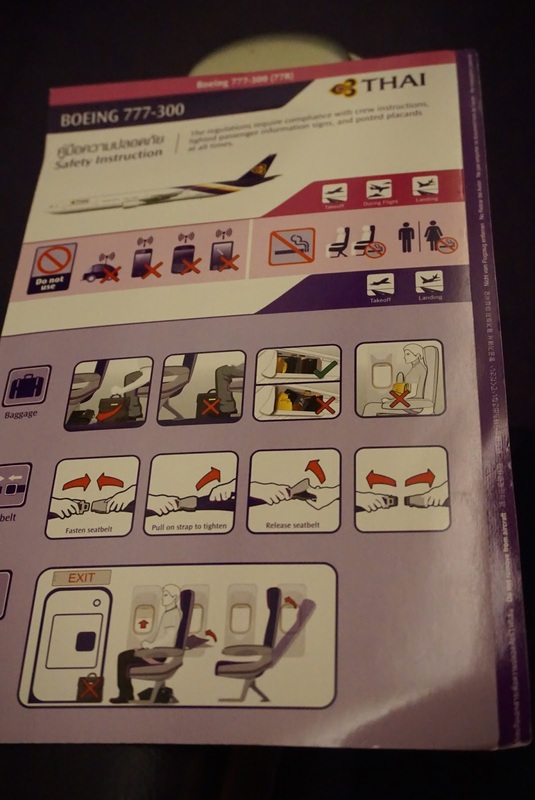 I had an enjoyable time flying on Thai Airways A380 in the Economy Class cabin from Bangkok to Kansai. Thai Airways departs from Terminal 1 in Singapore Changi Airport. 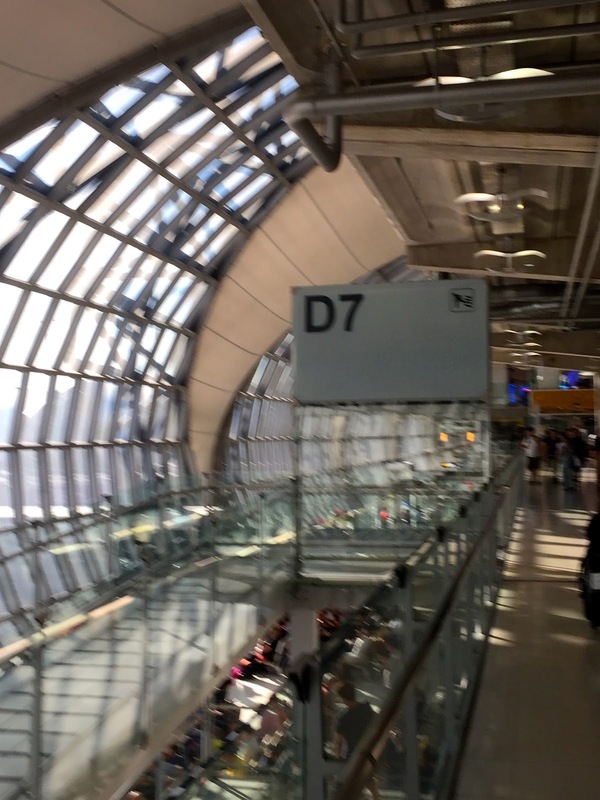 Their check-in counters are located on Row 5, located in the middle of the terminal. 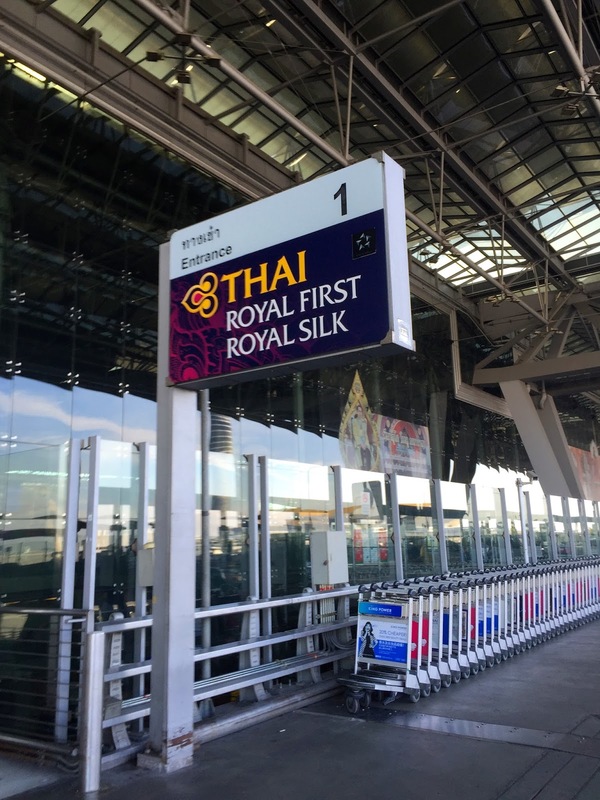 As with most airlines, Thai Airways offer internet check-in, which I highly recommend travellers to complete before heading to the airport. Not only will one be able to select the seats that one wants, it also cut short the time that one will stand in the queue. There is hardly a queue at the internet check-in counters, which I only spent 3 mins waiting for my turn. 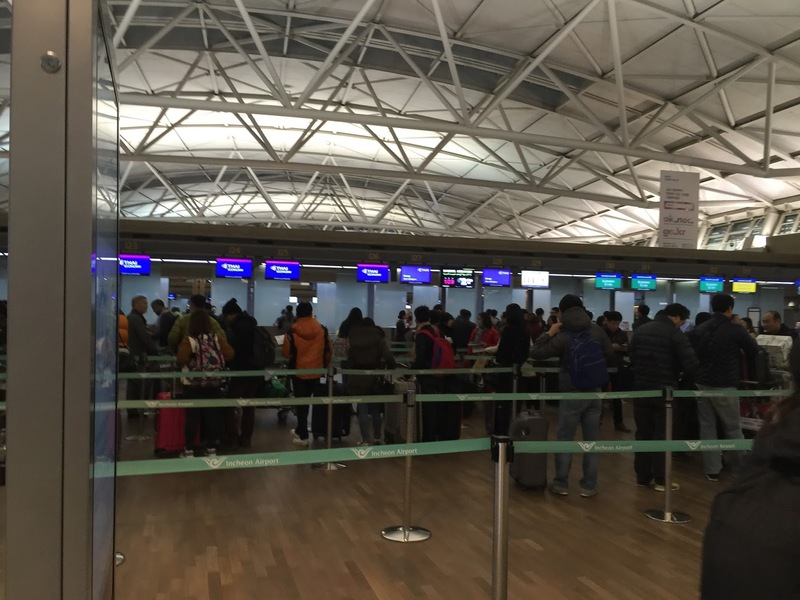 The “regular” check-in counter has a significantly longer queue. The ground staff handling our check-in is very friendly and efficient. 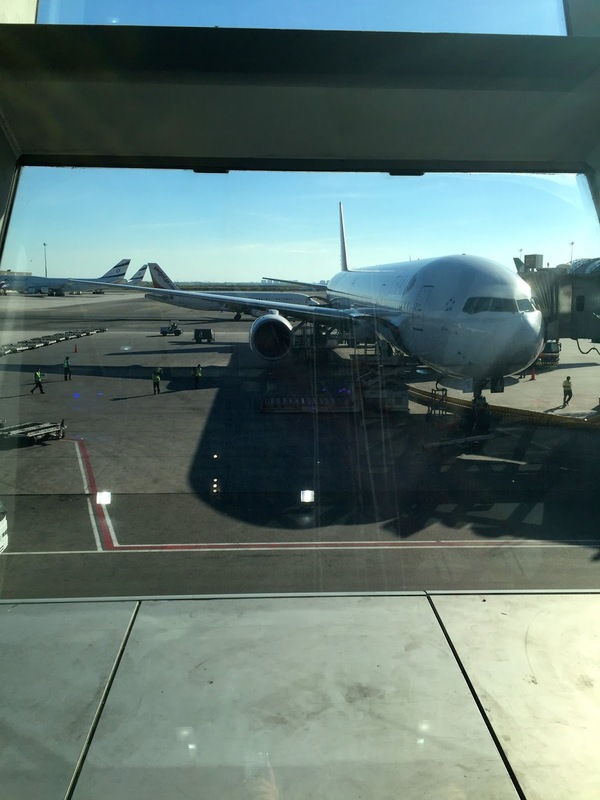 Within mere minutes, our luggage is sitting on the conveyor belt heading for the aircraft. 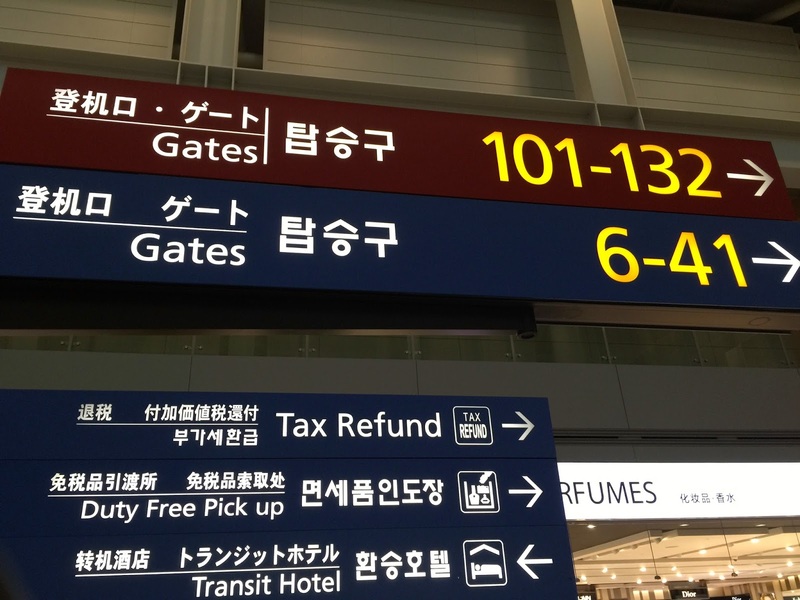 The staff also reminded us of the boarding timing and the gate number when she hands our boarding pass to us. 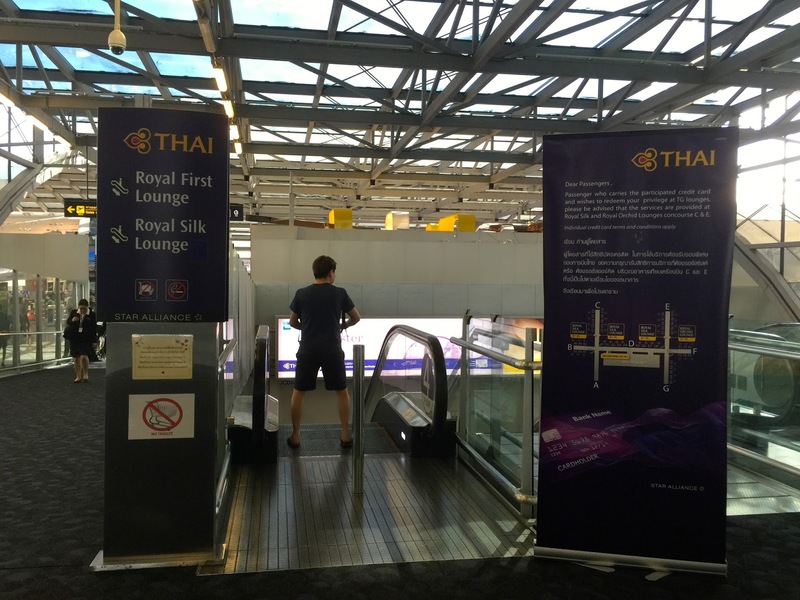 Thai Airways departs at gate C24, which is towards the end of the pier. 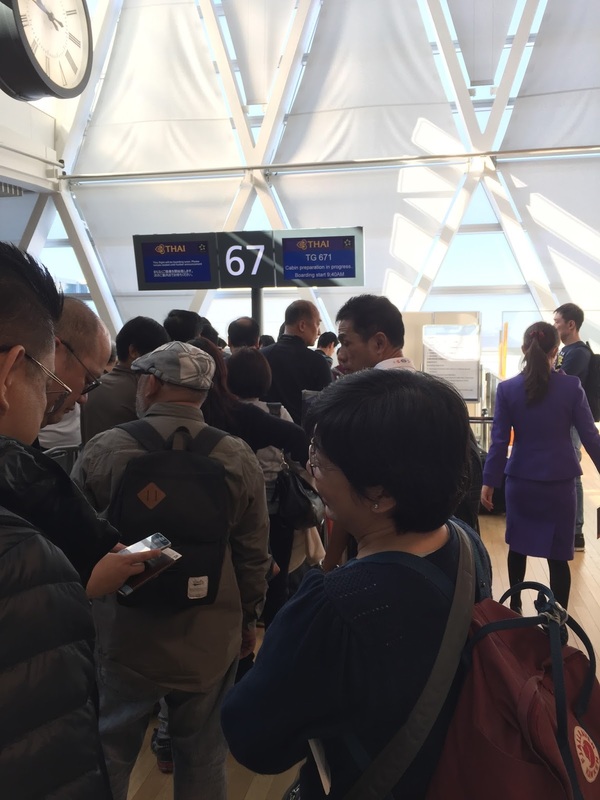 As Singapore-Bangkok flight is always full, do go to the gate early for a secondary security check. 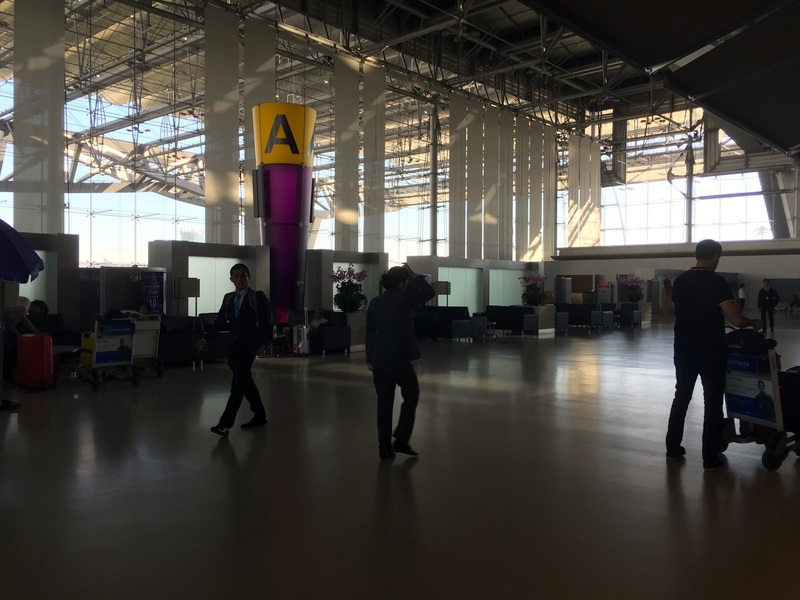 By the time we arrived at the gate, most of the passengers have completed their secondary security checks and are waiting in the waiting area. 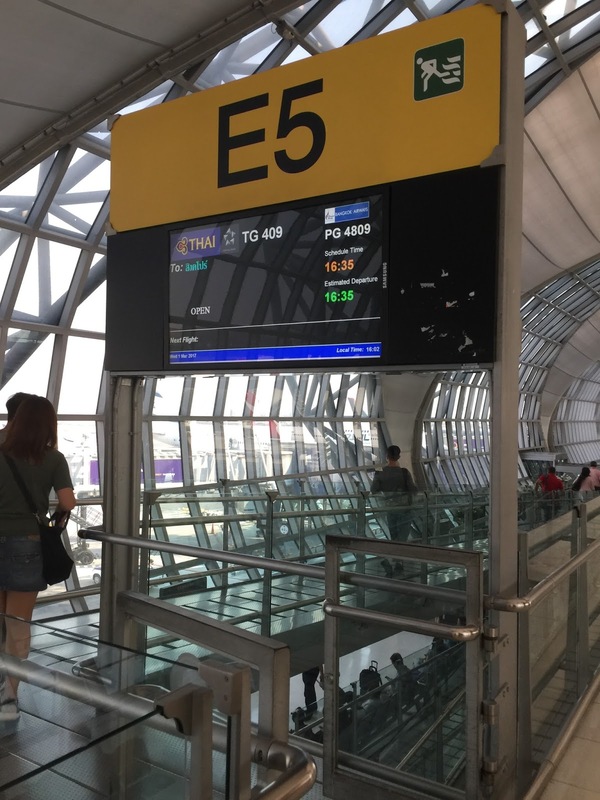 Other than boarding by rows and class, Thai Airways also gave priority boarding for passengers travelling with elderly and children. Thai Airways flew this Singapore-Bangkok leg with their newest additions of the A350-900 fleet. The 289 seats Economy Class cabin is segregated into 2 sections, with the forward section accommodating 159 passengers and the rear section having 150 seats. 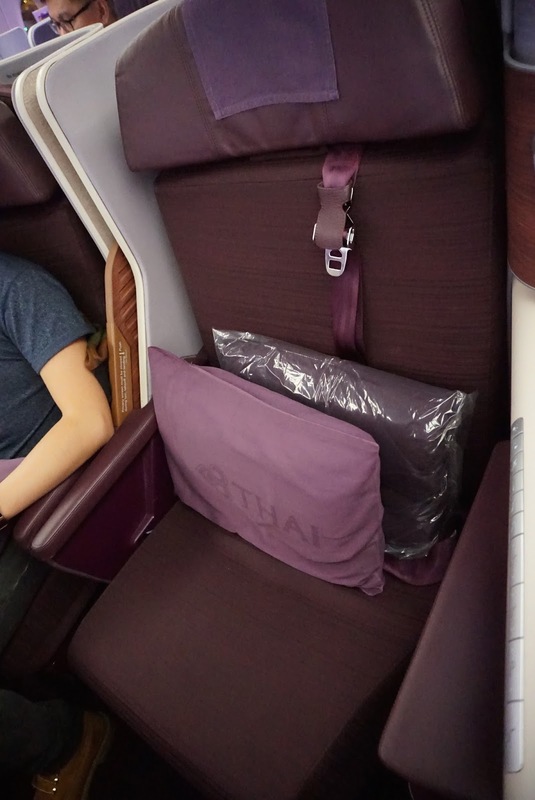 The colour scheme of the seats in the Economy Class cabin on Thai Airways A350 has departed from the usual bright tones and is decked out in various earthy tones of brown with the familiar purple. 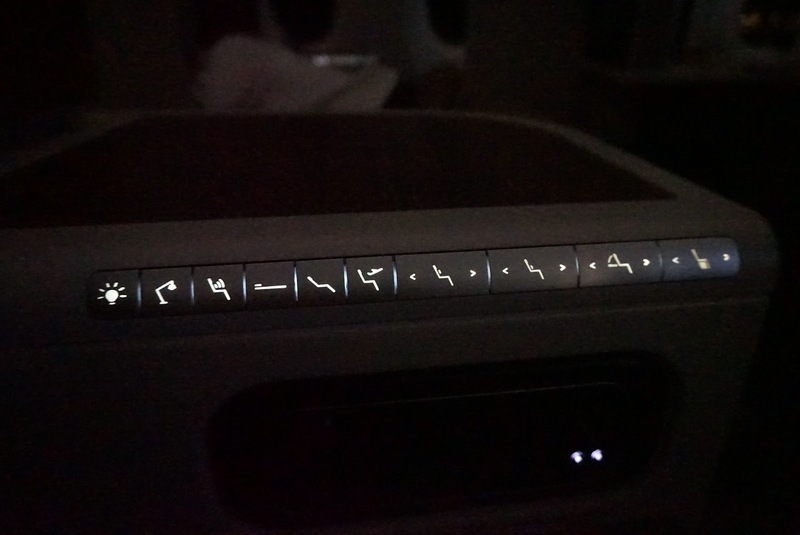 Thai Airways A350 is equipped with mood lighting which the pilot will toggle depending on the time of the flight. The Economy Class lavatory is rather sizable and looks clean thanks to the white colour furnishings and lighting. 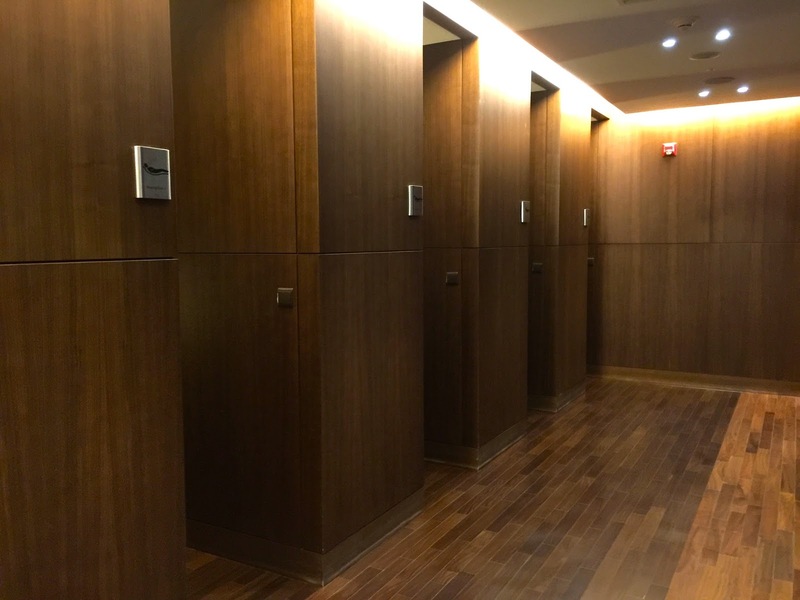 The wooden finishing on the cabinets adds a classy touch to the lavatory. The lavatory is well stocked with tissue and paper cups, however other than hand soap and perfume, there are no other amenities available. 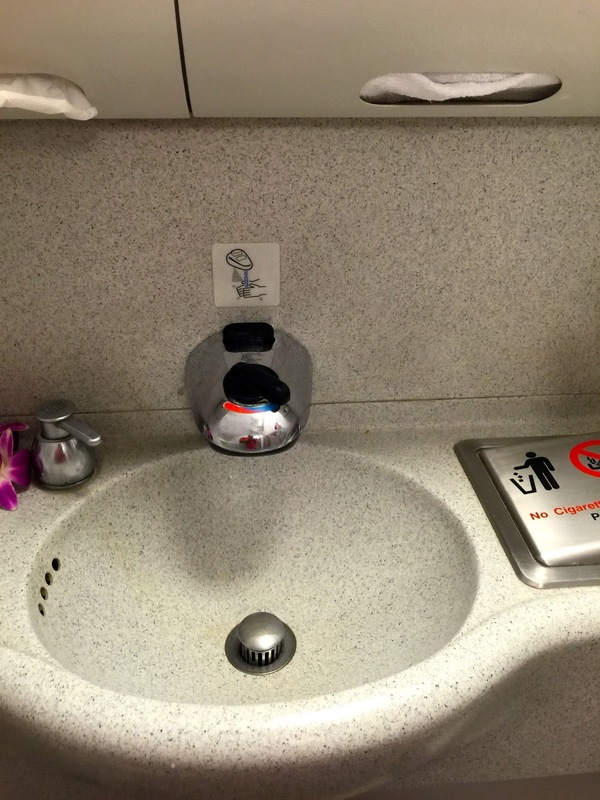 I like the sensor activated tap in the lavatory, which is both convenient and hygienic. 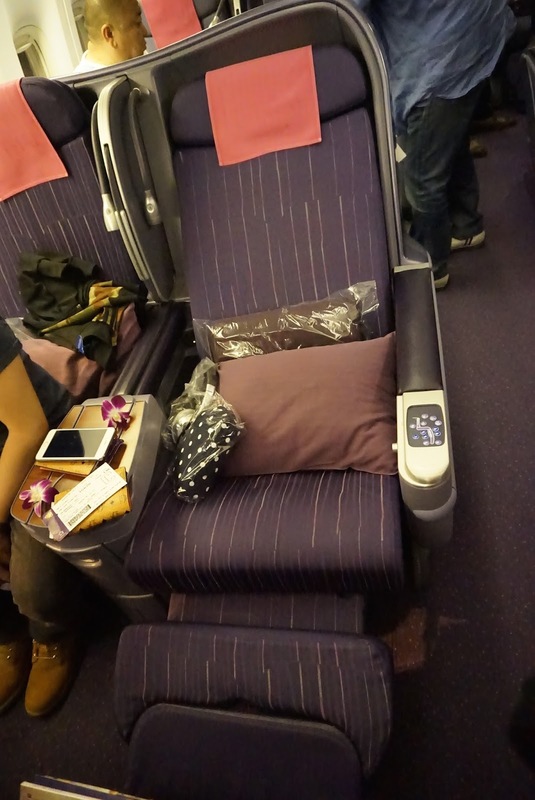 Seats in Economy Class cabin on Thai Airways A350 are arranged in 3-3-3 configuration in 2 sections. Each seat has a 32″ pitch and measures 18″ wide. They are comfortable and the legroom is rather generous. At the time of boarding, pillows and headsets are already placed on each seat, however, the blankets are distributed prior to, taking off. As with most Economy Class seats, the tray tables are stowed at the back of the seat in front. 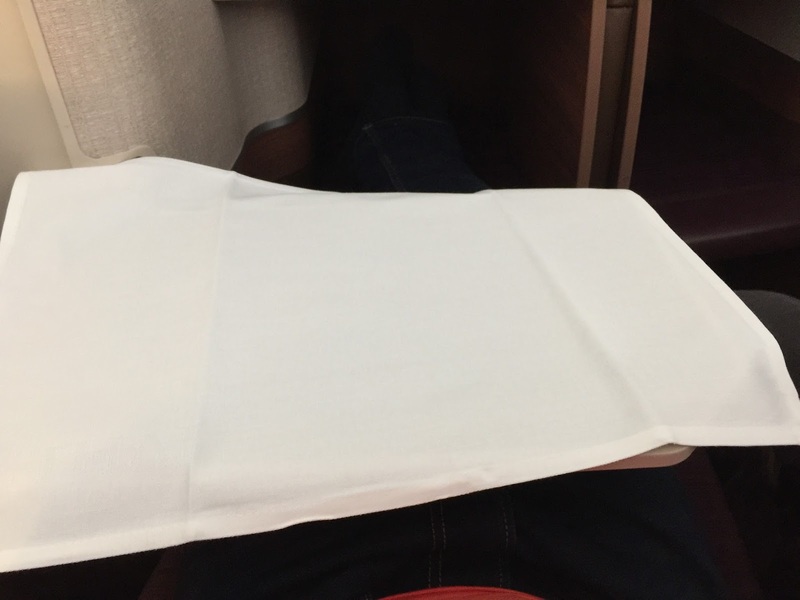 These tray tables are bi-folded, which makes getting in and out pretty easy. 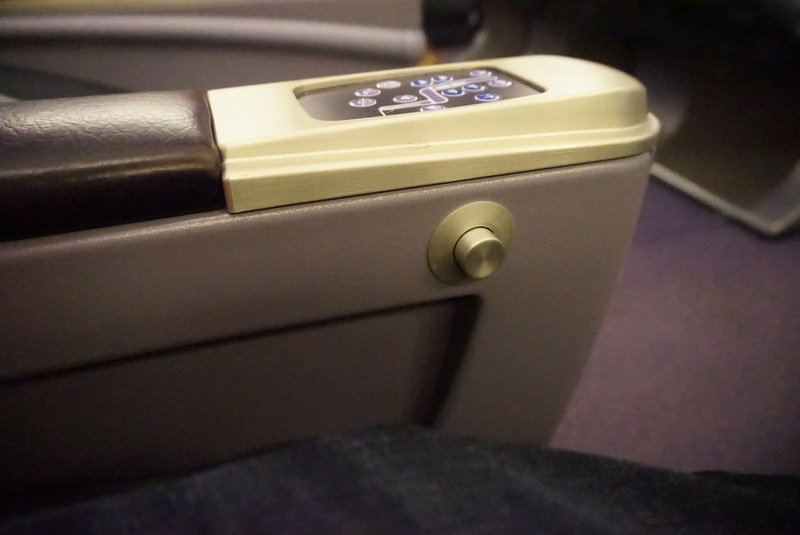 The seat recline button is found on the right armrest. Each seat comes with a leg rest, which can be cumbersome for passengers who wanted to stow their hand carry underneath the seat in front of them. 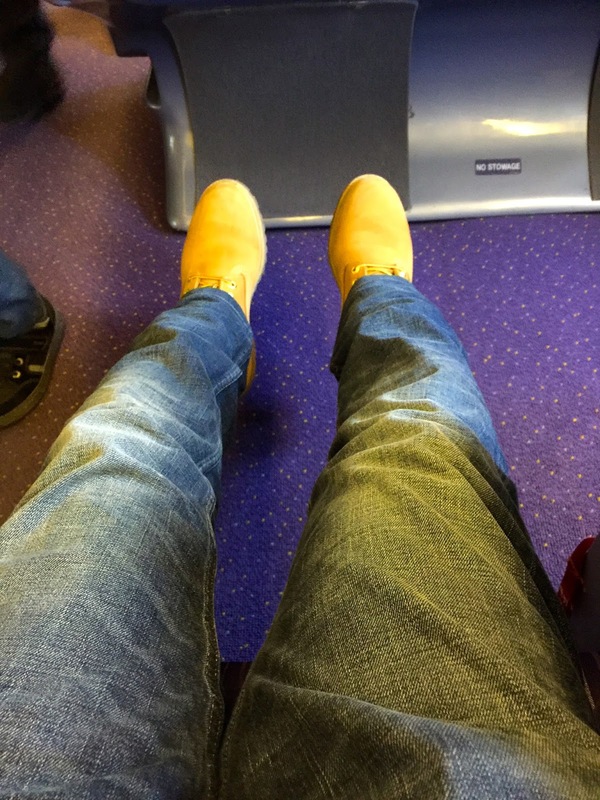 I tried using the leg rest but found they make sitting on the Economy Class seats to be uncomfortable. 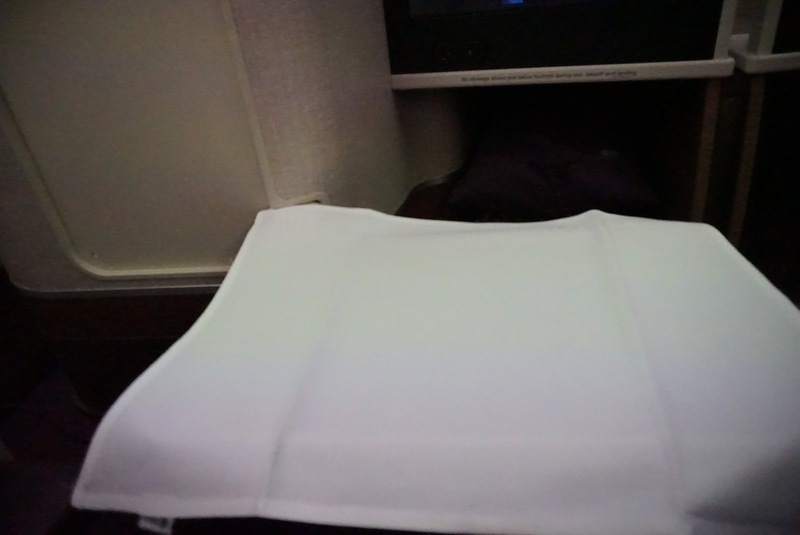 The seat pocket onboard Thai Airways A350 has only a single tier, which is rather small. With the seat pocket contents, there is hardly any excess room to put anything else other than passport and mobile phone. 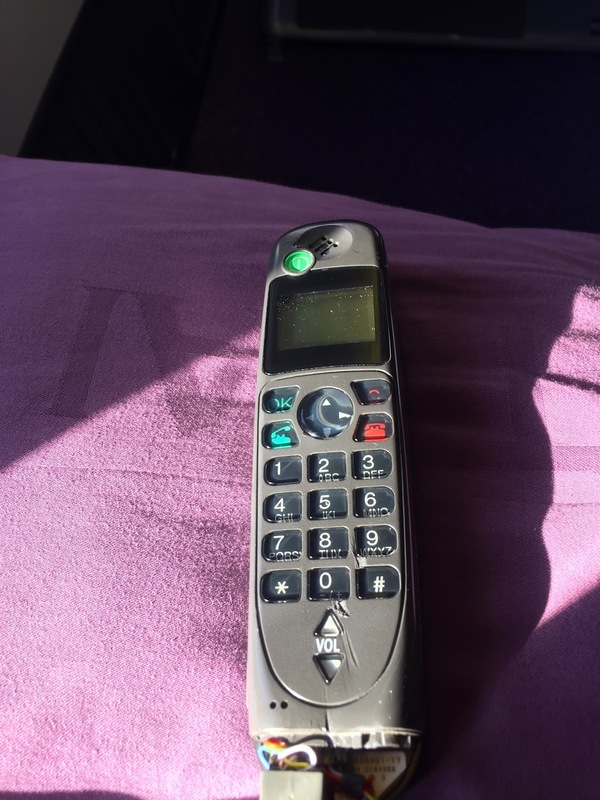 There is no lack of reading materials found in the seat pocket, other than the usual duty-free catalogue, there is also another catalogue – the OTOP Prestige shopping catalogue found in the seat pocket. 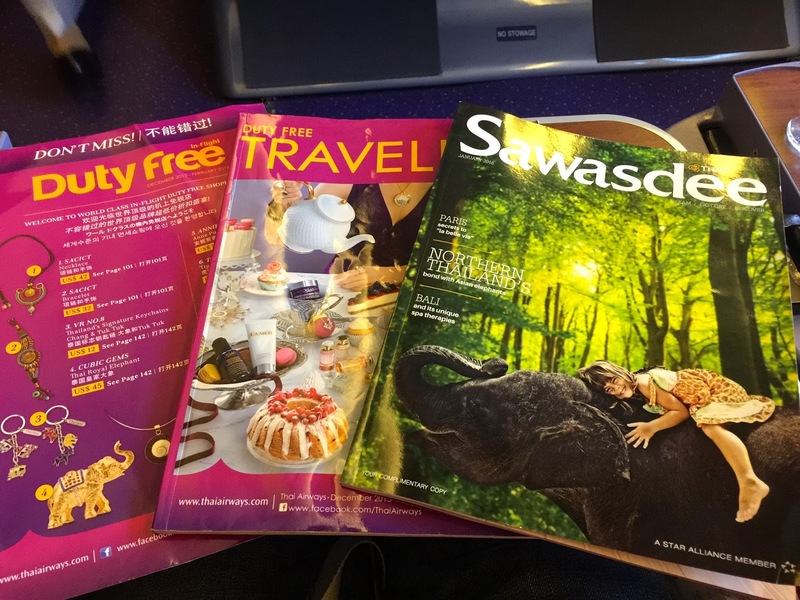 The Thai Airways signature travel magazine – Sawasdee is also found in the seat pocket. 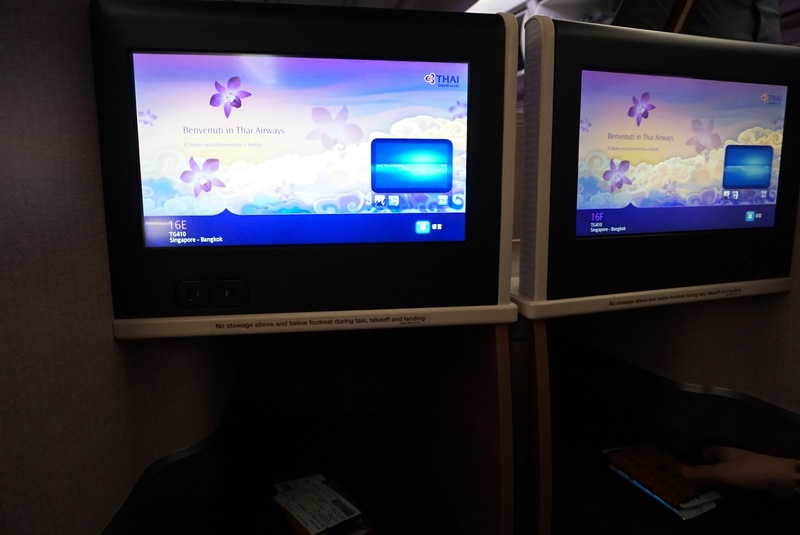 Each Economy Class seat on board the Thai Airways A350 comes with a personal AVOD, which passengers can start watching movies or playing games the moment they board the aircraft. The system remains available throughout the flight till the passengers disembark. The 11″ touch-screen AVOD has a wide selection of movies, including the latest Hollywood blockbuster and Thai Movies, arranged in initiative menus that makes searching very easy. 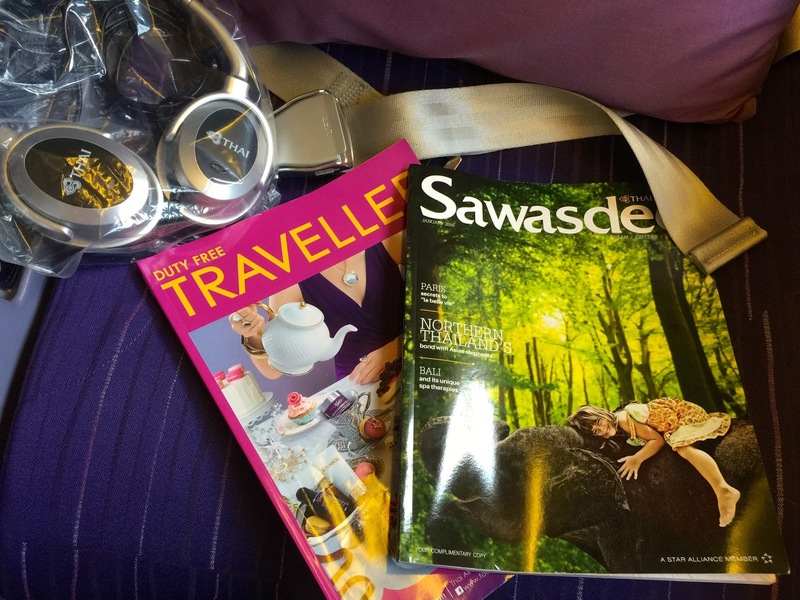 Other than movies, Thai Airways IFE comes packed with games, travel documentaries and popular American sitcoms. I also found the menu in the IFE. I find the touchscreen function to be rather responsive after all the A350-900 is still very new to the Thai Airways Fleet. Headsets are not noise-cancelling but do the job of delivering good sound quality to passengers. The IFE controller is stored under the AVOD screen. This new generation minimalist controller is easy to use and very responsive. 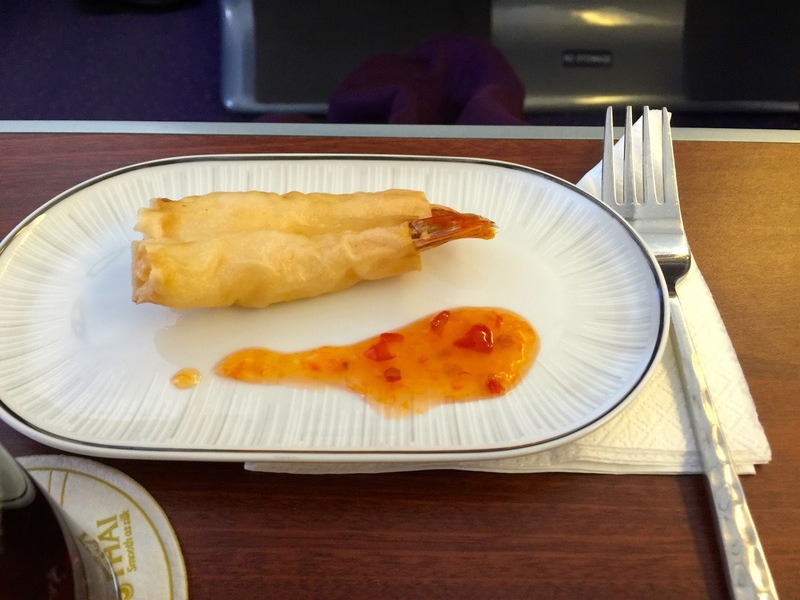 Catering onboard Thai Airways is very good. For this flight, we were offered fish with rice and chicken with fried rice. I had the fish meal, which is very flavourful and tasty. The portion of the main meal is just nice, which filled my stomach. I like the idea of including a small bottle of water with each meal when distributed, which keeps each passenger hydrated. Each Economy Class meal comes with the standard corn salad and a cake together with a bun on top of the main course. Drinks such as cola, beer and wines are also served by another set of the pursuers after the meal carts went around serving the meals. Pursuers are seen patrolling the cabin with coffee and tea shortly after the drinks service. 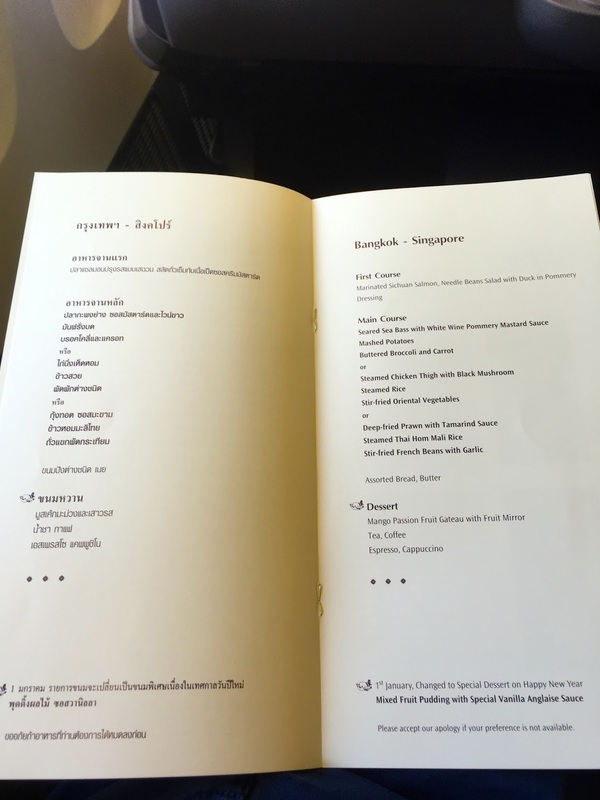 I found the service in the Economy Class onboard Thai Airways A350 to be very good, which is much better than the service I received onboard the same type of aircraft in Business Class one year ago (read about it here). 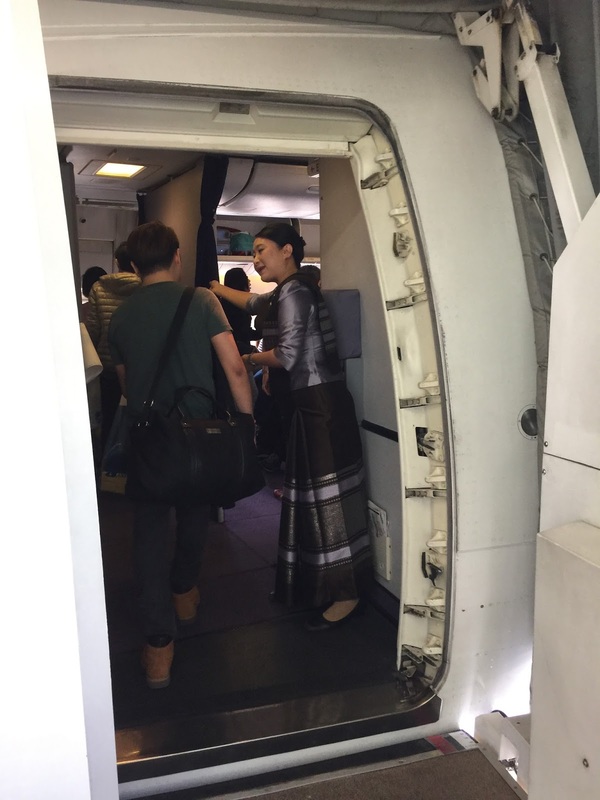 The moment I stepped onto the aircraft, I can feel the renowned Thai hospitality. All the attendants are always seen wearing their smile and tirelessly serving the full load Economy Class cabin. 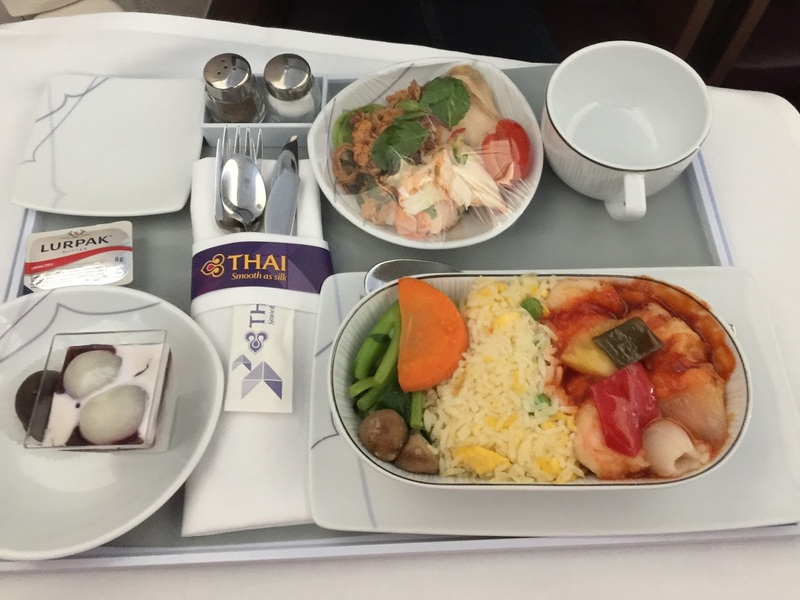 The meal service is very efficient and pursuers sprung into action the moment the seat belt signs are turned off, ensuring that all passengers are well-fed during the short 2-hour to Bangkok. 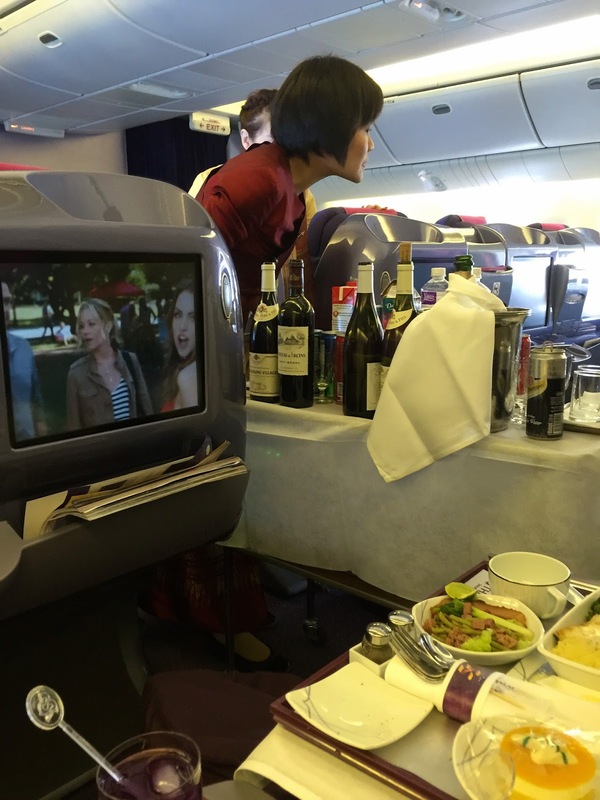 Pursuers are also seen patrolling the cabin to clear trays and trash as well as to offer drinks throughout the flight. 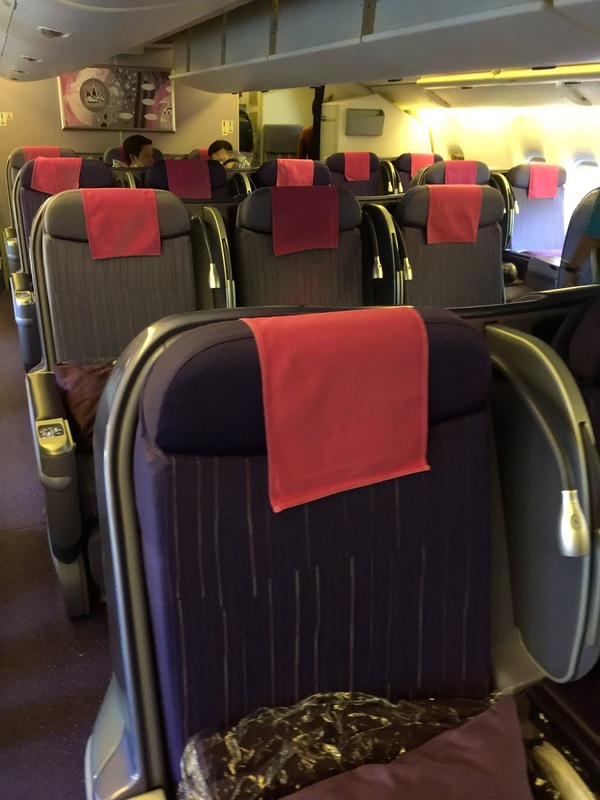 Thai Airways A350-900 Economy Class cabin has a good product. The seats are comfortable and the legroom feels generous for Economy Class. However, the single tier seat pocket and the somewhat “useless” leg rest are the minus points for this product. The toilet is bright and clean and is of a decent size for Economy Class cabins, the use of wood furnishing makes it looks classy and feels like those ones would find in Business Class cabin. The IFE is well stocked with entertainment options that made flying on this 2-hour flight zoomed pass fairly quickly. The service onboard this flight is very good. 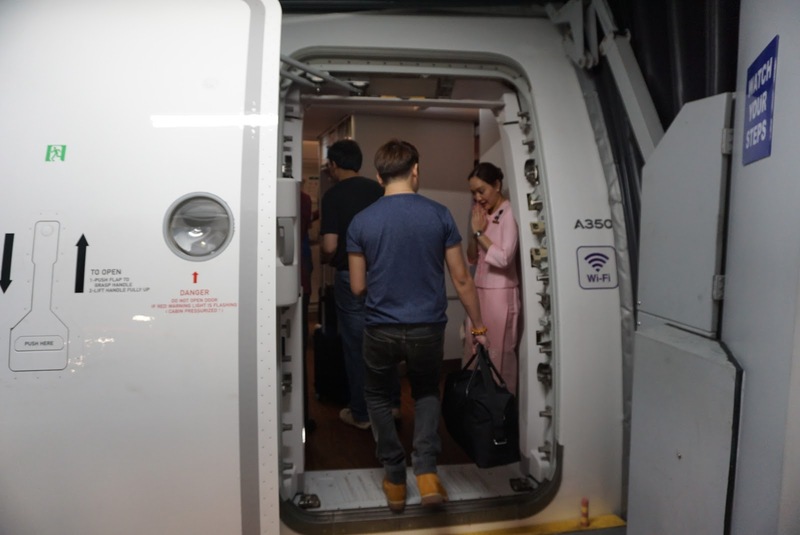 From boarding to meal service to disembarking, the flight attendants displayed the signature Thai hospitality despite being a full flight. Meal service was executed efficiently with the warmness of the Thai smile. 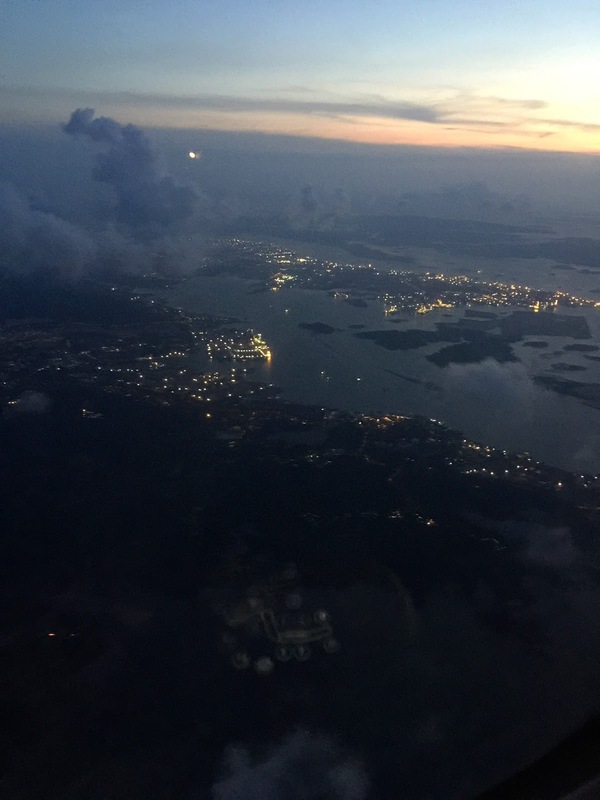 As this is a transit flight from Singapore, I did not perform any check-in for this leg of the flight. 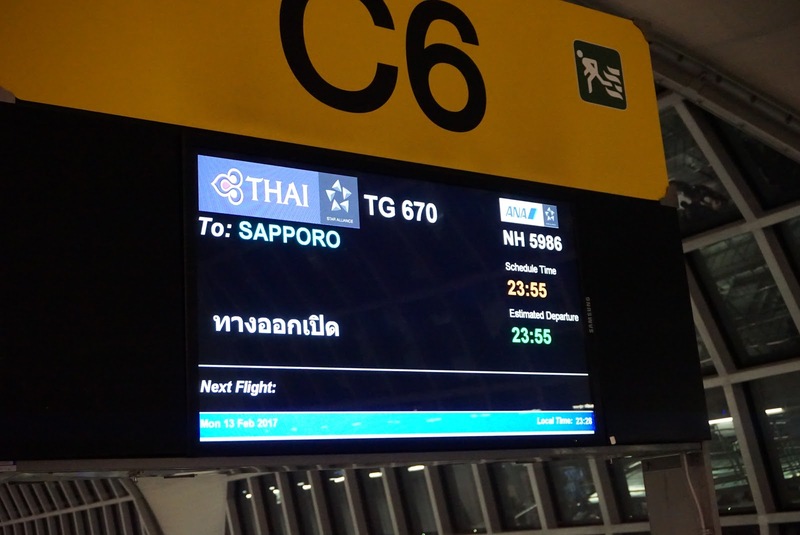 We were checked through from Singapore, hence when we reached Bangkok we referred to the flight information for the gate that our flight will be departing. 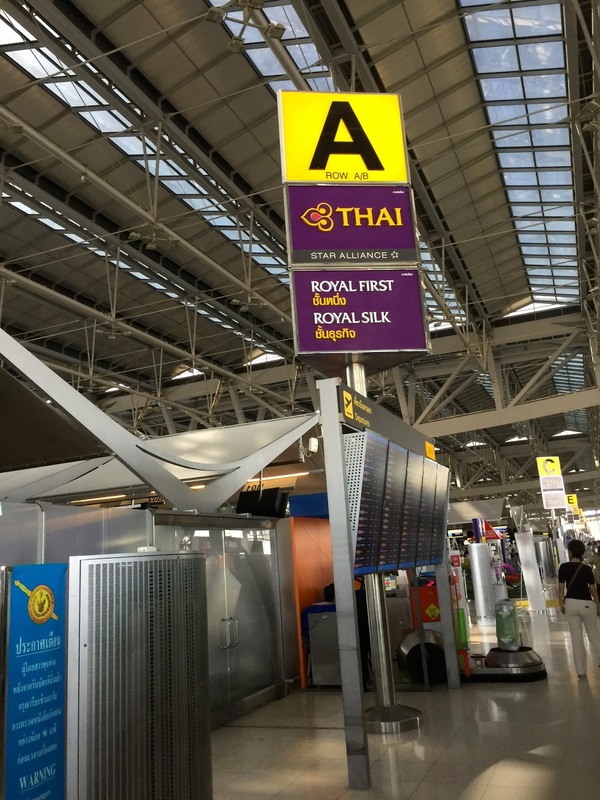 Thai Airways seem to have the practice of putting the arrival and departure flights far apart. 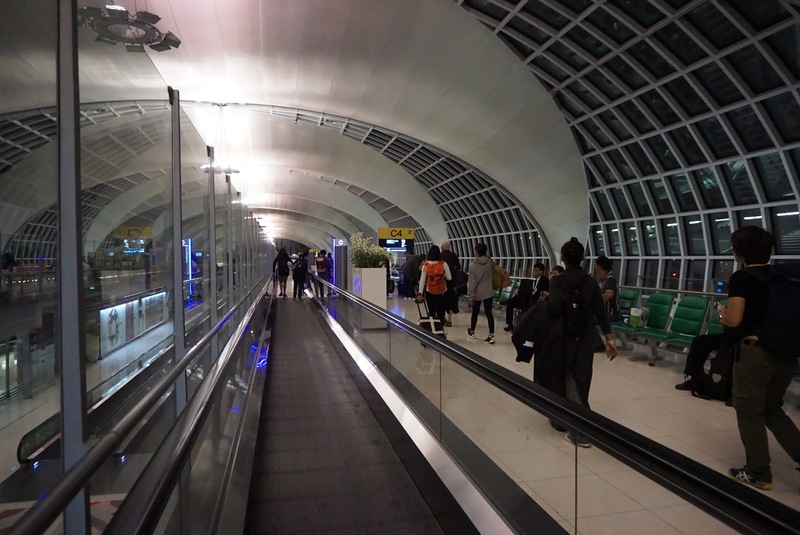 As Suvarnabhumi Airport is a big airport, we catered sufficient time to walk to our departure gate. 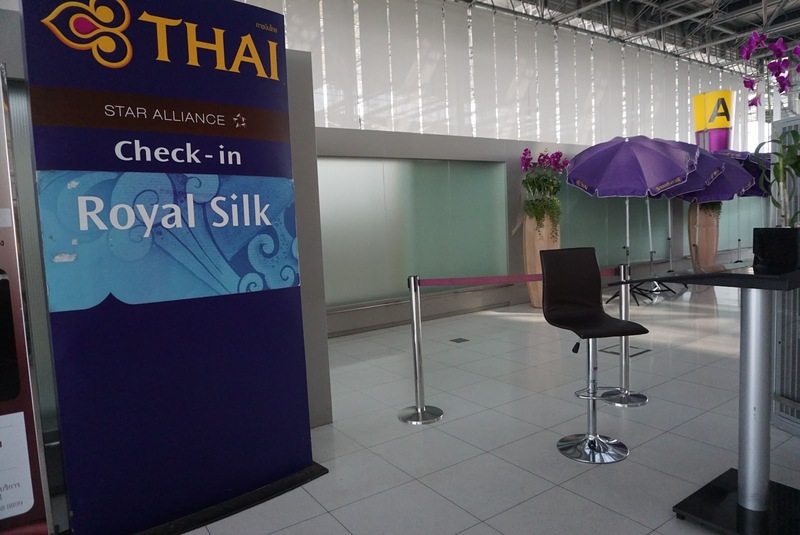 There are 4 Thai Airways Lounges for Business Class passengers and 1 Royal Orchid Spa Lounge in Suvarnabhumi Airport. Business Class passengers flying out or transiting Bangkok are treated to 30 mins head and shoulder or foot massage in Royal Orchid Spa. However due to the time constraint, we did not have go for the massage. 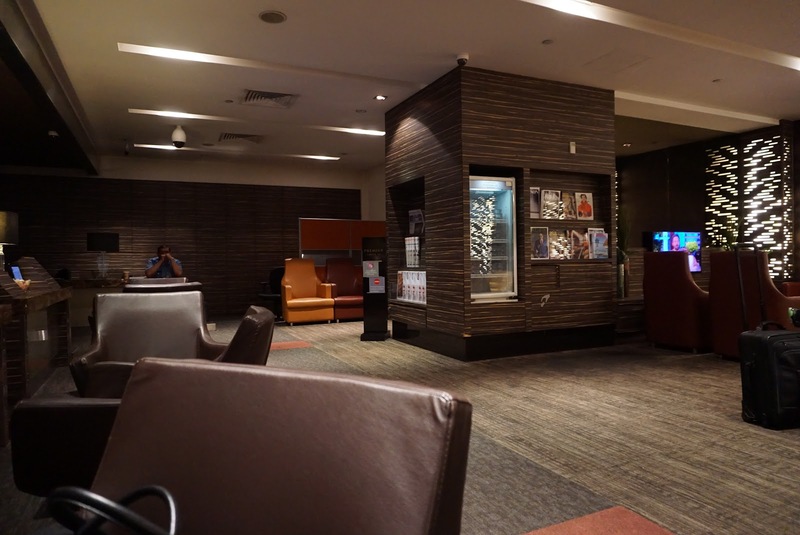 We visited the Lounge in Concourse C, which has shower facilities and nearer to our departure gate. 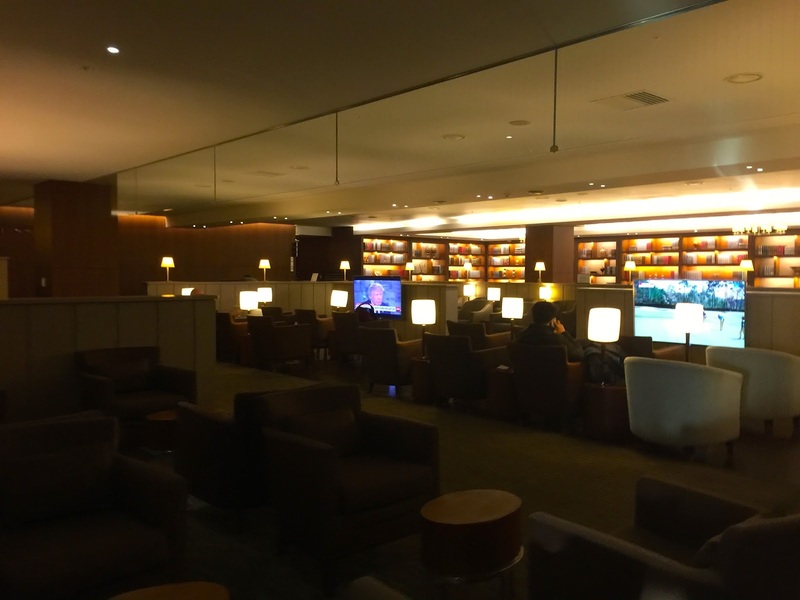 Both lounges at Concourse C (they are opposite each other) has shower facilities, however Concourse C East Lounge has lesser people waiting for shower at the time of our visit. 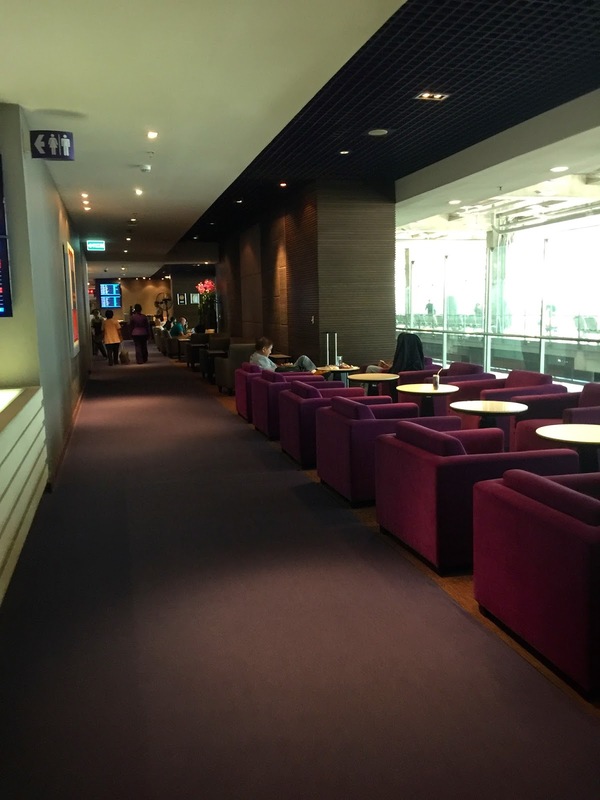 The lounge is a fairly small lounge, decked in brown and purple colours. There are limited seatings in this lounge. On top of the shower facilities, this lounge as an internet area. There are some finger food and drinks for passengers to enjoy while waiting for their flight. 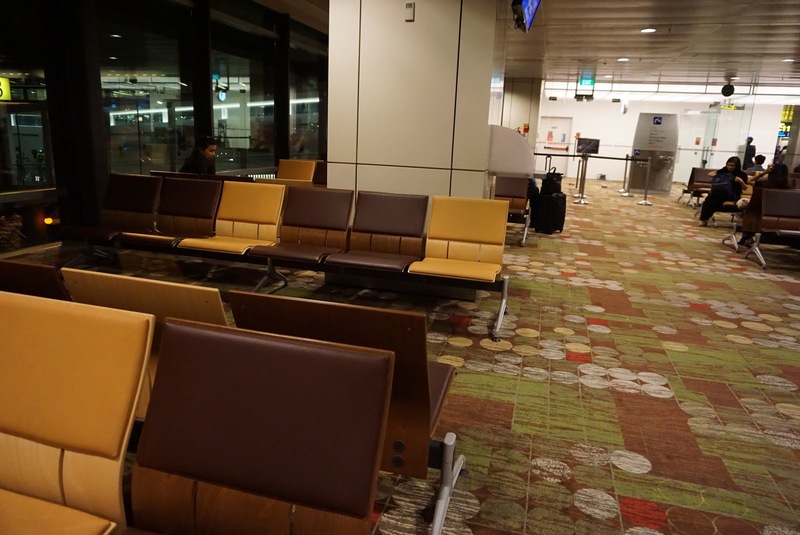 As with the lounge in Changi Airport, there are some reading materials like local newspaper and magazines for passengers to read. 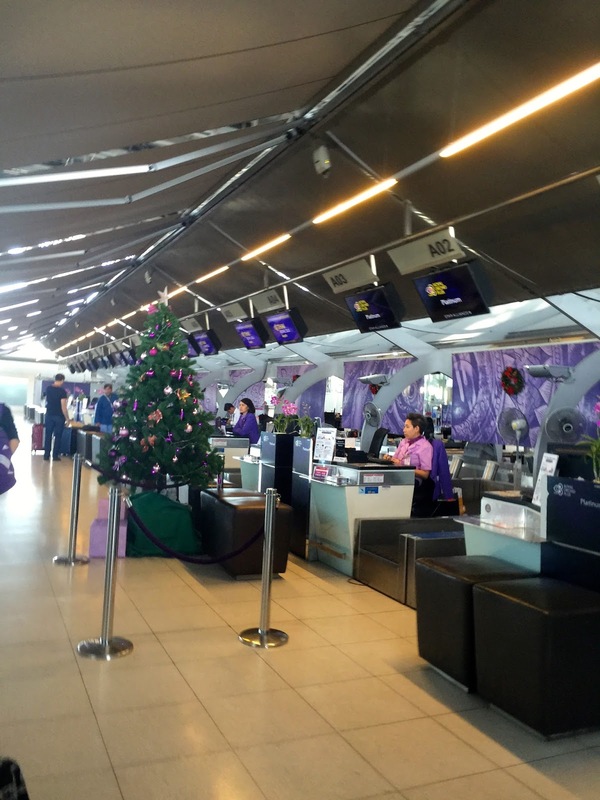 One thing to note is that Thai Airways lounges does not announce which Thai Airways flight is departing, the onus is on passengers to note their departure timing and make their way to the departure gate in good time. Thai Airways uses check-in counters B10 to B15 in New Chitose Airport is located on the right side of the International Terminal Building. There are 2 counters dedicated for Business Class Check-in and 4 counters for Economy Class passengers. The queue is short at the Business Class counters, we did not have to wait for too long to get ourselves checked in. 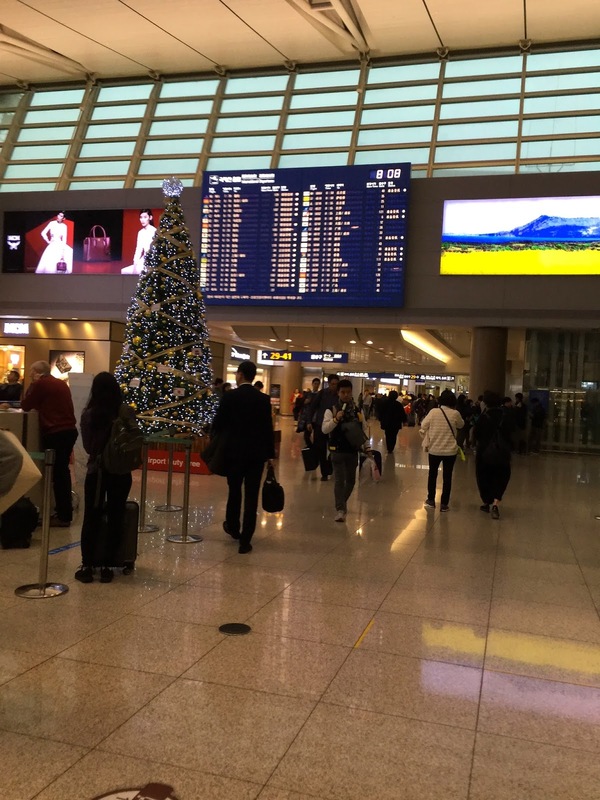 Checking-in is fast and the ground staff were very courteous and friendly. They briefed us on the standard stuff like where the boarding gate is and what time we have to be at the boarding gate. We were also given directions on where the airlines lounge is located before the ground staff wished us a pleasant flight. 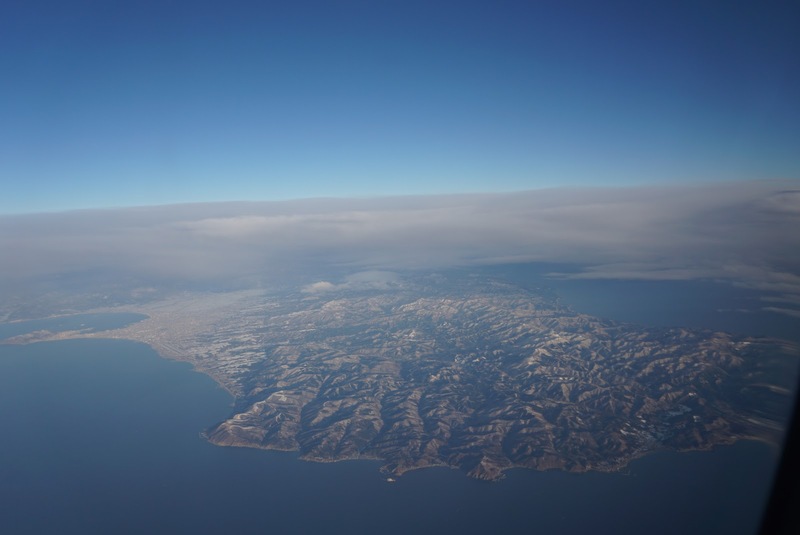 There are no priority lanes for Business Class passengers in New Chitose Airport. There is a long queue forming at the security clearance, it is a good thing to arrive at the airport ahead of time so that one can enjoy the lounge. 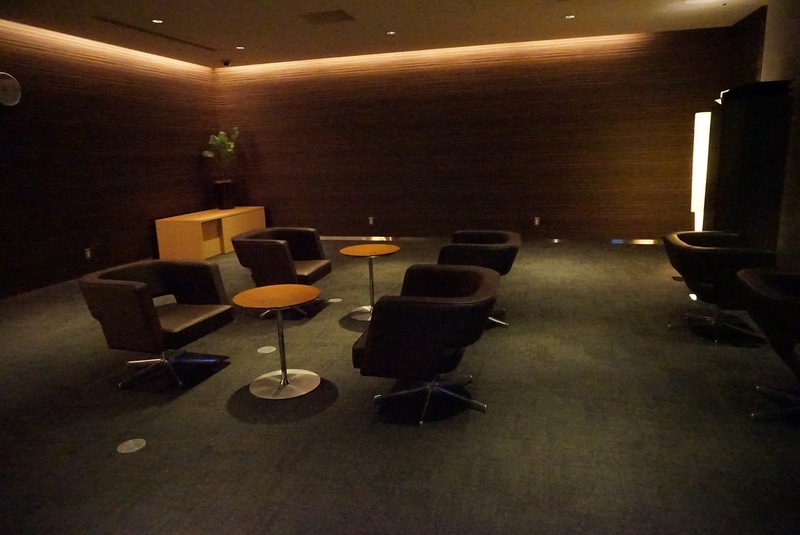 There is only one lounge in the International Terminals in New Chitose Airport. 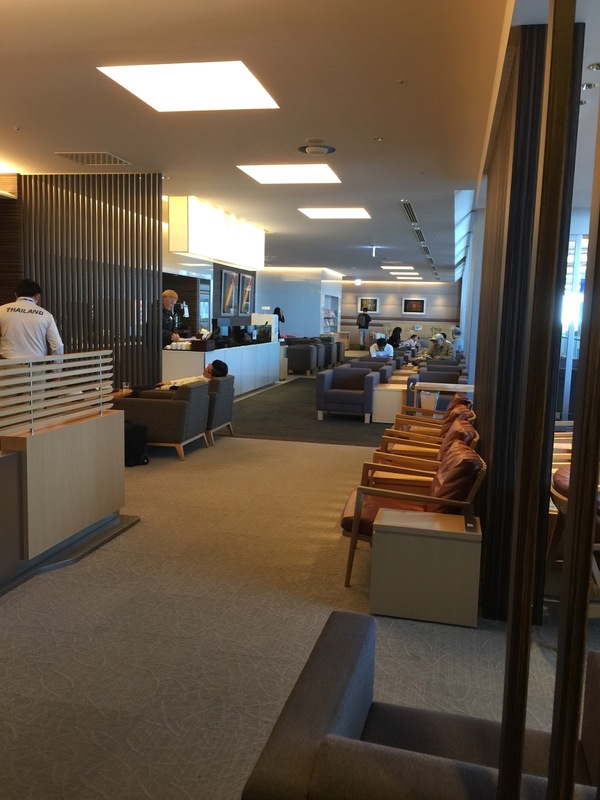 All Business Class passengers departing New Chitose Airport uses the Royal Lounge, which is located on the 4th floor of the terminal building. It is right up the escalator on the right after immigration clearance. 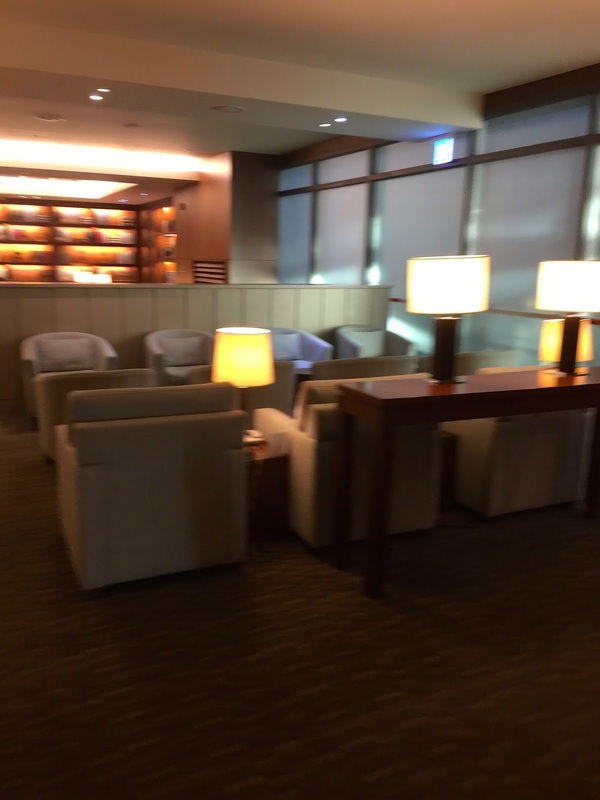 There are 2 sections to the lounge, one for Business Class passengers of all airlines departing New Chitose Airport and a smaller section (payable) for certain credit card holders. The lounge is decked out in comfortable and cosy earthy tones with 125 seats in the general area and 12 seats in the smoking room. 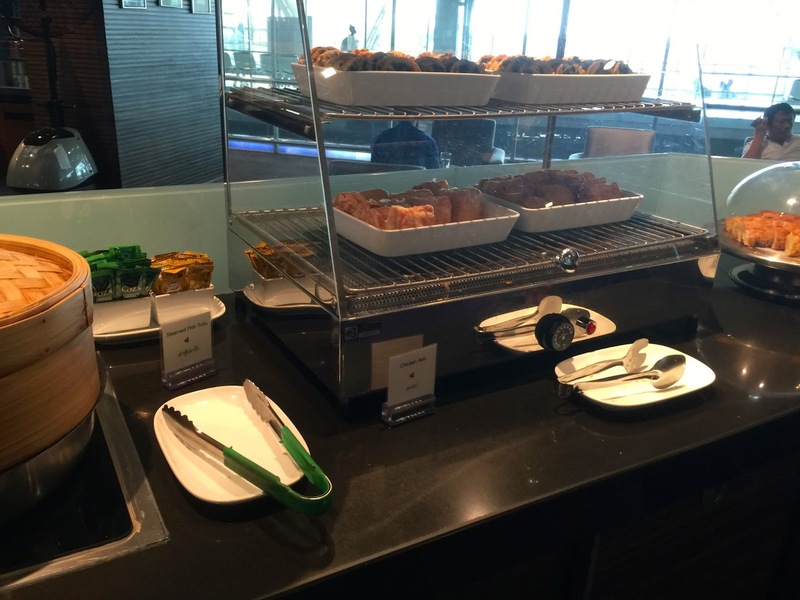 There is a small counter serving limited food and drinks for guests to enjoy before their flight. There is also a snooze area at the far most end of the lounge. 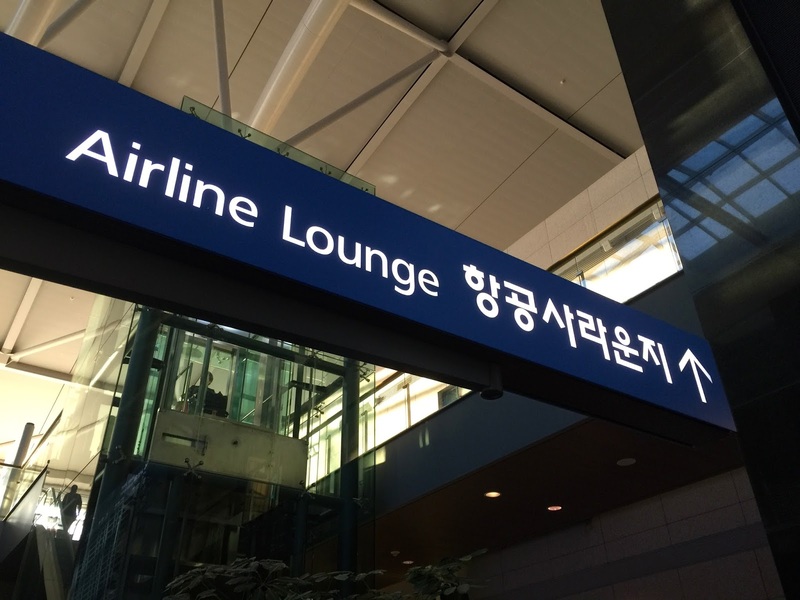 As this is a silent lounge, no flight announcements were made and passengers are to note their departure time and arrive at their boarding gate in good time. Thai Airways uses B777-300 for both BKK-CTS and CTS-BKK legs of the flight. 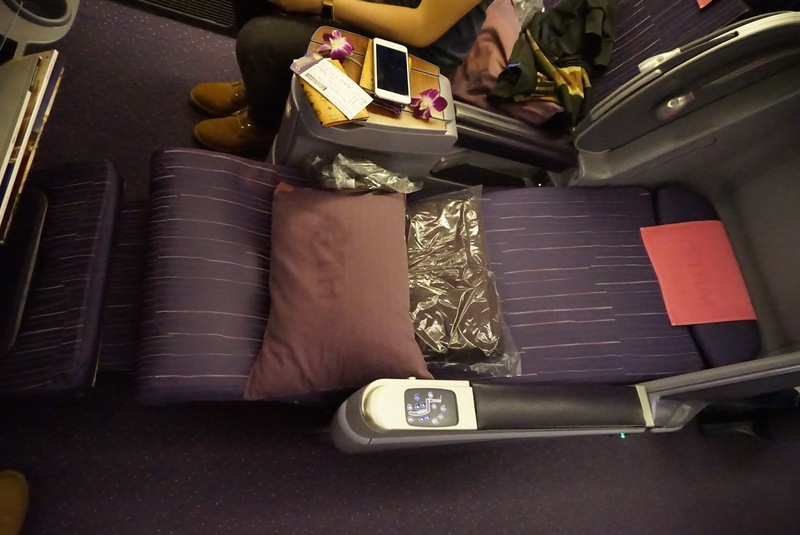 The Business Class section mainly uses the signature Thai Airways purple colour theme in this cabin. There are 34 Business Class seats arranged in 2-3-2 configuration, less first row which has a configuration of 2-2-2. There are 330 seats in Economy Class section. I find the open concept in the Business Class section of the B777-300 to be spacious, despite lacking privacy. The colour theme of the Business Class section makes one feel comfortable. 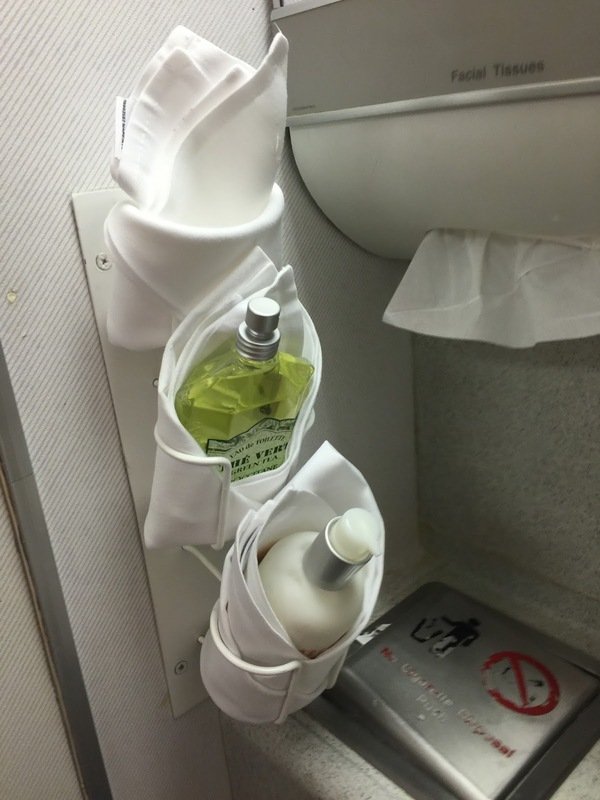 Amenity kits were already placed on each seat when I boarded the aircraft. 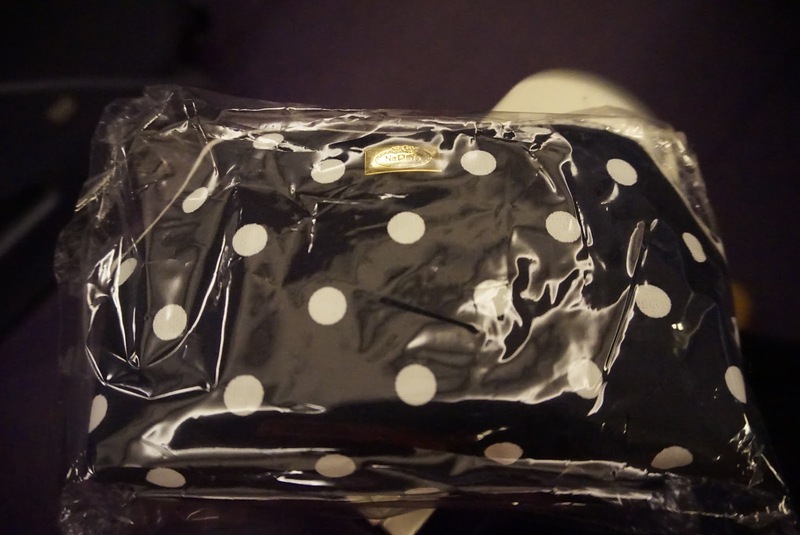 Thai Airways uses Naraya pouch for the BKK-CTS leg and Furla pouch for the CTS-BKK leg. 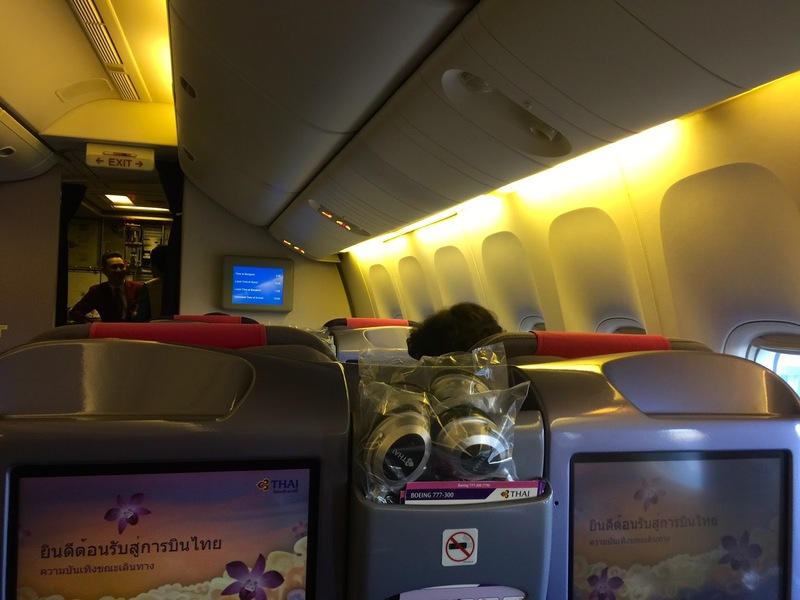 I noticed Thai Airways alternates the pouch for outbound and inbound flights. The contents inside the pouch remain the same with the standard slippers, dental kit, lip balm, moisturiser, ear plugs and eye mask. 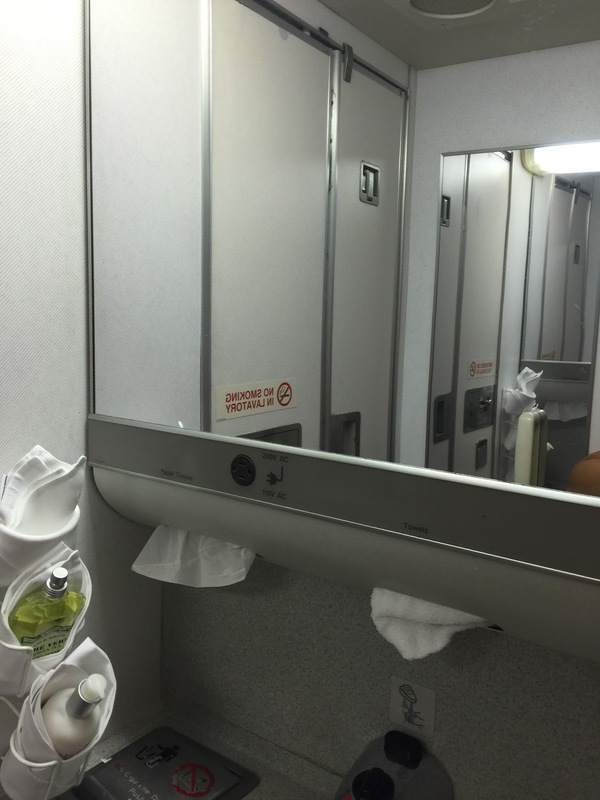 There are 2 Business Class lavatories up front behind the cockpit onboard. As with most Business Class onboard Thai Airways, the lavatory is a tad small and offers very minimum amenities. 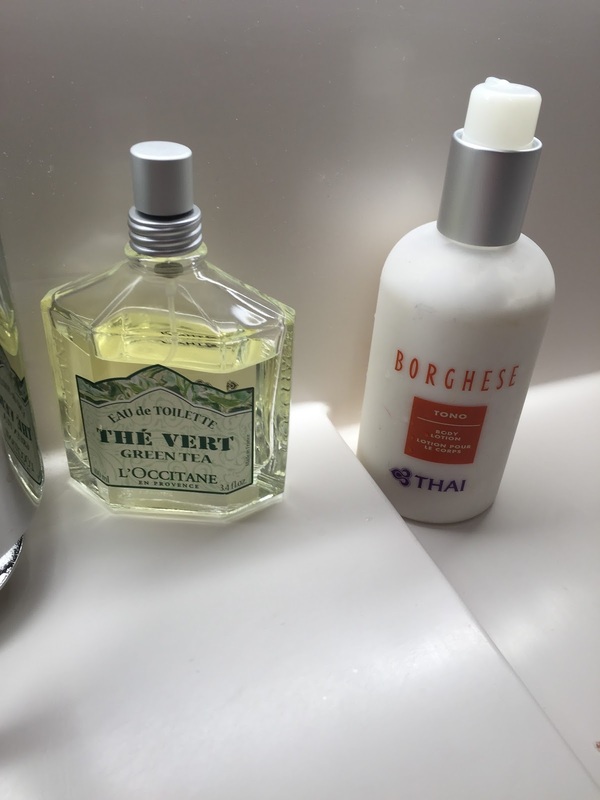 Other than the hand soap, other additional amenities are a more upscale eau-de-cologne (as compared to Economy Class) and body lotion. 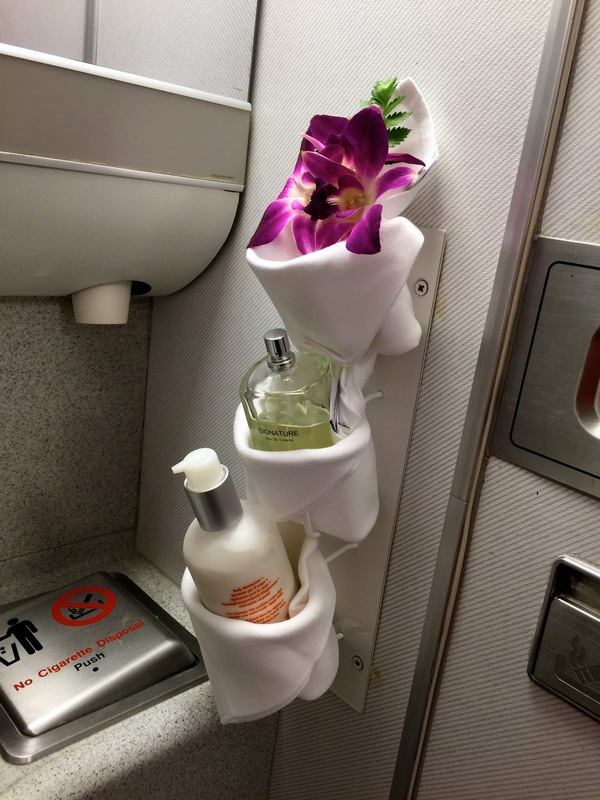 These are also present in Economy Class lavatories. 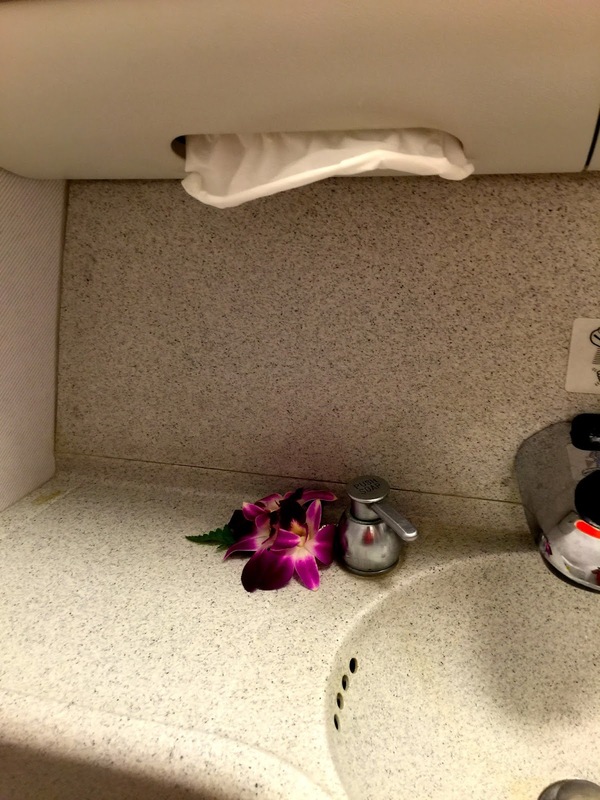 Perhaps the differentiating factor in the Business Class lavatory is the presence of orchid flowers and handkerchiefs on top of the tissues provided. Otherwise, I thought it is no difference (and perhaps even worse) than Economy Class lavatories. 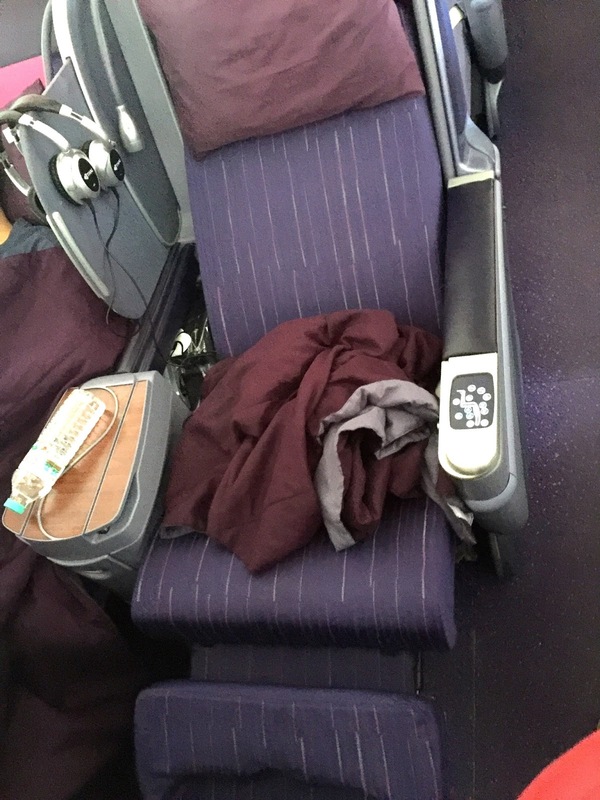 The Business Class seats onboard the B777-300 has a pitch of 66″ and width of 20″. It is not true 180° flatbed, but a 163° angled flatbed. Passengers who are used to the 180° flatbed might find the seat when converted into bed mode to be a tad sloppy. The controls to the seat mode are found on the armrest of the chair. The Business Class cabin seats have 3 modes, the upright mode for takeoff and landings, lounge mode and bed mode. I find the lounge mode most comfortable when watching movies on the IFE. The legroom in the Business Class seats is excellent. I have plenty of space to stretch out, thanks to the open concept of the cabin. The seat even comes with a functioning massage function. The seat controls are located on the left armrest on the seat. There is a small “coffee” table between 2 seats, which creates space to put drinks or other nicknacks. 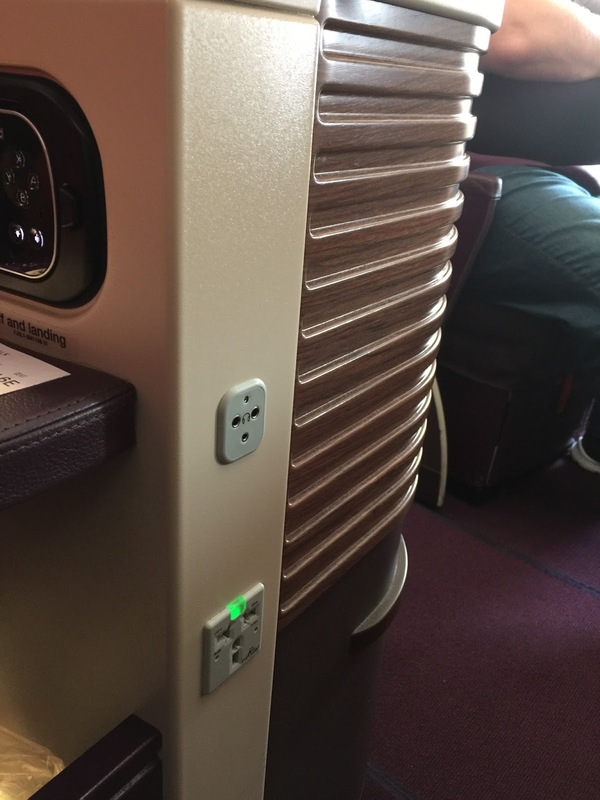 The headphone jack and power outlet are located in a small space under the centre armrest. The seat even has a cup holder and generous space where in-flight reading materials are stow behind in front. 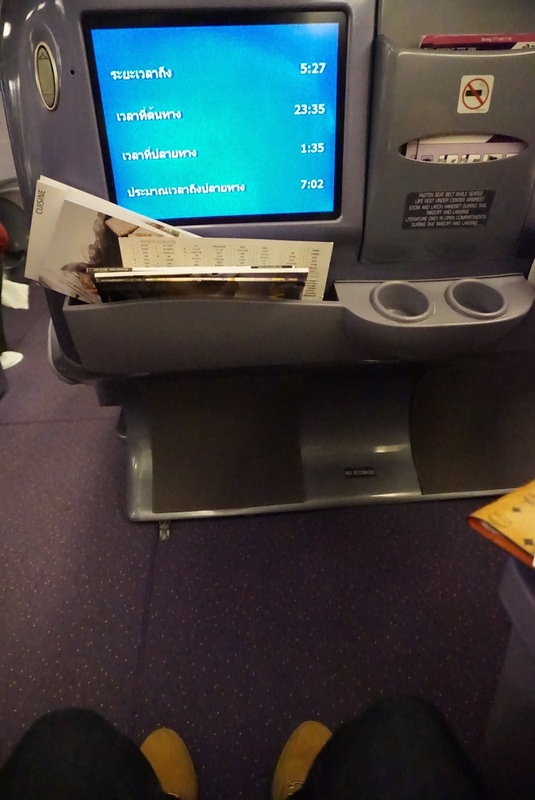 Thai Airways B777-300 has a large IFE display screen on the back of the seat in front of my seat. 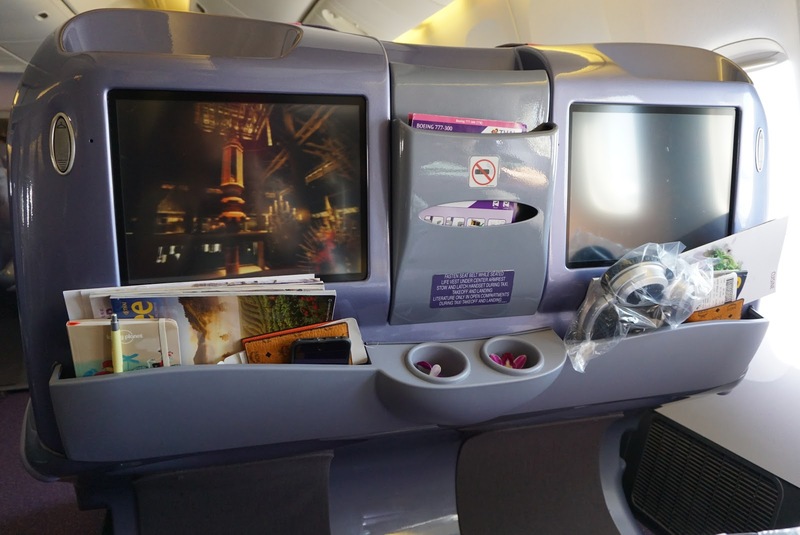 Thai Airways has a 15″ TV screen with touchscreen functions in its Business Class cabin. Despite being an ageing aircraft, the IFE is not laggy and the touch screen function is still rather responsive. There are plenty of options for entertainment in the IFE, including the latest movies, selected TV shows and games. The controls for IFE is stow under the armrest of the seat. 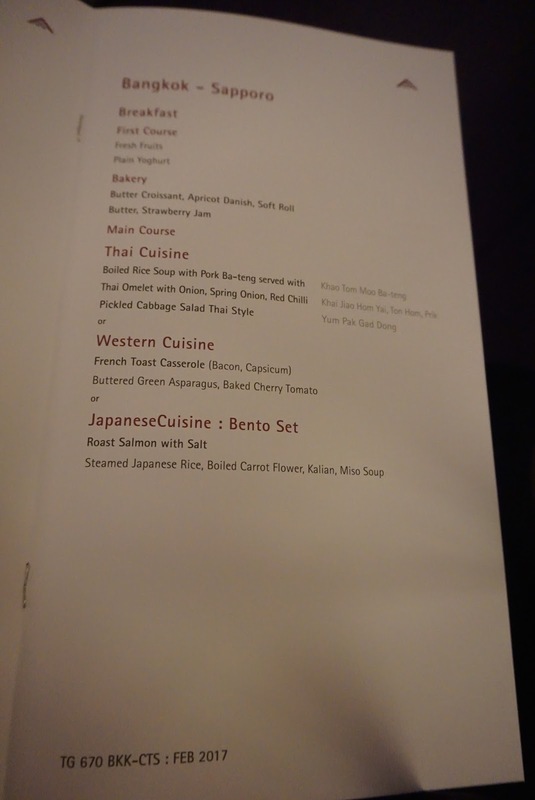 Thai Airways used to have the option to pre-order meals from a menu online for their Business Class passengers. They still had that last year when I flew with them to Seoul. However this year, this service seems to have ceased and is only available to their passengers flying on First Class. 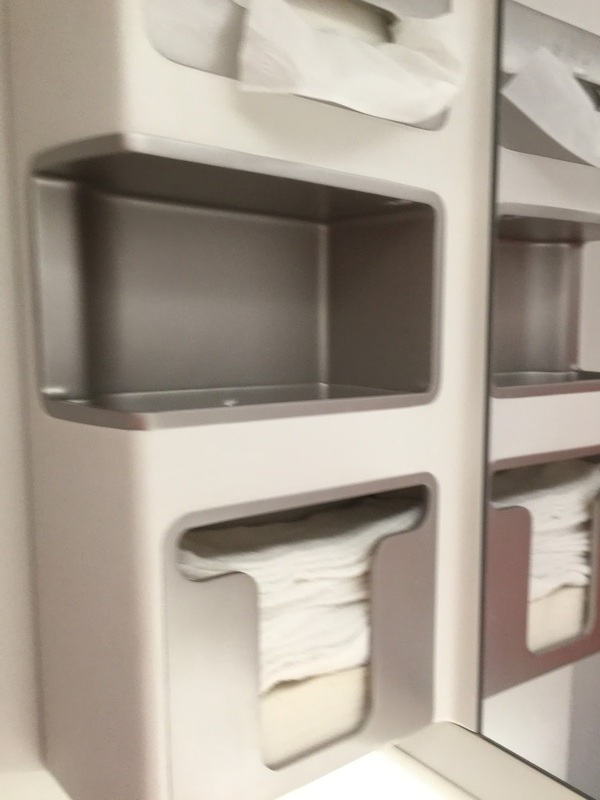 Prior to taking off, Business Class passengers are served welcome drinks with hot towels. 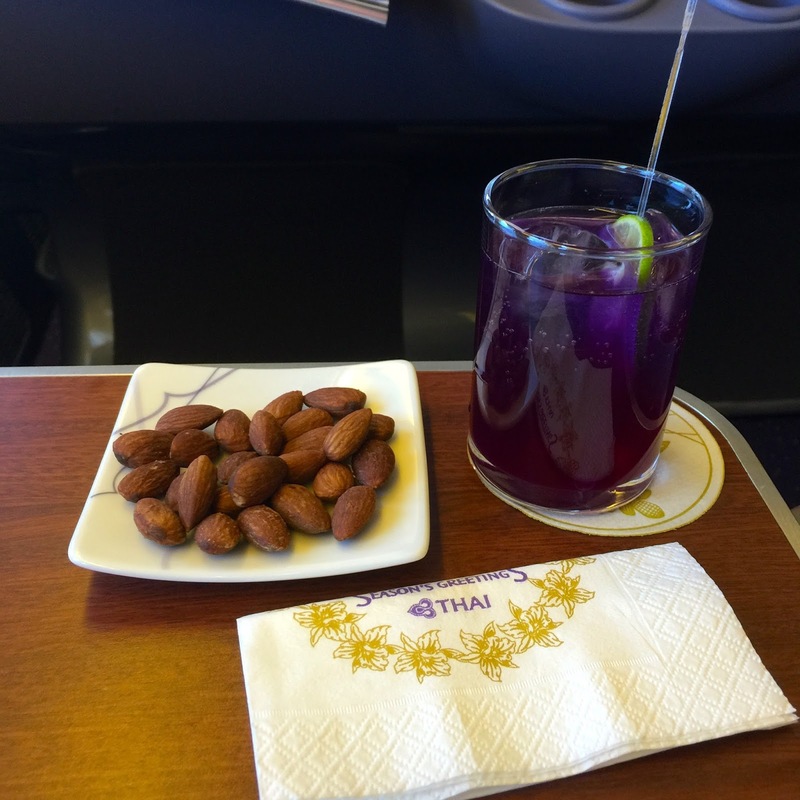 I always asked for the signature Thai Airways drink, Violet Bliss, which is not part of the drinks on the tray that the pursuers go around serving. Meal orders were taken after the welcome drinks are being served. As this is a night flight, no meals were being served after taking off, there are no snacks made available for passengers. However, passengers can request for Ramen Soup with Simmered Pork or Tuna Onigiri served with Miso Soup should one gets hungry in the night. Breakfast was served 2 hours before landing. I opted for the Western Set which comprises of French Toast with Capsicum served with assorted bread and Fresh Fruits as well as yoghurt. 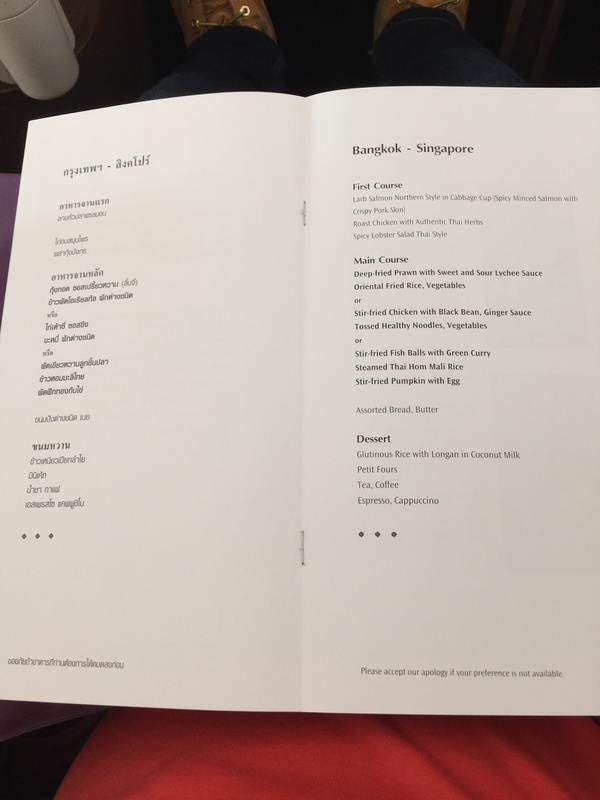 The food was served together instead of by courses, feels a little like Economy Class but in fanciful china. I find the French Toast to be blend and a little dry, there isn’t much flavouring to the food served. I thought the assorted bread tasted better. I did go for the fruits as I don’t eat strawberry and kiwi fruits. The meal wasn’t that satisfying. As with the outbound leg, passengers were served welcome drinks and hot towels prior to taking off. However, when I asked for their signature Violet Bliss, we were told it is not available as the drinks had been stored overnight, hence they are not serving that. 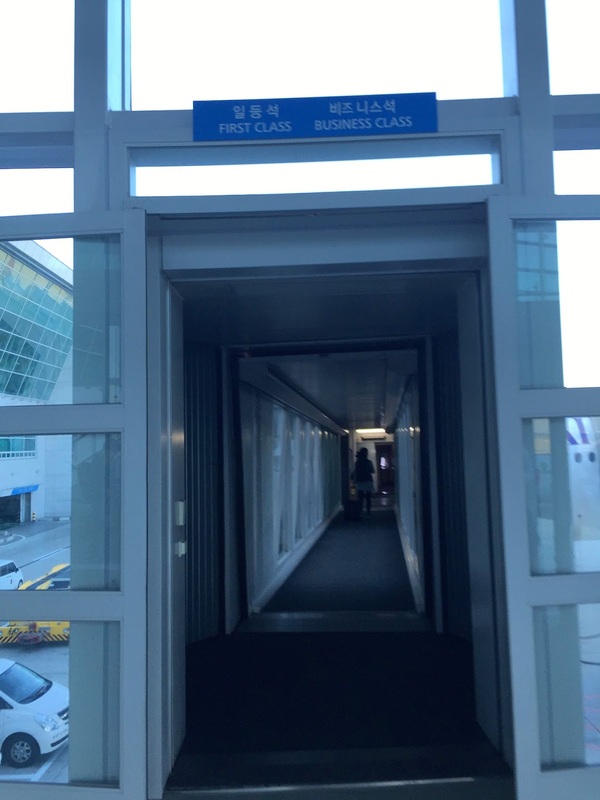 This was not the case when I flew with Thai Airways the year before, we were served Violet Bliss when we flew out of Seoul. Since the pursuers claim they are not serving overnight Violet Bliss, I asked for a glass of Apple Juice. 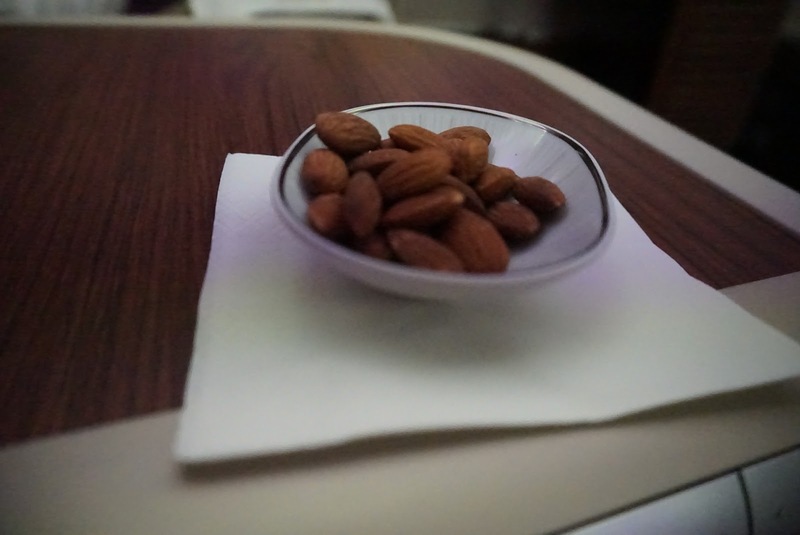 A bowl of nuts was served shortly after taking off when the pursuers went around serving drinks. I ordered the Japanese Bento Set for lunch. 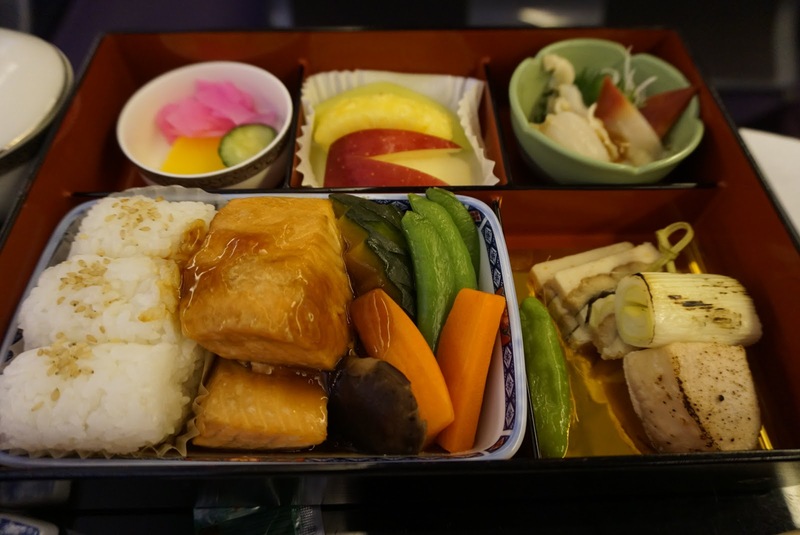 The Bento Set comprises of Teriyaki Salmon served with vegetables and mushroom with Japanese Rice. Part of the Bento Set also includes sashimi, and grilled pork belly and fresh fruits. Miso Soup and cold soba also form part of the Bento Set. While the bento set is rather sumptuous, the miso soup tasted like a lot of MSG has been put into it and the salmon tasted blend. The Sashimi did not last fresh, but edible. The best tasting of all was the soba noodles. Mango pudding was served as dessert which I find it tasty and not too sour. 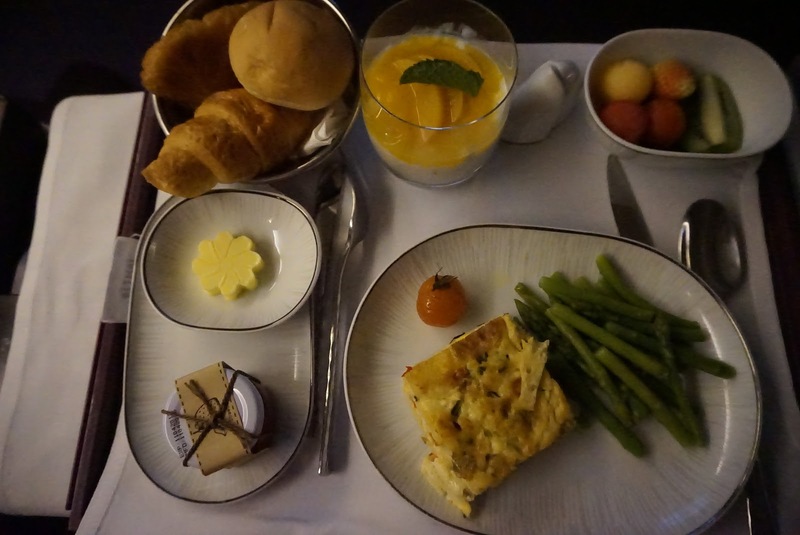 Prior to landing, as we were still a little hungry, we ordered the all day meal of Tomato Rice with Scrambled Eggs. The Tomato Rice tasted blend and the scrambled eggs could do with a little pepper. 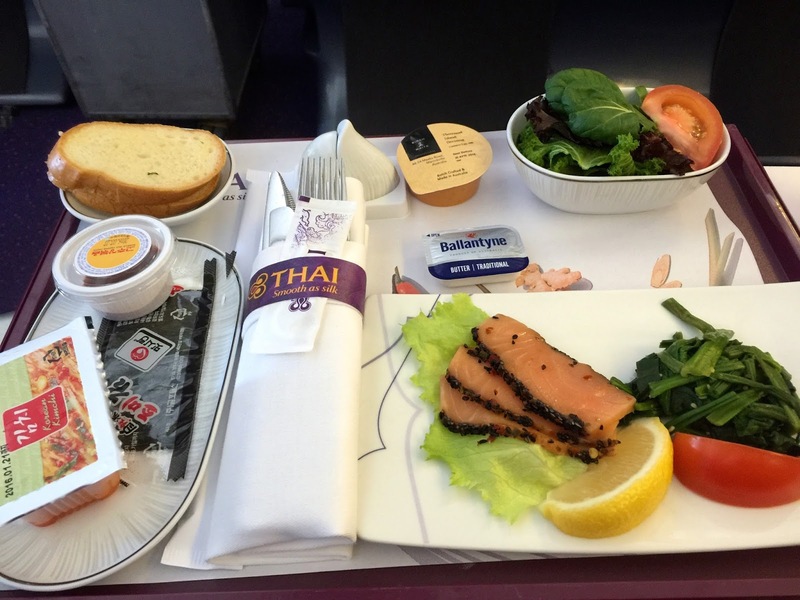 The service onboard Thai Airways Business Class was disappointing and mediocre at best. 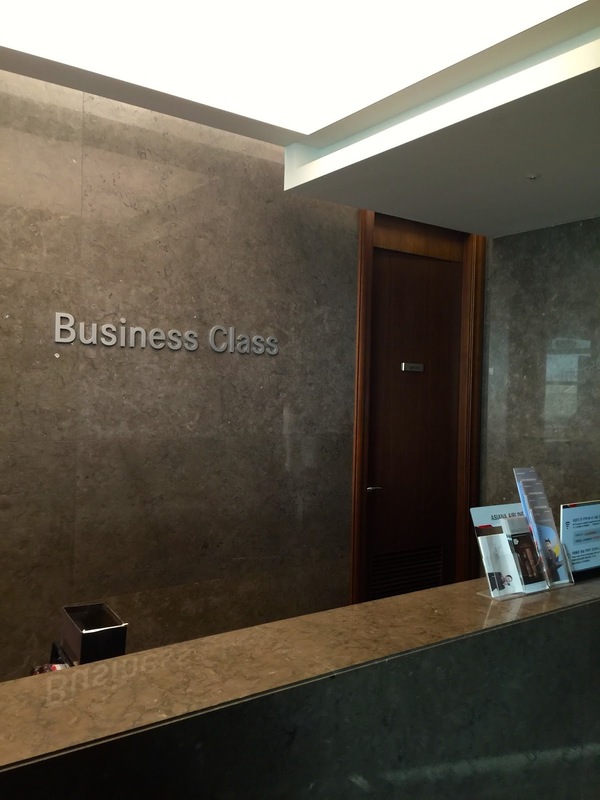 It is not a service standard that one would expect in Business Class section. We requested for additional pillows from one of the pursuers, but she did not come back with any, despite walking past us a few times. The seat my friend was occupying did not recline, not even an inch. We brought up the issue to one of the pursuers, whom literally stripped the whole chair in an attempt to fix it. After failing to do so for 10 mins, the pursuer gave up and consulted another pursuer (whom we believe should be the in-flight manager). The other pursuer came and also tried to fix the seat, but gave up and declared the seat defective after another 10 mins of trying. She later told us to wait and see if she can swap seats for us. After another 5 mins passed, she came back and told us to move to another seat occupied by a cabin crew. No help was offered to shift our carry-on luggage and the pillows and quilt. The said pursuer stood by watching as we were shifting our stuff in the middle of the night. When I brought up the issue of our request for extra pillows and no one gives a damn about it, the pursuer turned defensive and claimed that they need time to look for pillows. She finally gave us the extra pillows we asked for reluctantly. Unsatisfied with her attitude, I spoke to another pursuer about her who was passing by. The pursuer in question walked by and overheard our conversation and told me if there are any problems just speak to her directly and don’t need to talk to anyone else. That got to be the rudest and most defensive response I have heard, especially in Business Class where I thought passengers will be treated better. Most of the time pursuers were seen crowding in the pantry talking amongst themselves rather than going around to see if any passengers needed anything. 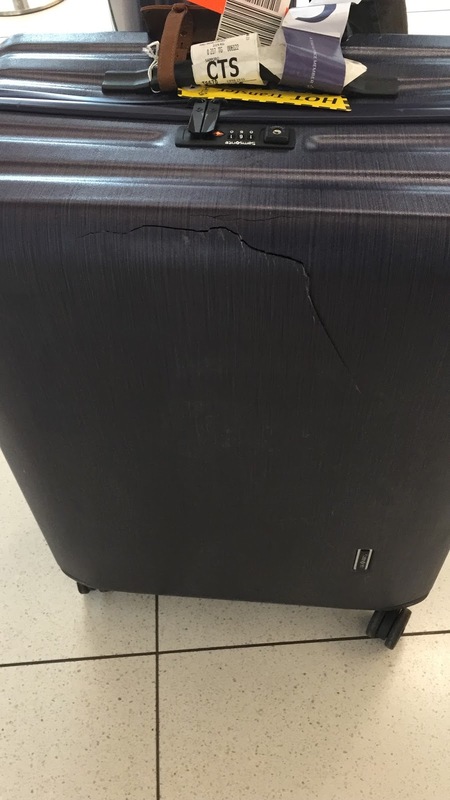 To make matters worse, I found my luggage damaged with a 30cm crack despite the fragile tag being tagged onto my luggage. Makes me wonder if these fragile tags are for show. The service on the CTS-BKK leg was slightly better than the BKK-CTS leg. Upon boarding, one of the pursuers noted that my friend cannot take beef and notified us of the diet restriction. When the meal was served (despite all 3 options not having any beef), my friend was served the vegetarian meal. My friend asked if he can choose the bento option (there is no beef in that option), the pursuer who brought him the meal told my friend that his meal is a special order, hence he cannot order anything else from the menu. When questioned that all 3 options do not contain beef, the pursuer than offered to bring my friend something else if there are any leftovers. I was rather puzzled by this remark. She later came back with more food for my friend, which looked like something she pulled together from Economy Class Section in a sloppy presentation. While it is a nice gesture that the pursuers took note of my friend’s diet restriction, however, it is rather disheartening to learn that my friend cannot order anything from the menu when all 3 options had no beef. I am not too sure why the inflexibility attitude displayed by the pursuer in a Business Class cabin. Although Thai Airways B777-300 is an ageing aircraft, I find the seats to be spacious and most comfortable in the lounge mode. The angled flat bed may turn some off but still provided good rest especially for a night flight. 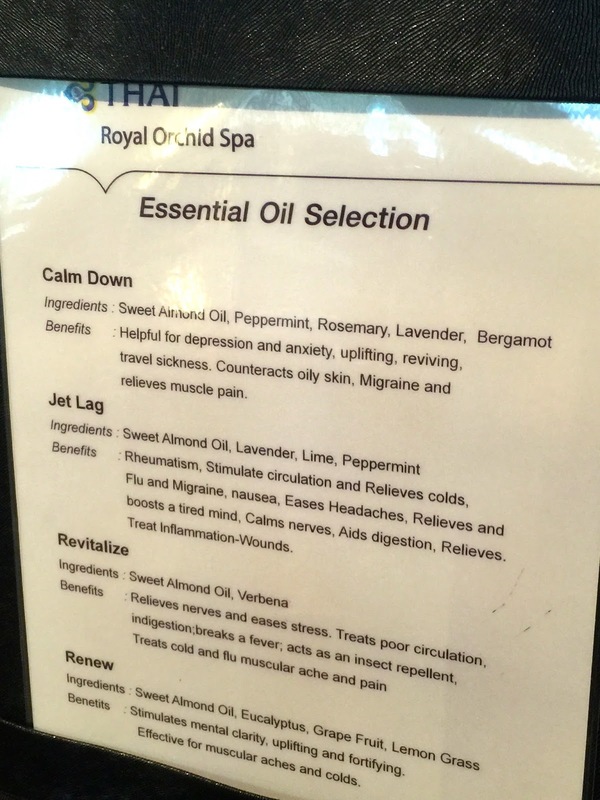 The lavatory is cramp and has not much amenities than the Economy Class lavatory less some orchids and handkerchiefs and more upscale Eau-de-cologne. 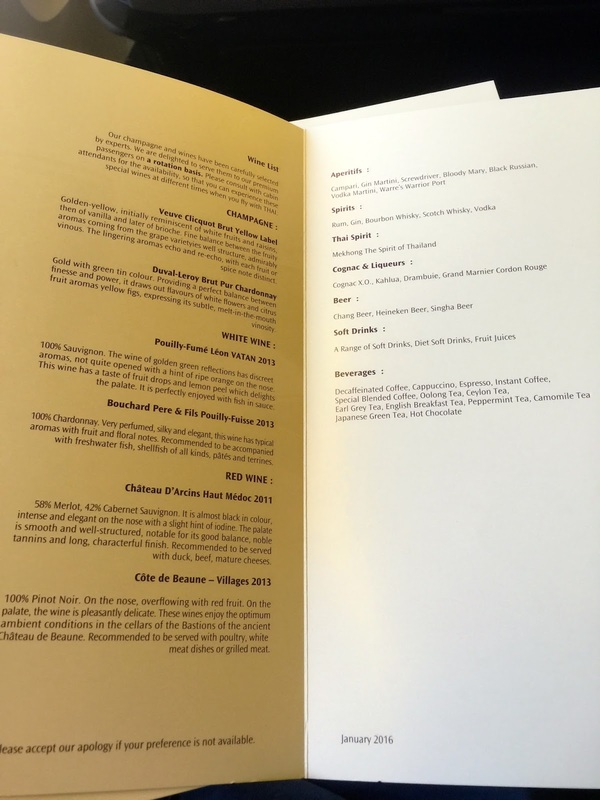 What shocked me the most is the service in the Premium Business Class cabin. Pursuers were defensive and did not render help whatsoever. 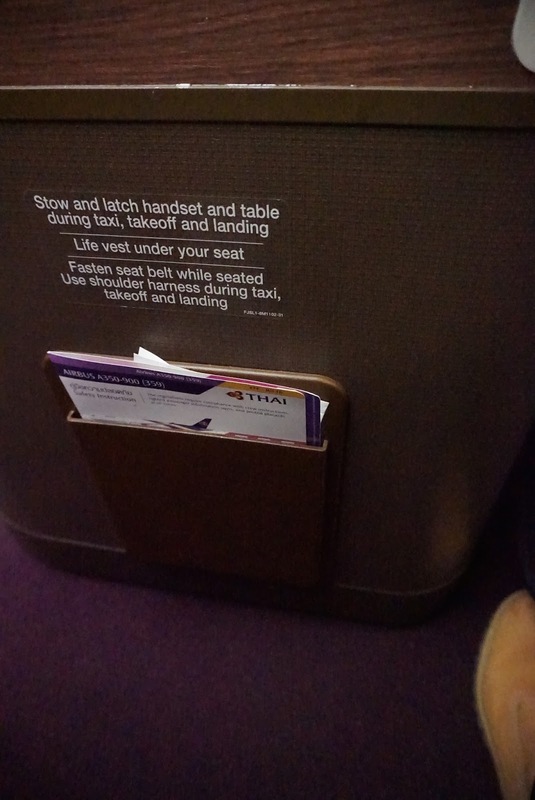 I find Thai Airways Business Class not worthy to spend that extra penny over with such lousy service attitude. 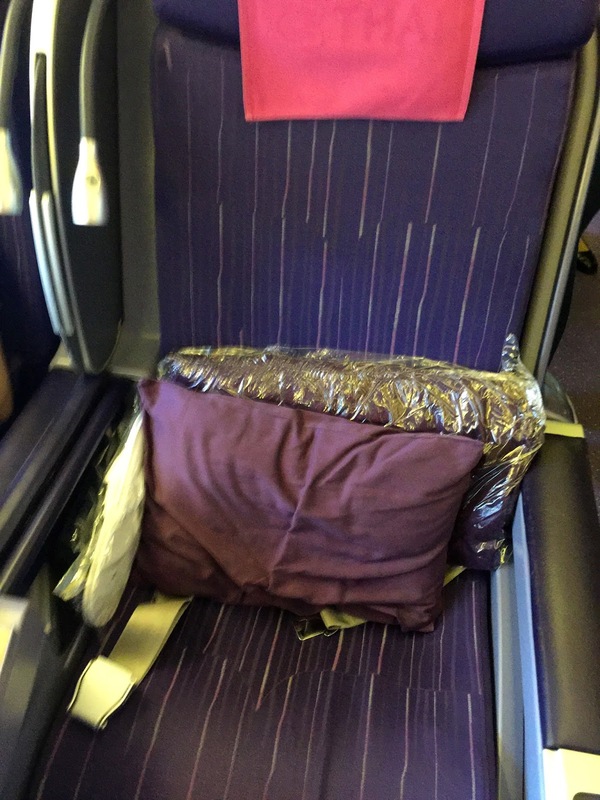 This is the last time I will be flying Thai Airways, especially in their Business Class. Thai Airways depart from Terminal 1 in Changi International Airport. The airline counter is located in row 4, near to the Skytrain in Terminal 1. Premium passengers are treated to check-in at the Dnata Premier Check-in Lounge at the end of Row 4. 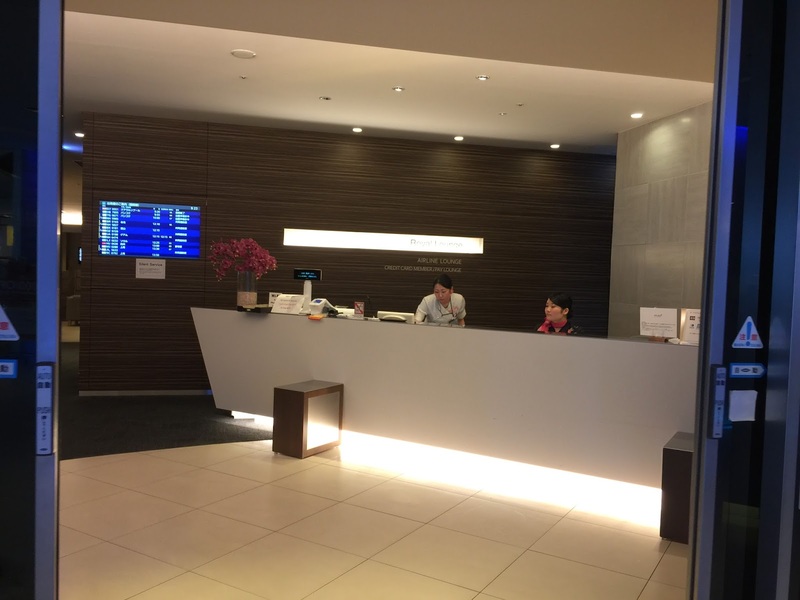 Checking in at the lounge makes one feel like a VIP, in the classy and earthy designed lounge. 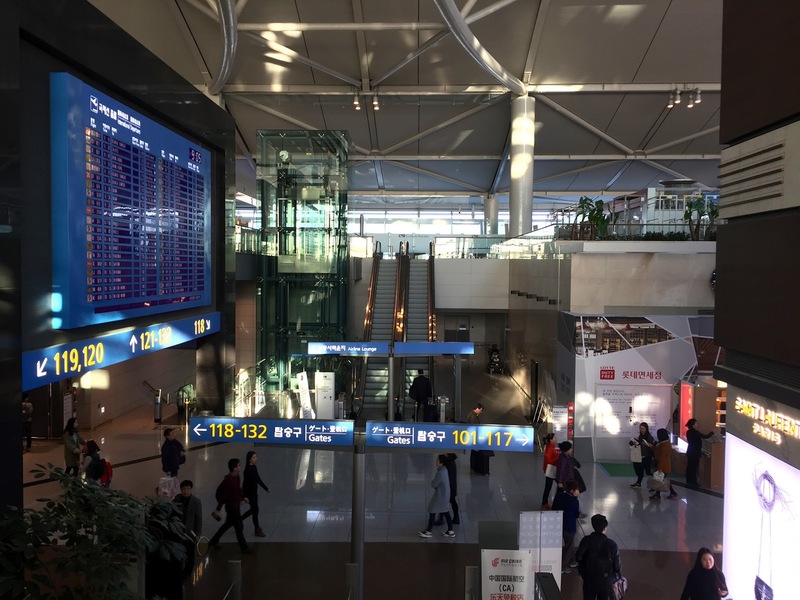 The check-in is very fast and the check-in staff briefed us on the standard items like where the gate is and what time is boarding. 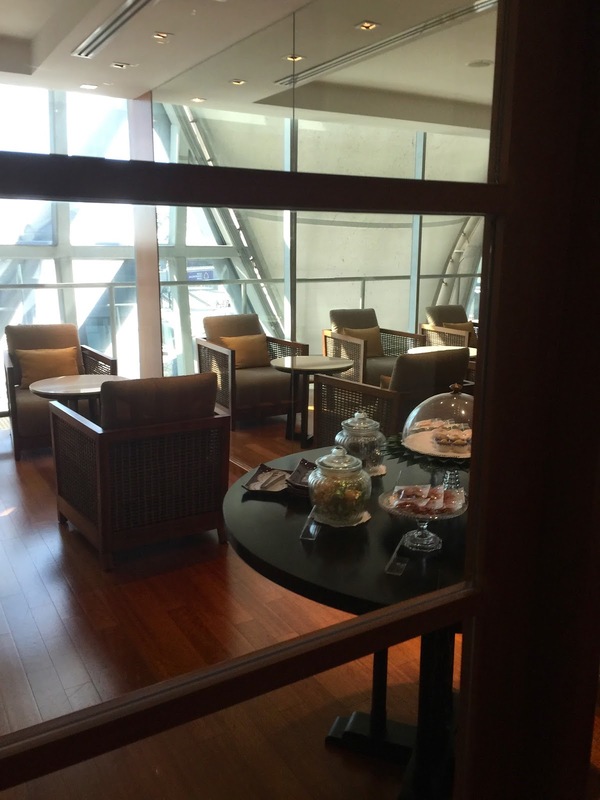 On top of that, we were also invited to the Thai Airways Lounge prior to boarding. 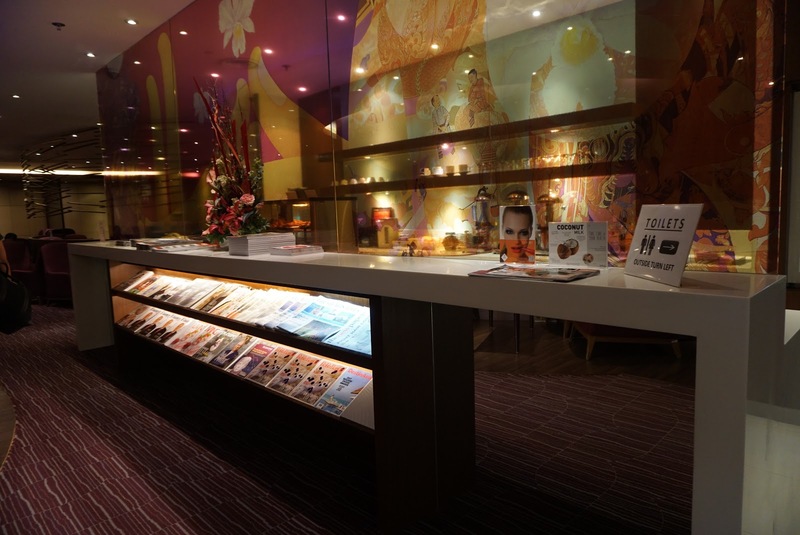 The Thai Airways Lounge is located one floor above the departure hall in the transit area. The earthy lounge is very comfortable and cosy and has a large seating area decked out with mostly armchairs. 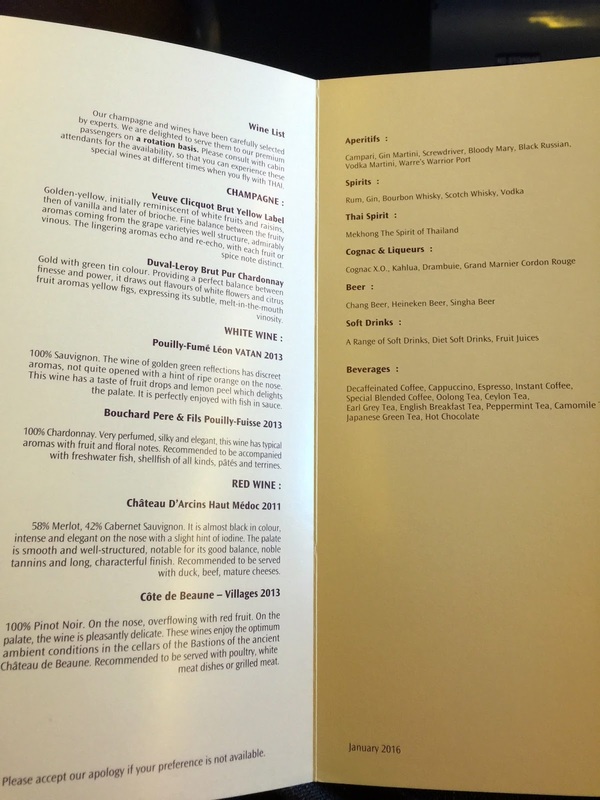 There are some simple finger food and drinks available for Business Class passengers to enjoy. Reading materials such as local and Thai newspapers, magazines are also available for passengers to read. 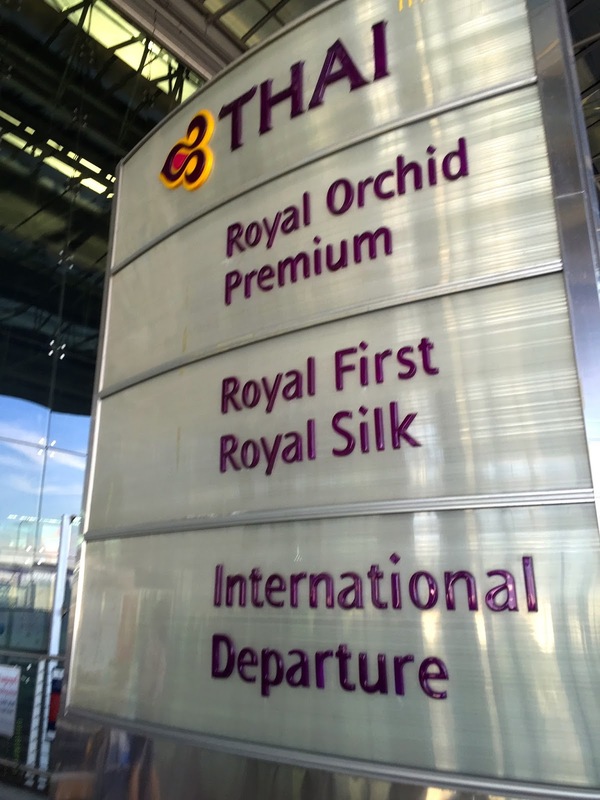 Thai Airways dedicates Row A, located at the left side of Suvarnabhumi Airport, for its premium passengers. Passengers are treated to sit-down check-in at that row and dedicated immigration clearance, which is empty at the time of my checking-in. The ground staff at Suvarnabhumi wasn’t as friendly as I thought. There were no smiles and conversations were non-existent. She just passed us our boarding pass and did not even mention which lounge is nearer to our gate nor where our gate was at. 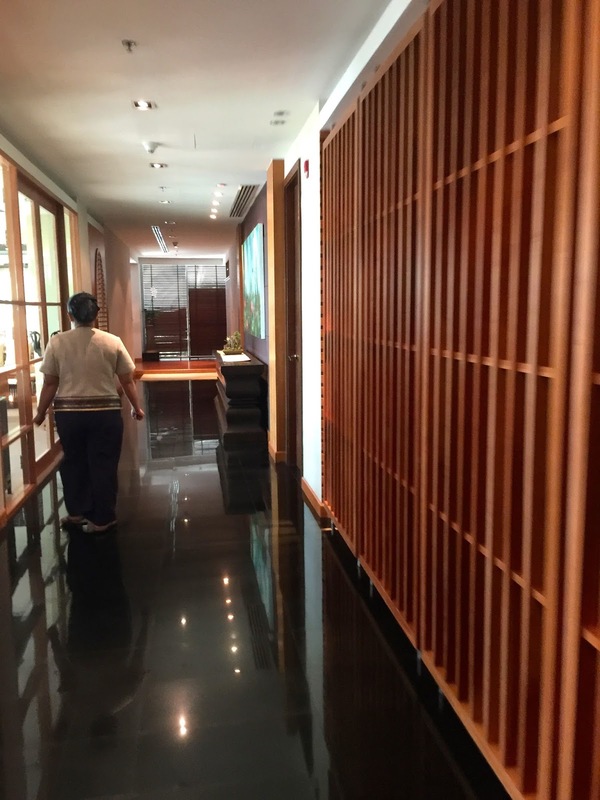 There are 4 Thai Airways Lounges for Business Class passengers and 1 Royal Orchid Spa Lounge in Suvarnabhumi Airport. Business Class passengers flying out or transiting Bangkok are treated to 30 mins head and shoulder or foot massage in Royal Orchid Spa. However, due to the time constraint, we did not have to go for the massage. We visited the Lounge in Concourse E, which is a fairly large lounge. 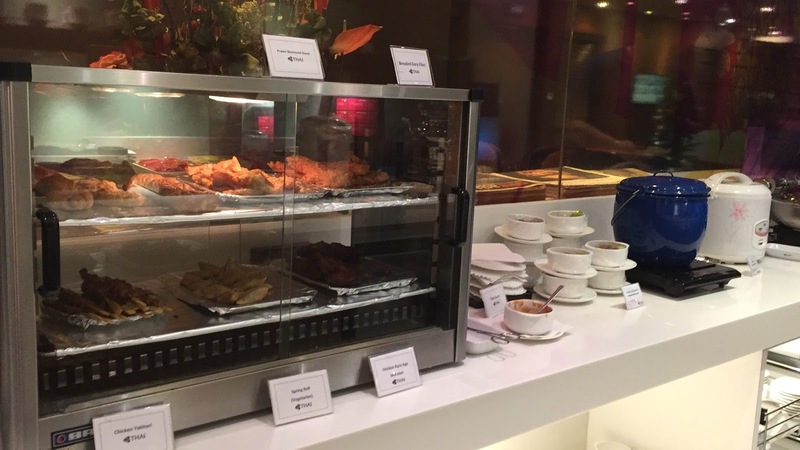 There are more food options here as compared to that in Changi Airport, food was seen topped up regularly to ensure there are sufficient to go around. 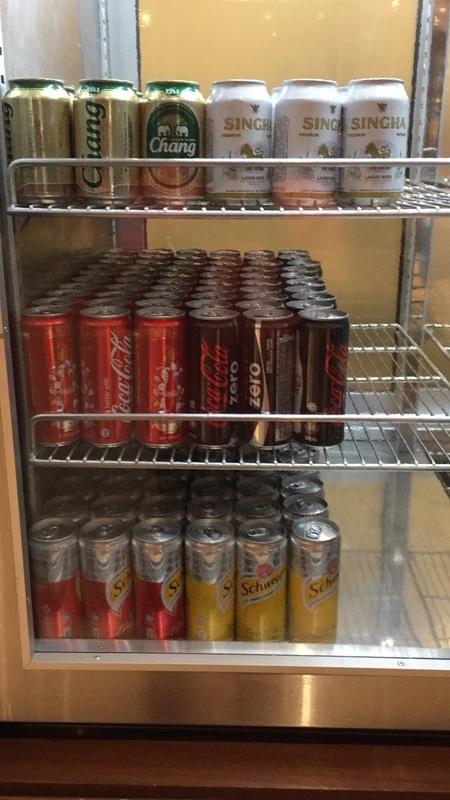 There is also a wide range of drinks available in the lounge. As with the lounge in Changi Airport, there are some reading materials like local newspaper and magazines for passengers to read. 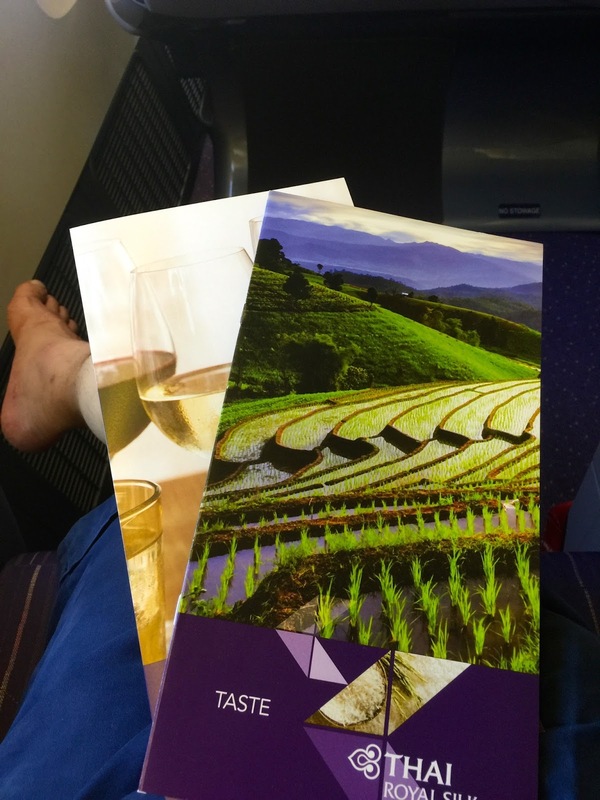 Thai Airways uses their new A350-900 for both legs of the flight. 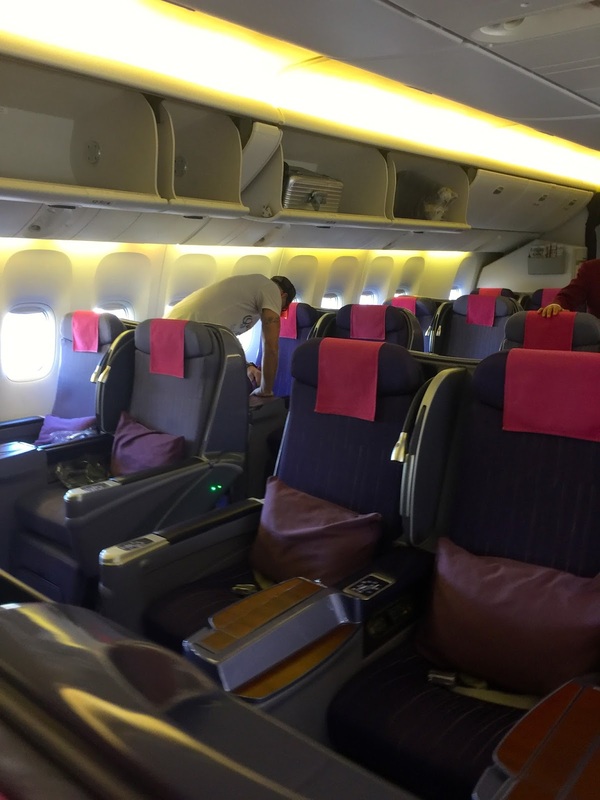 The new aircraft cabin still screams of the signature Thai Airways purple theme, and the seats look classy with the timber finishing. There are 32 seats in Business Class and 289 seats in Economy Class Section. 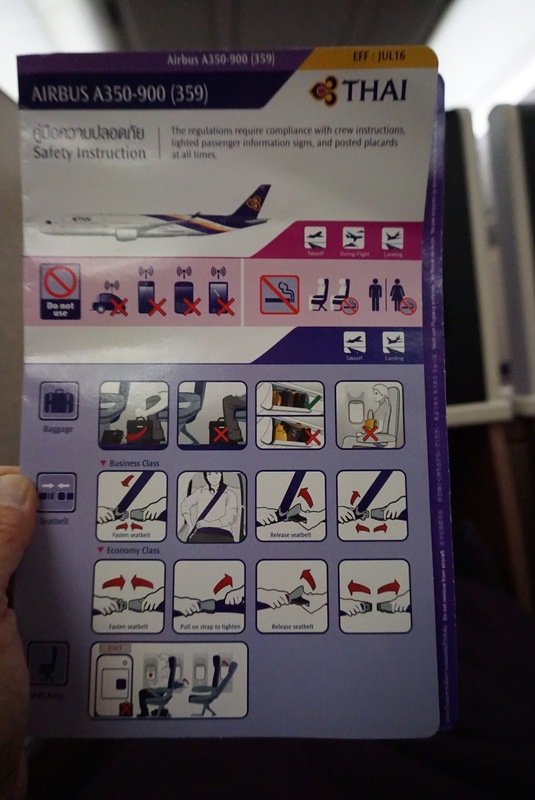 The seats in Thai Airways A350 are arranged in 1-2-1 configuration, which means all Business Class passengers onboard having direct aisle access. 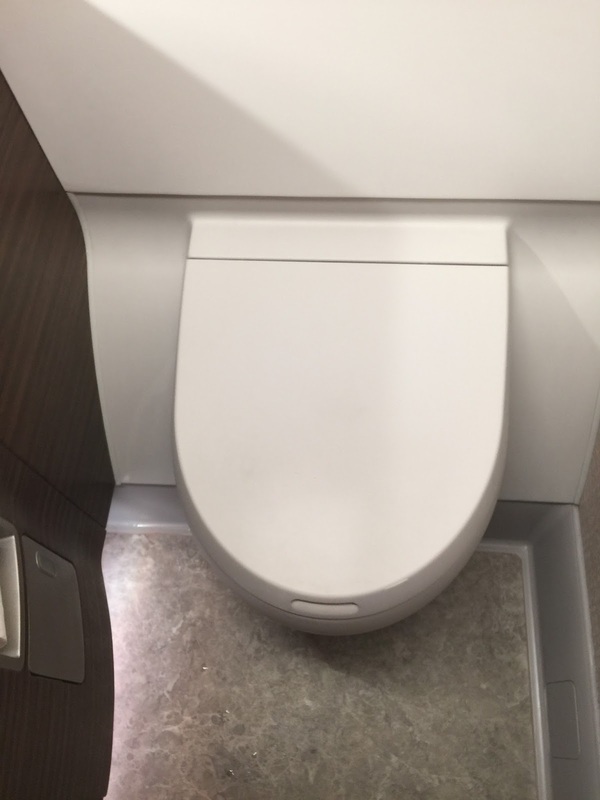 The lavatory onboard the A350-900 is a tad small. There is one at the forward of the cabin and 2 more at the aft of the Business Class cabin. There isn’t much amenities in the lavatory, feels pretty much like an Economy Class lavatory. What I like about the lavatory is the sensor tap and the sensor activated trash bin covers. 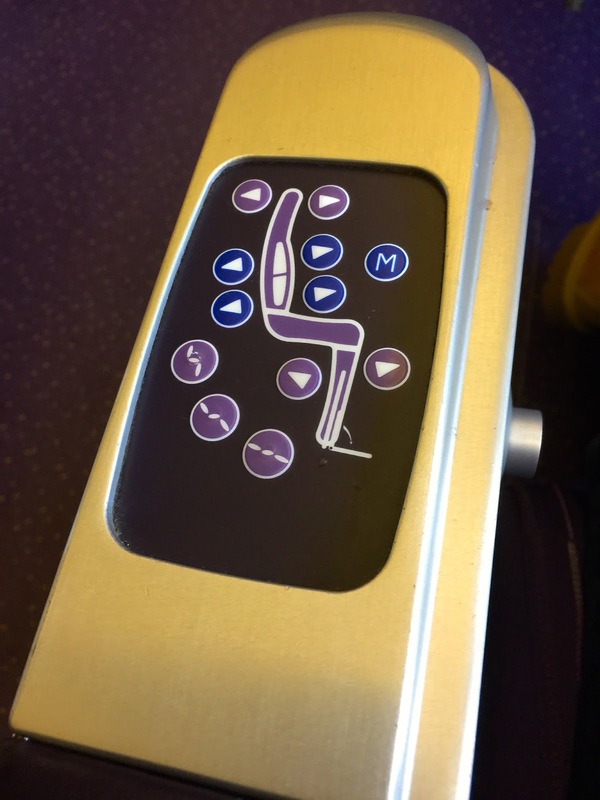 The seats onboard Thai Airways A350-900 has a pitch of Pitch of 73.5″ and width of 20″. The seats can be converted into a 180° truly flat bed. The seats has several mode other than being capable of converting into a flat bed, there is also a lounge mode, which I find it very comfortable to sit on while watching movies. Despite having a massage function, the massage function on my seat is not working. 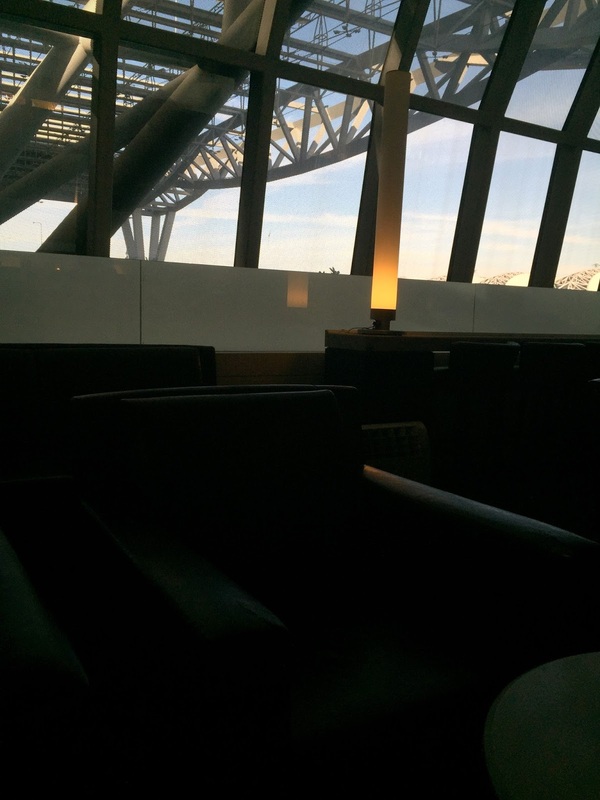 I find the seats a little cramp, especially in lounge mode where leaving and entering the seat is rather difficult. Seat controls are situated at the side of the seat at the side of the small table. 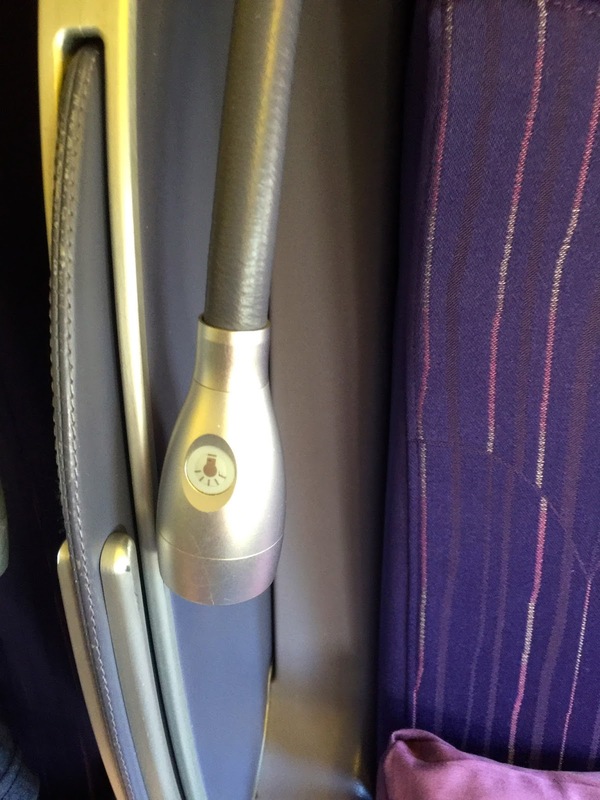 There are 2 lightings, including a reading light placed at the side of the seat. 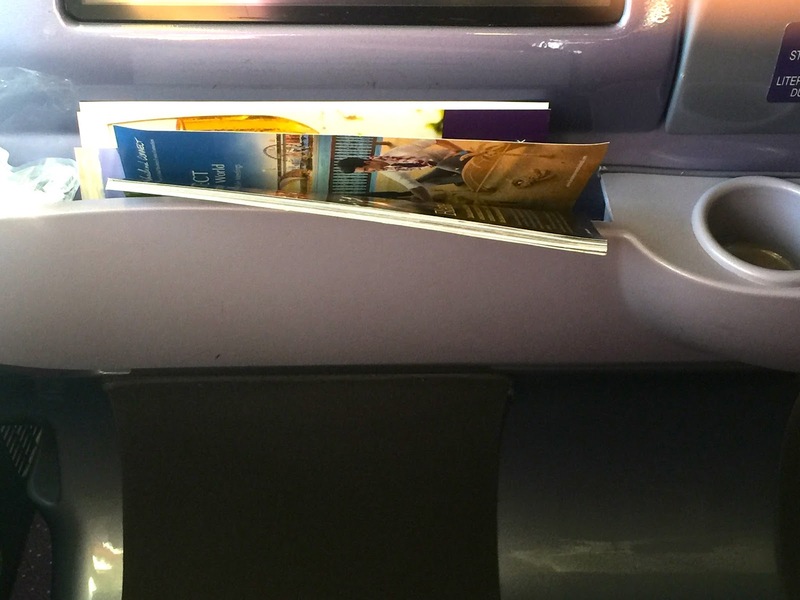 Inflight reading materials are placed in the pocket above the side table of the seat. There are several storage spaces at the lower side of the seat, however these impractical storage spaces can only hold magazines, they are too narrow to put my camera, and are too deep to place my passport into (it is rather dirty inside as well). International plug power sockets and headphone jackets are located at the side table, there is a USB outlet beneath the IFE TV. 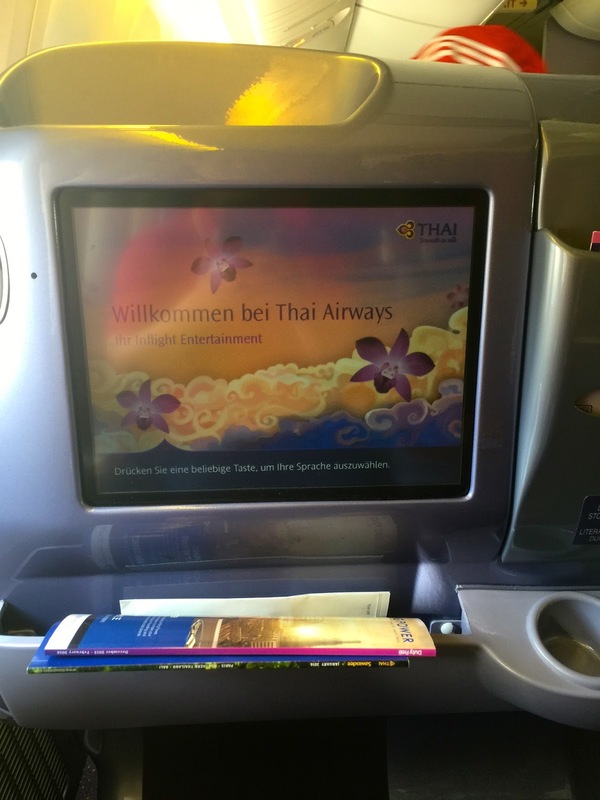 The new Thai Airways A350-900 has a 16″ flat screen TV in front of every seat. These touch screen TVs can also be controlled by the new generation, smart phone like controller at the side of the seat. The system is not at all laggy, which is very much welcomed. The IFE has a large library of movies, including latest movies to keep me entertained throughout the flight. Meal orders were taken prior to taking off, at the same time as the welcome drink is being served. However, I wasn’t volunteered welcome drink onboard and had to ask for one. What a bad start to the flight. After taking off. soon after the seatbelt sign was turned off, pursuers sprung into action serving the food that we have ordered. Food was not served by courses but was given all in one tray, much like Economy Class except that they are placed in more fanciful plates. I had the Seared Prawn with Sweet Chili Sauce, which I find the prawns to be rubberish. Pandan Sago Seed with Water Chestnut is being served as dessert, which I find tastier than the main dish. It is not too sweet and has a nice texture to it. 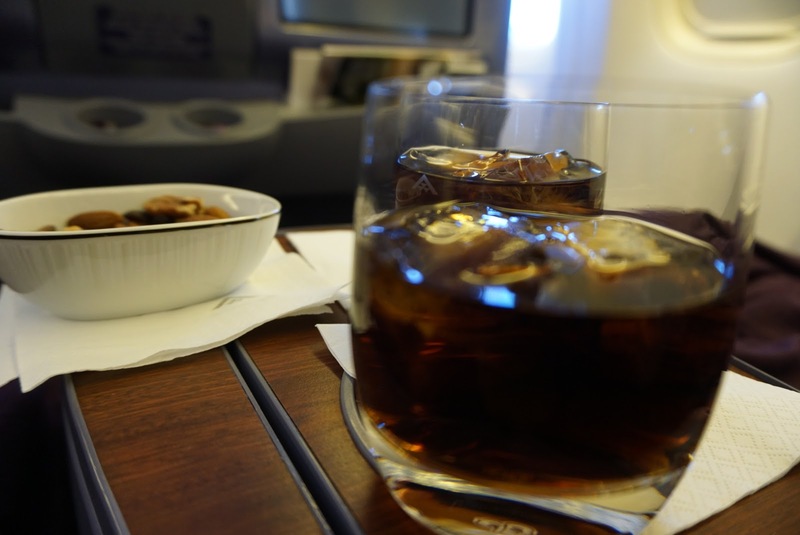 As with the outbound leg, welcome drinks were being served onboard prior to taking off. This time around I did not have to ask for it, it was volunteered. However, the male flight attendant did not know the name of their signature drink. We had to ask for it from another flight attendant. Meal orders were taken. No nuts were served prior to taking off. 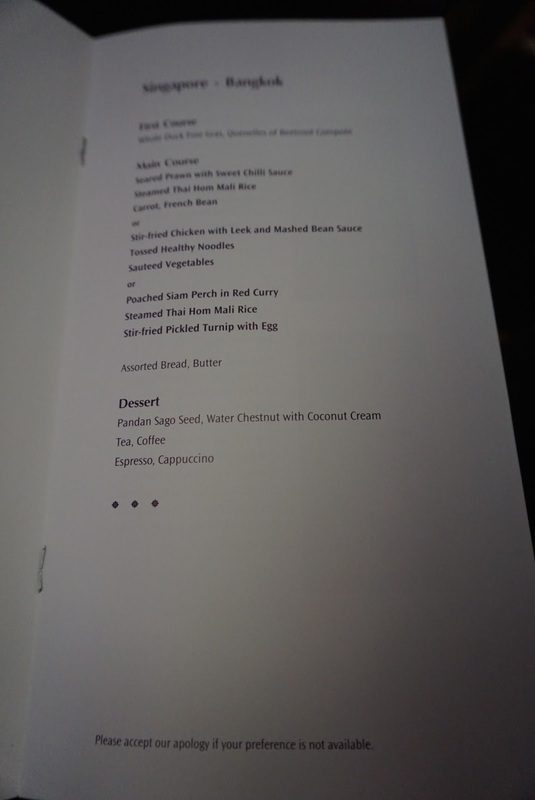 After taking off, we were promptly served the food that we ordered, which again was served all at one go instead of by courses. I had to Fried Prawn inLychee Sauce. The fried prawn wasn’t crispy but tasted great with the lychee sauce. I particularly like the Fried Rice that comes with the prawn dish, which tasted good and not too oily. We were served salmon and chicken breast as the appetiser, which I find them to be tasty. I did not take the dessert as I was full. 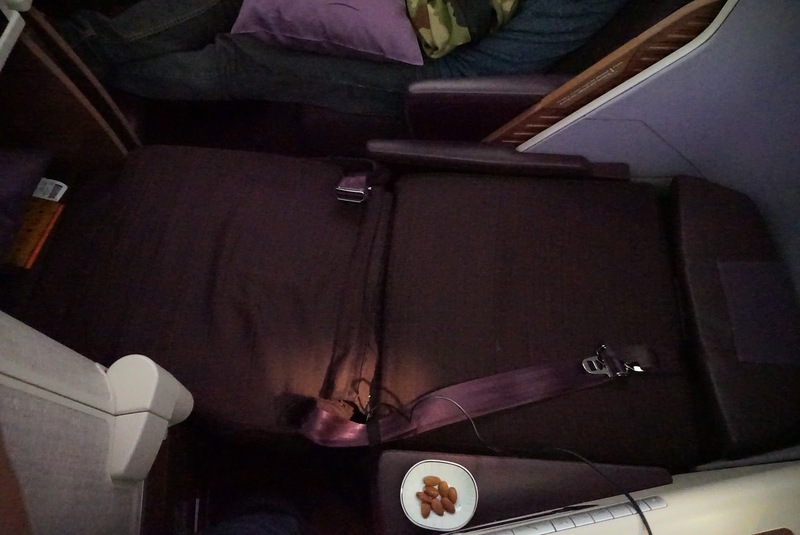 Service was lacking onboard both legs of the flight, not befitting of Business Class. I felt no different than flying in Economy Class. 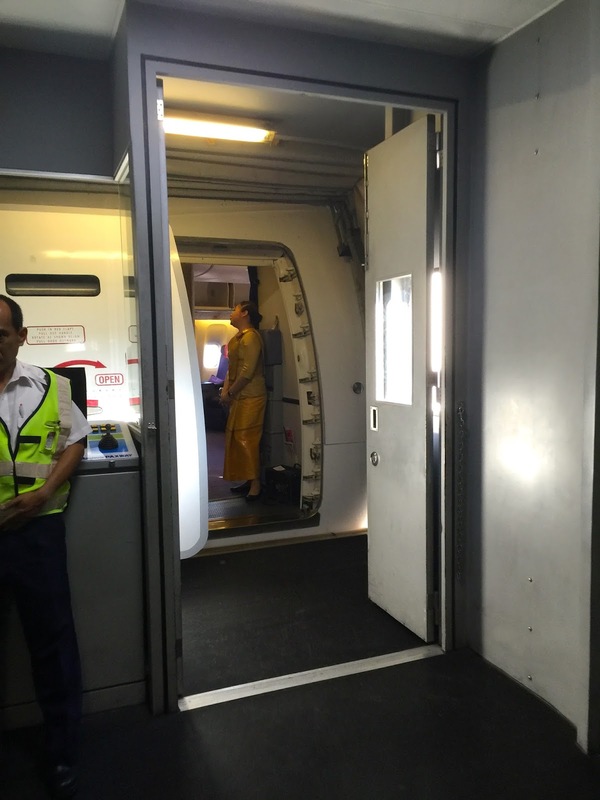 Flight attendants were seen just doing their job, instead of making passengers feel welcomed. No help was rendered to any passengers in storing their carry-on luggage in the overhead compartment. Service is bad on this leg. The pursuers were not smiling and not making passengers feel welcome onboard. 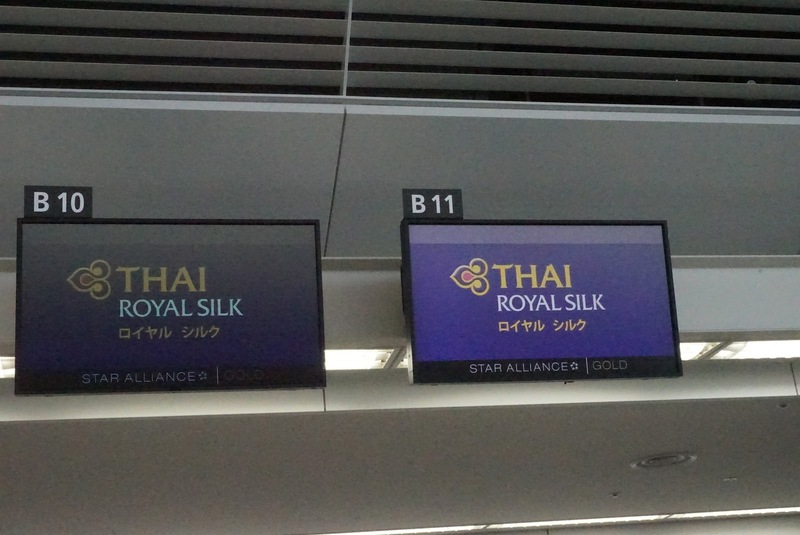 This makes me think that the signature Thai smile I have seen in Thai Airways advertisements is just for advertisements. I was conveniently skipped when serving the welcome drink. The tray tables were set up very sloppily, with the attendant holding onto the food in one hand and trying to set up the table with the other. I helped the flight attendant to lower the tray table and layout the tablecloth, she did not even utter a word of thanks. 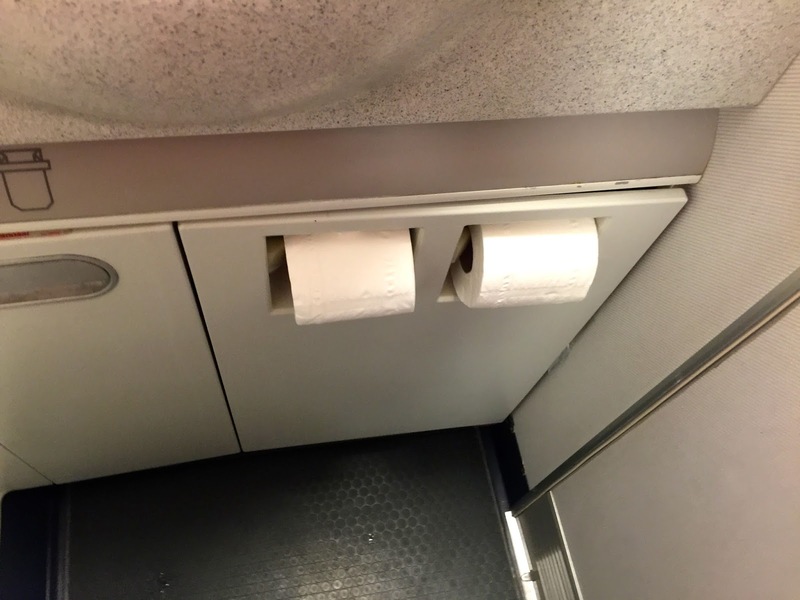 The worst service got to be rendered from this leg of my flight. A male attendant serving us was constantly in a foul mood. No smiles came from him. When asked for their signature welcome drink, he did not even know what that was and wanted to give us coke. 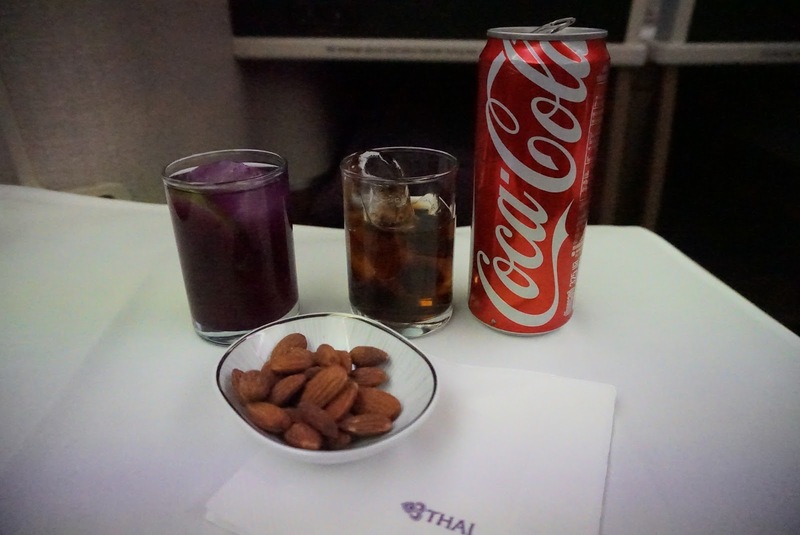 I had to ask another flight attendant for the Thai Airways Signature drink. The same foul mood male attendant did not seem to understand the difference in service between Business and Economy Class. I was handed food over my friend, who was about to had his dinner. 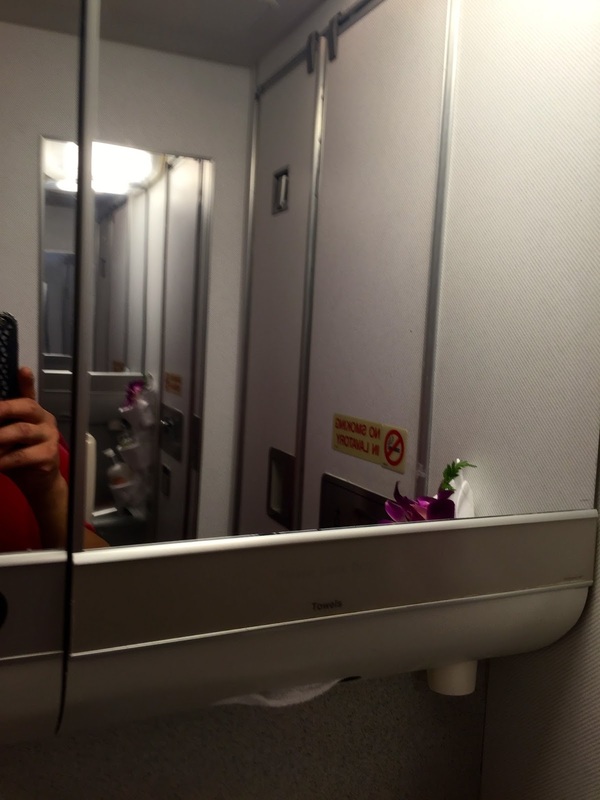 The male flight attendant simply did not care if my friend was eating. Instead of putting the food down onto my table, I was made to take over the food from him and placed them onto my table. 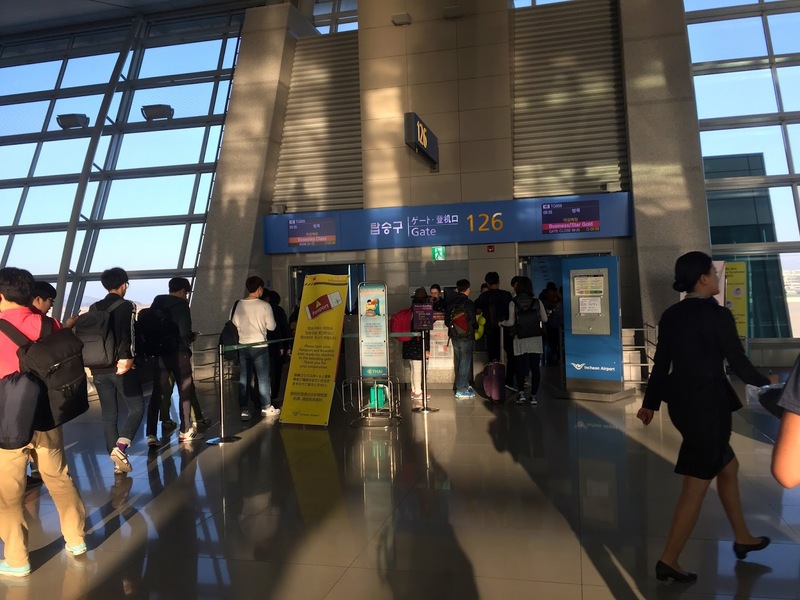 There is another incident involving the same male flight attendant. 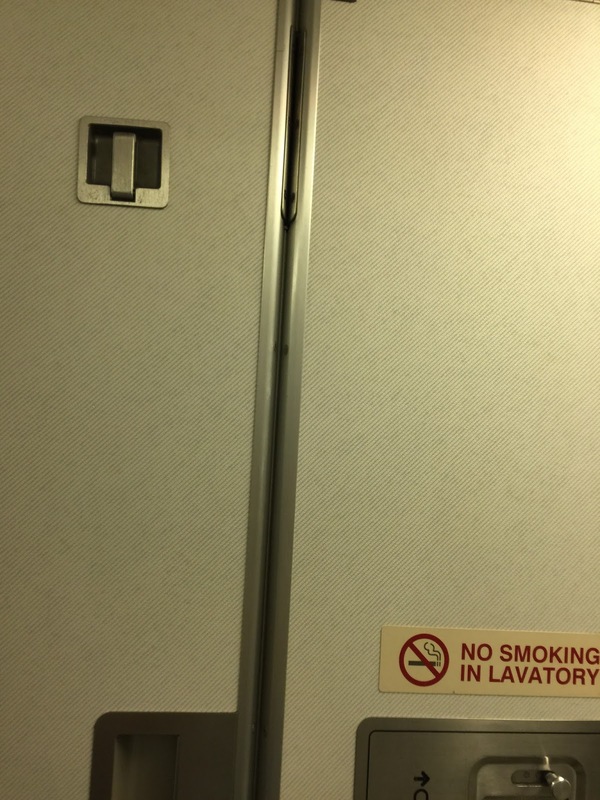 After the seat belts signs went off, I went to the lavatory. The light outside the toilet suggested that no one was inside the lavatory. I was trying to open the lavatory door, and the male flight attendant saw it. He just ignored what I was doing, but after some time, he must had felt irritated and told me “Someone inside” and ask me to wait. A female passenger came waiting for the same toilet and he actually told her there is 2 more behind. He could have told me the same information instead of making me wait for the toilet. I overheard him telling the passenger in the toilet before me to lock the toilet door properly the next time he uses it. While the only A350-900 recently joined the Thai Airways fleet, I thought the use of space for the seats a little lacking. There is not much practical storage space for some gadgets like mobile phones and cameras. The side pocket is too deep and too dirty to be useful. 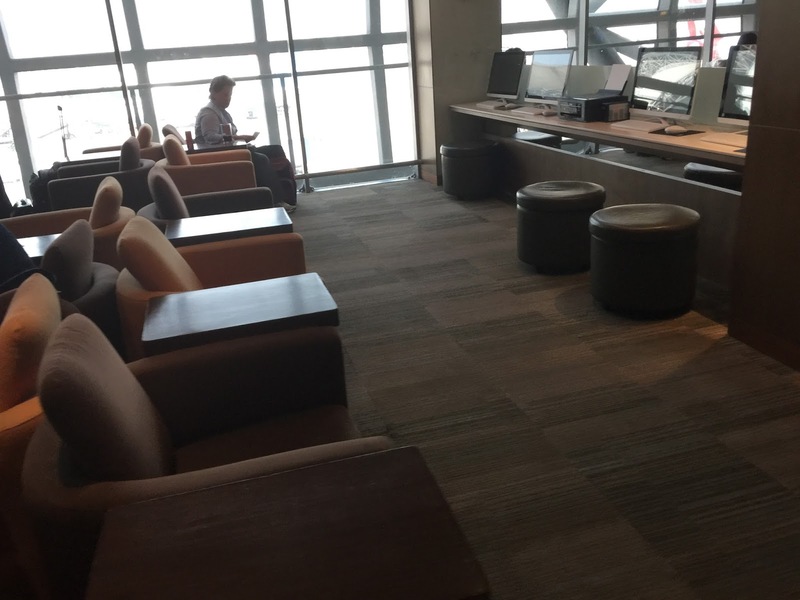 The seats feel cramp and were difficult to enter and exit when in lounge mode. 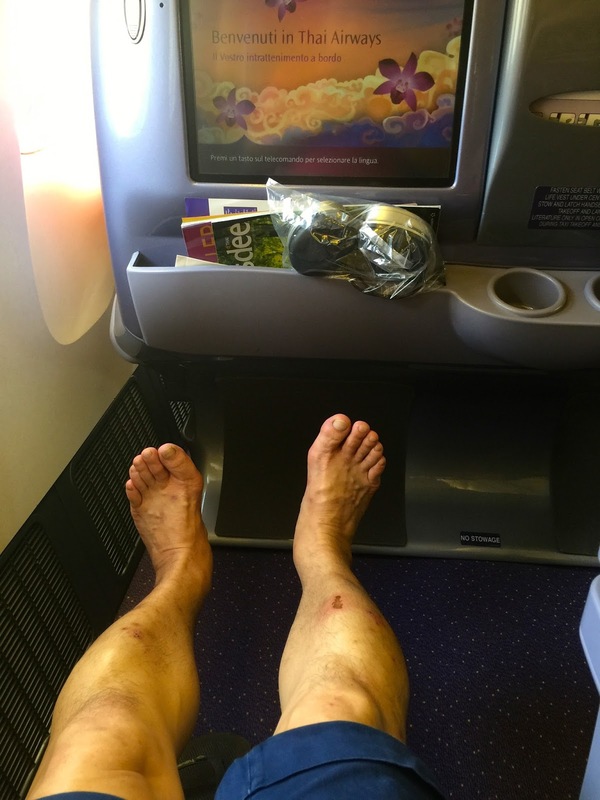 The massage function did not work on both legs of my flight onboard the A350-900. The amenities in the lavatory is lacking. What irritates me the most is the service onboard. The attendants made me feel as though I was flying in Economy Class. Not much smiles from anyone and certainly no help was rendered. The worst is the male attendant who did not even know the name of Thai Airways Signature drink. Food was passed over my friend’s head by the male attendant. 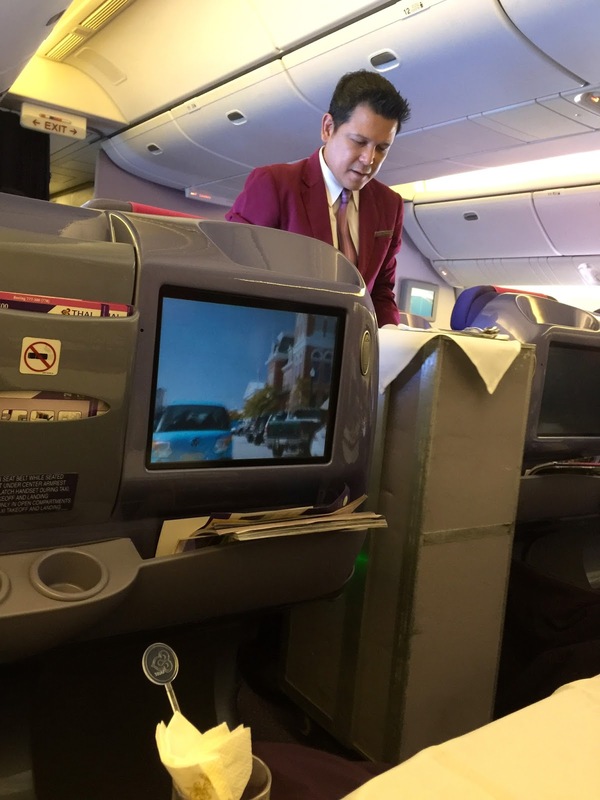 After this experience, I will not take another Thai Airways, especially in their Business Class. They are not worth paying a premium for. 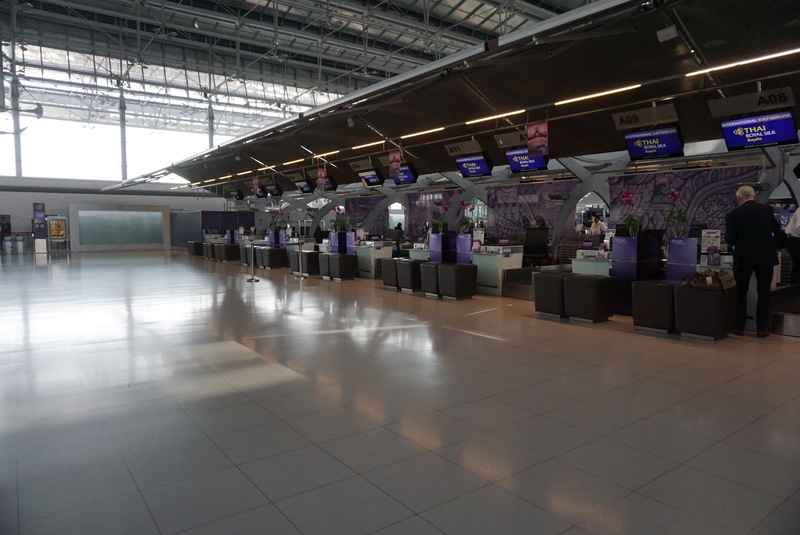 Thai Airways has a dedicated check-in area for their premium passengers. Passengers flying in First Class or Business Class checks in at row A. 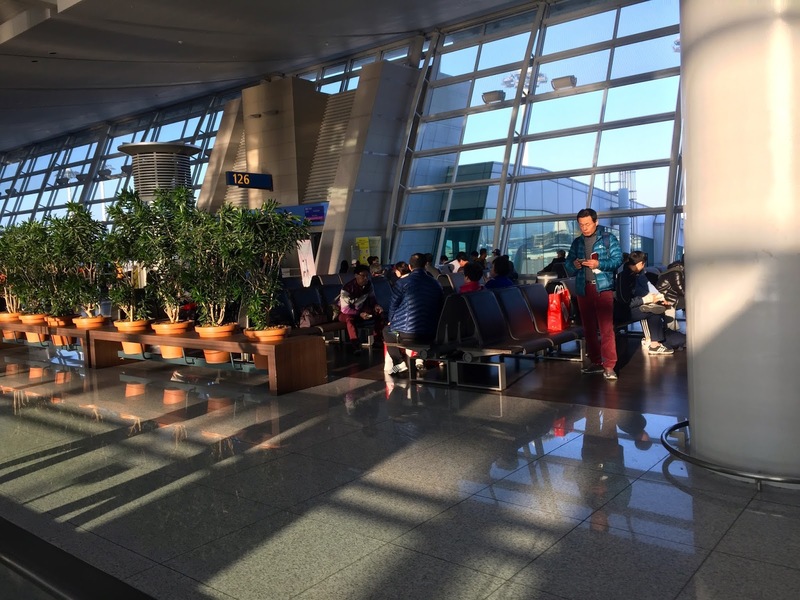 Unlike a proper check-in lounge that some airlines operates at their country of origin, the premium check-in area is essentially a whole row of check-in counters with chairs for premium passengers to sit while the ground staff process their check-in. First Class passengers have a separate check-in area in this row. 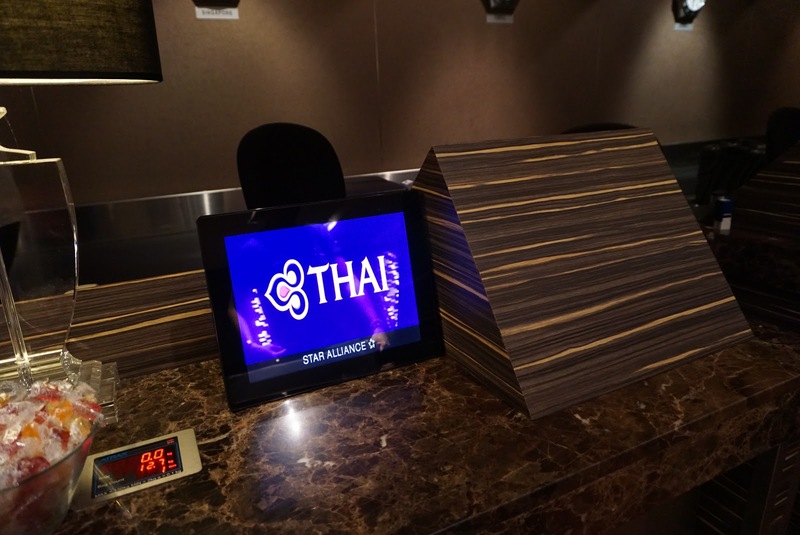 Checking-in is swift as I already done on-line check-in through the Thai Airways mobile app. What I like about the check-in at Suvarnabhumi Airport is the Fast Track immigration, which is located at the end of the check-in row. 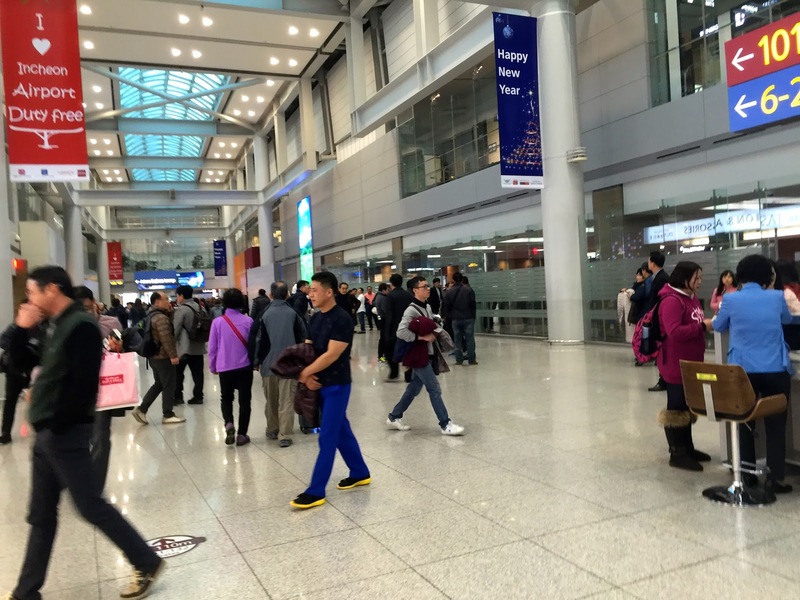 At the time of my checking-in, there were no queues and we made it through the immigration in under 5 mins. 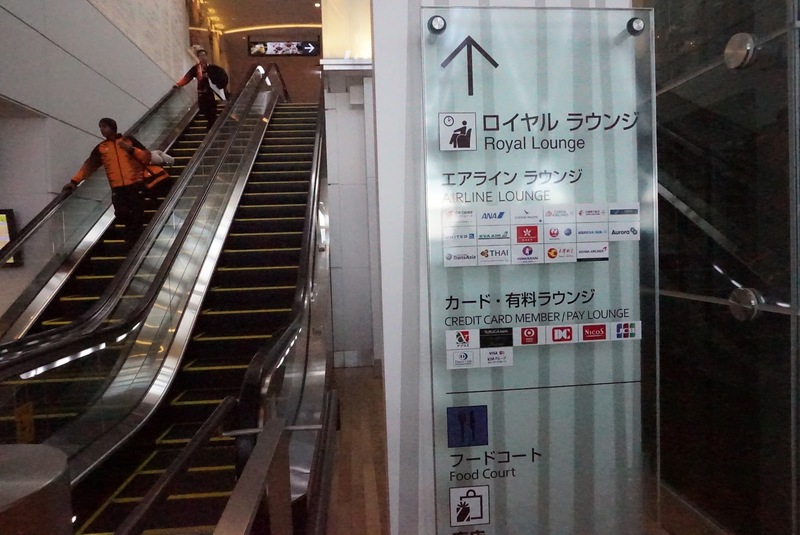 After the immigration area, access to the lounge is just down the escalator located behind the immigration counter. 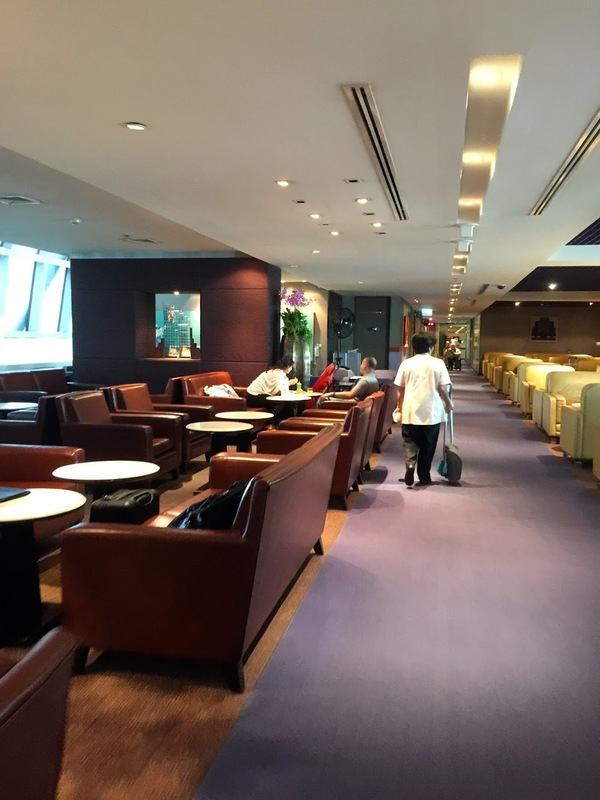 Suvarnabhumi Airport is the home to Thai Airways and there are a few lounges that passengers can gain access to. 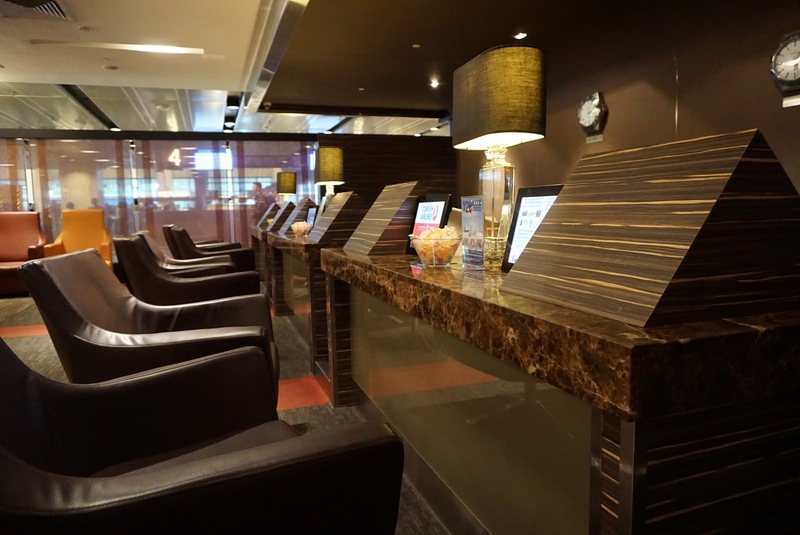 Passengers can visit any of the lounges and choose the lounge that is closest to their departure gate. 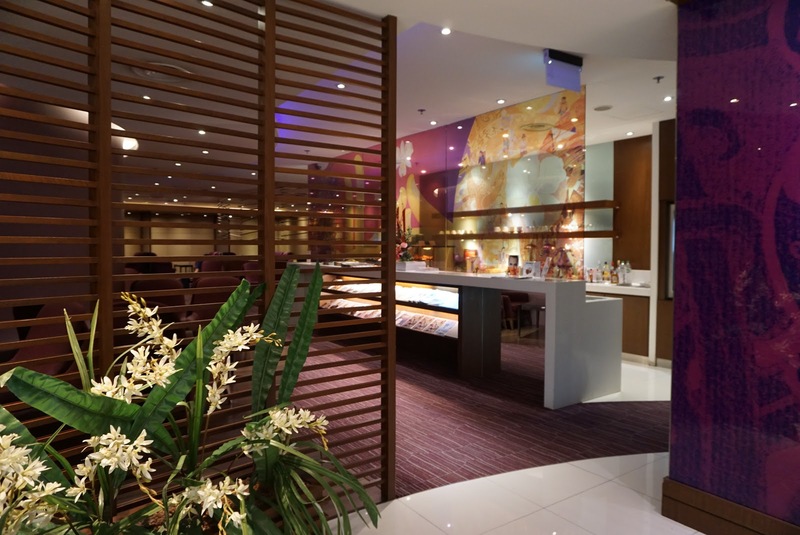 The lounge that is linked to the immigration area at the premium check-in counter is the largest lounge at concourse D. Royal Silk Lounge at Concourse D is spread across a total floor area of 1400 sq , decked in earthy tones, the lounge has ample rest space for their premium passengers. 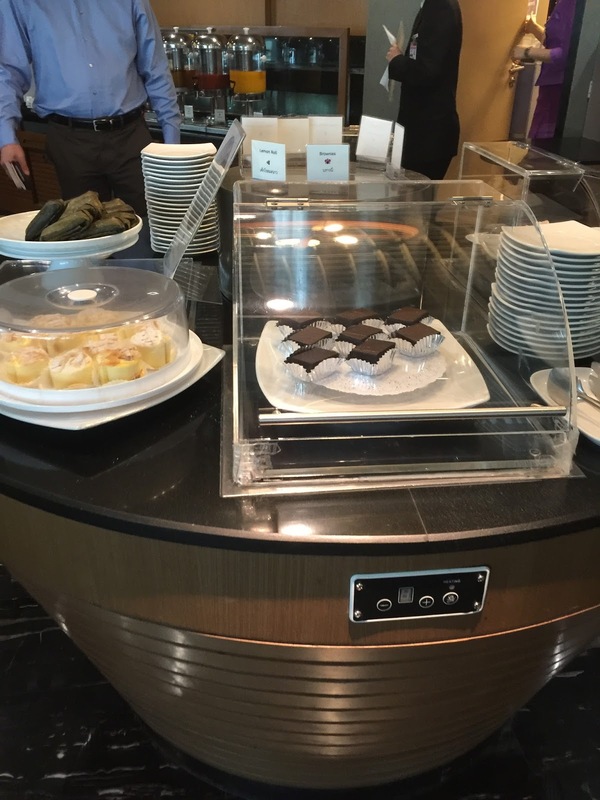 The food offering at the lounge is limited to finger food and the standard beverages. Despite the large size, due to the decor of the lounge, it felt rather cosy. 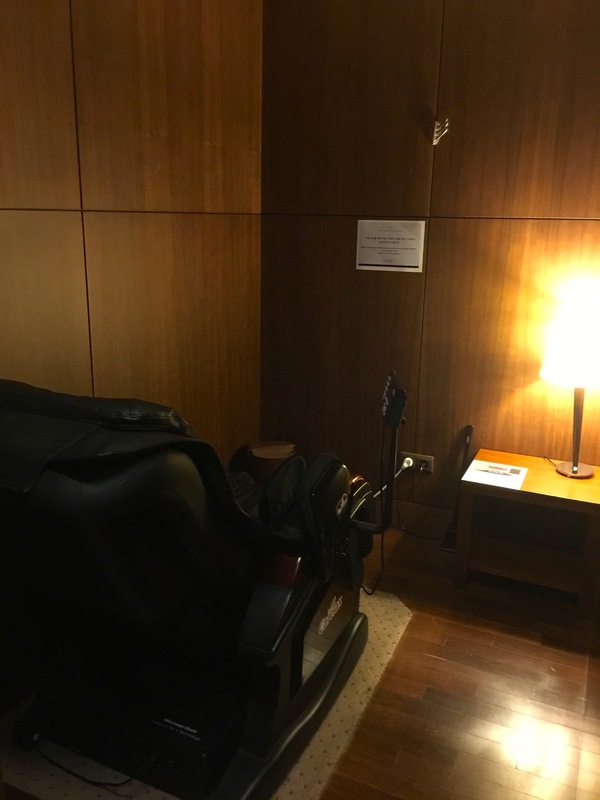 We did not stay at this lounge long as we headed for the Royal Orchard Spa for our massages, which is located right across the lounge at Concourse D.
Business Class passengers are treated to a 30 mins foot massage or a head and shoulder massage at the Royal Orchard Spa. 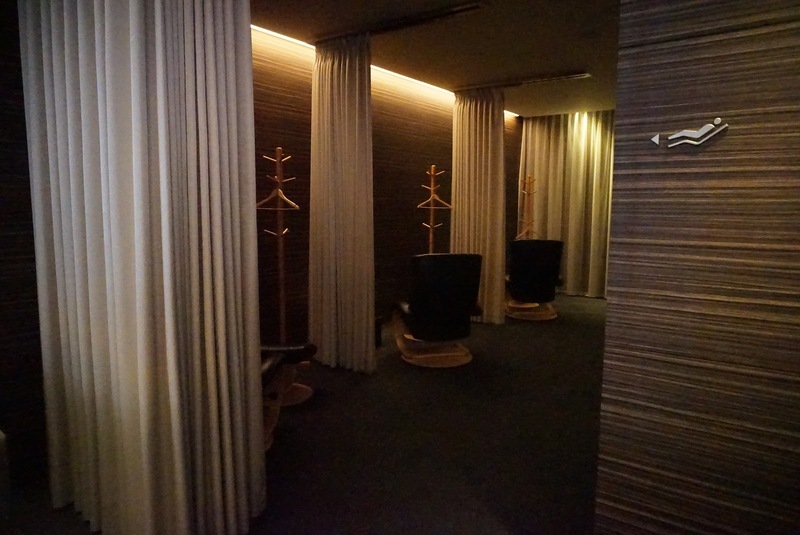 The spa lounge is decorated with mainly a wooden theme that gives its visitors a sense of zen when entering. Upon entering, the friendly ground staff asks for our boarding pass and arranged masseuses promptly, whom will take us to the treatment area and began the massages session. I opted for the foot massage, which the skillful masseuse did her magic on my weary legs. The skills of the masseuse is comparable or even better than some of the massage palours one can find in Bangkok. The massage totally took away the tiredness on my legs and my legs felt refresh after the 30 massage session. 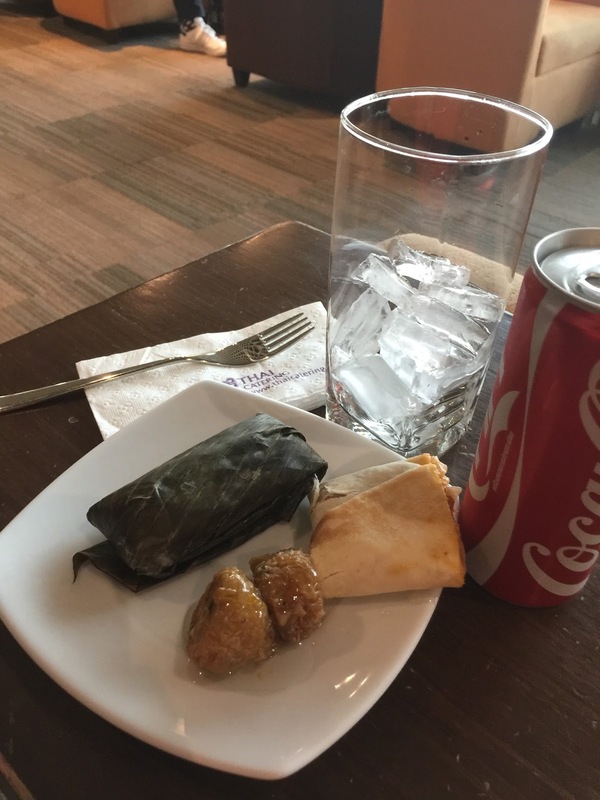 As we did not have time to shop around, we headed back to the lounge we had entered from immigration (it is the nearest to our gate) and enjoyed some finger food. 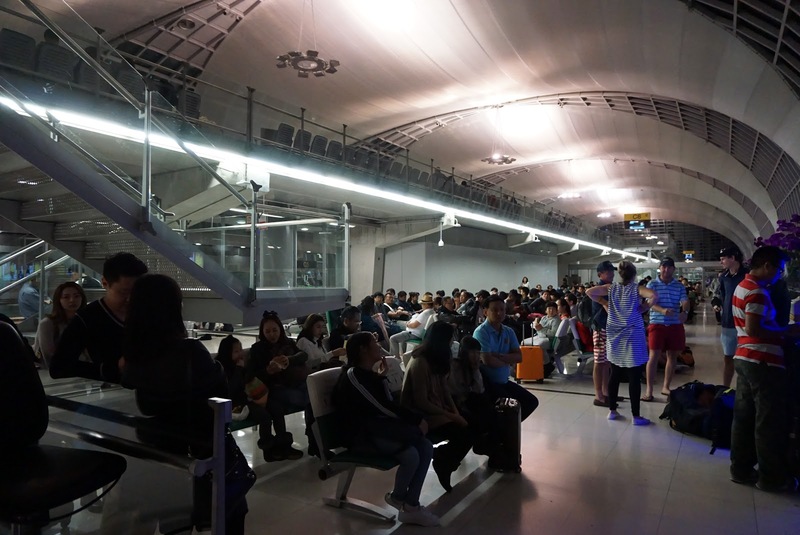 The waiting area was rather crowded, signalling a full flight on this BKK-SIN leg. At the gate, Thai Airways ground staffs checked our boarding pass and invited us to wait at the waiting area. 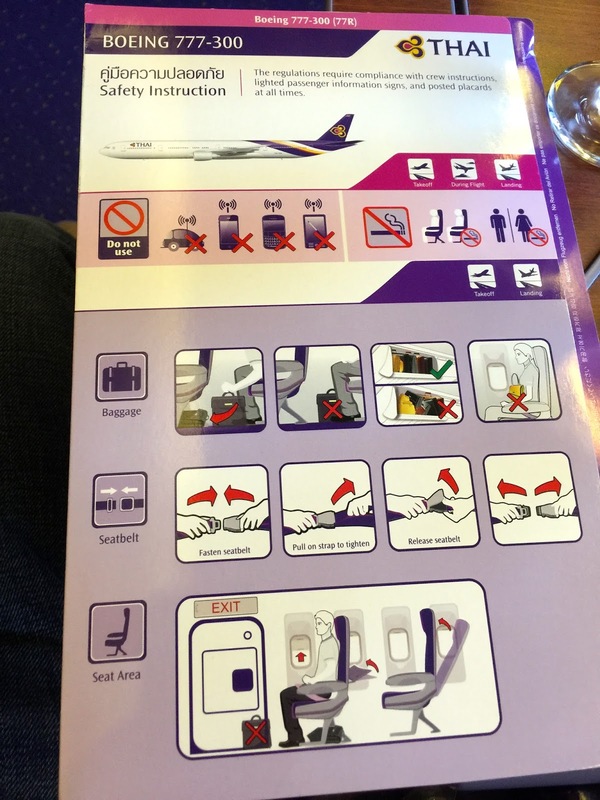 As with most airlines practice, Thai Airways boarded their premium passengers as well as passengers who needed assistance. 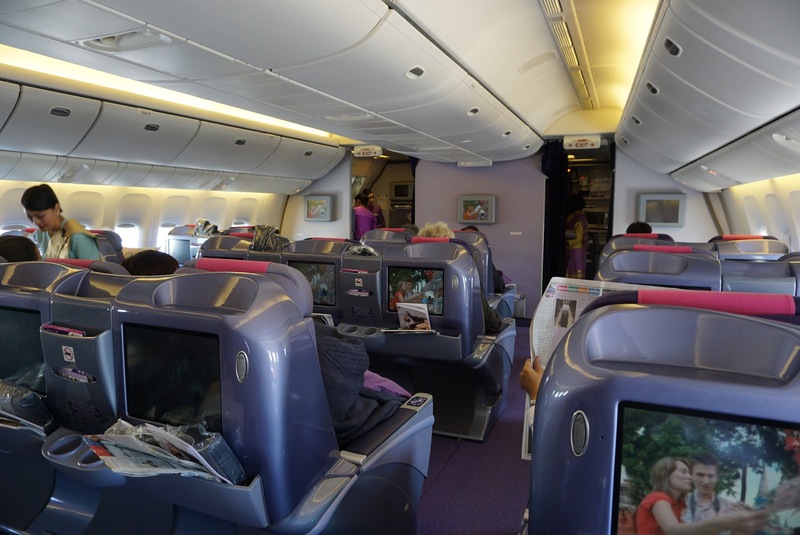 Entering the Business Class cabin, we were welcomed by the familiar Thai Airways purple coloured cabin. 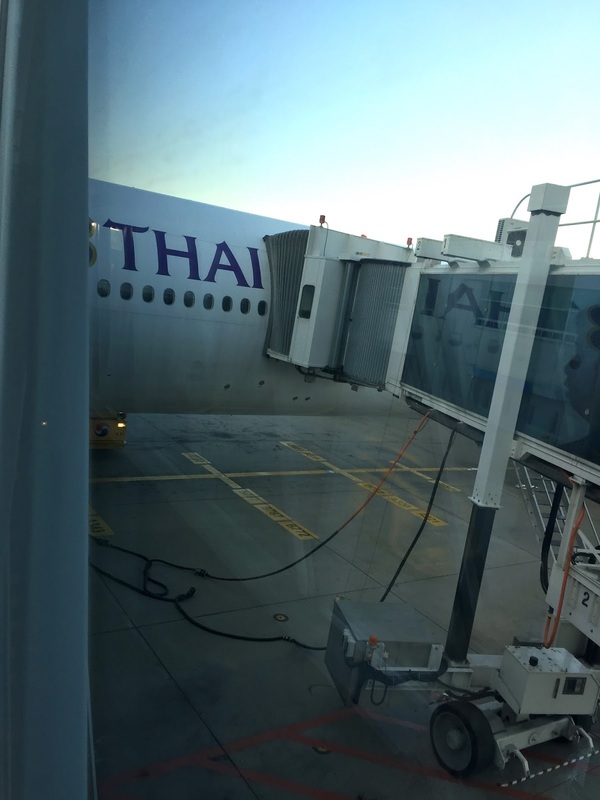 Thai Airways uses the Boeing 777-300 aircraft for this leg of the flight. The aircraft is fitted with 34 seats in Business Class and 330 seats in Economy Class. 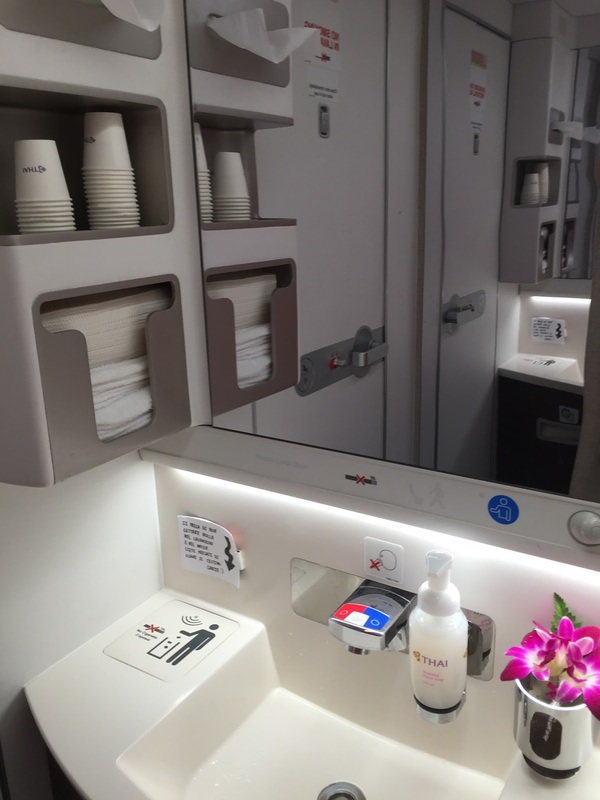 As with most of the Thai Airways aircraft, the 2 lavatories are located in front of the Business Class cabins, just before the cockpit door. 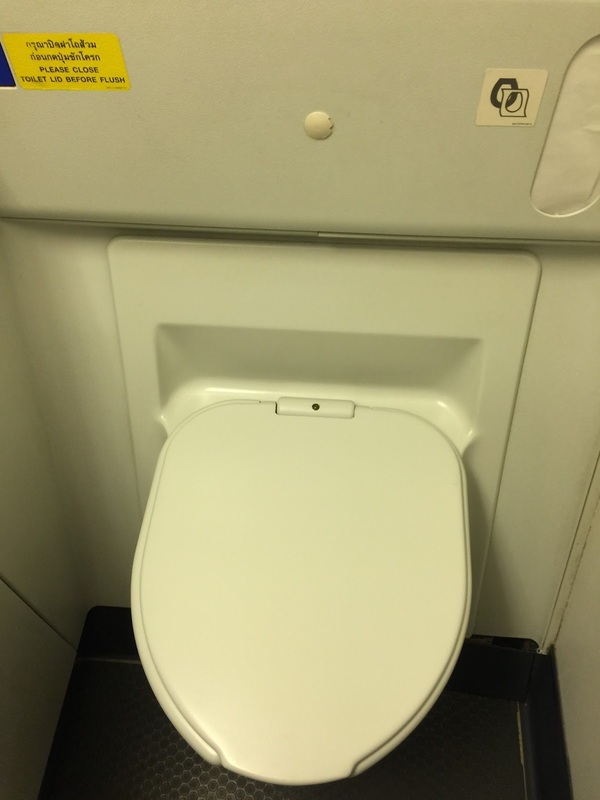 The lavatories are a tad small for Business Class cabin, but fitted with the necessary hardware such as the toilet bowl and the sink. I particularly like the tap which is operated by sensor. 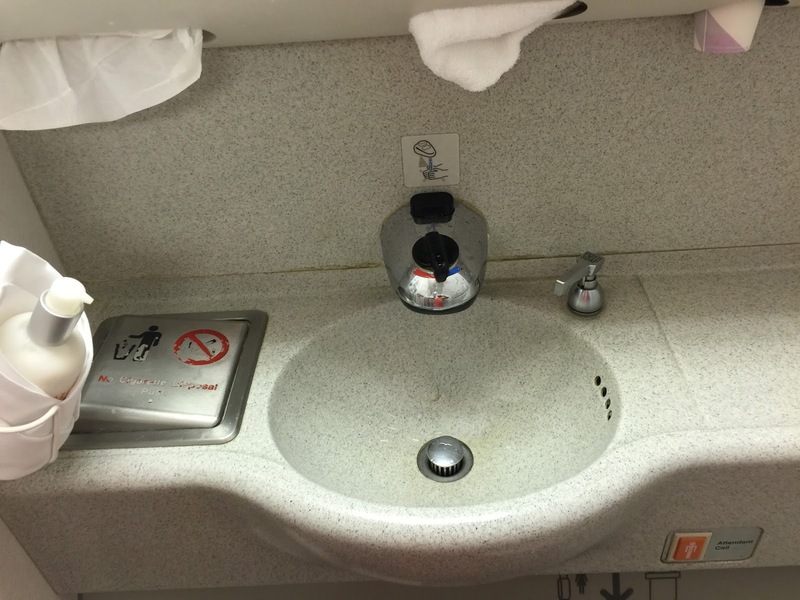 There are also amenities such as handkerchief, tissue, eau-de-toiletry, hand moisturiser and hand wash in the lavatory. 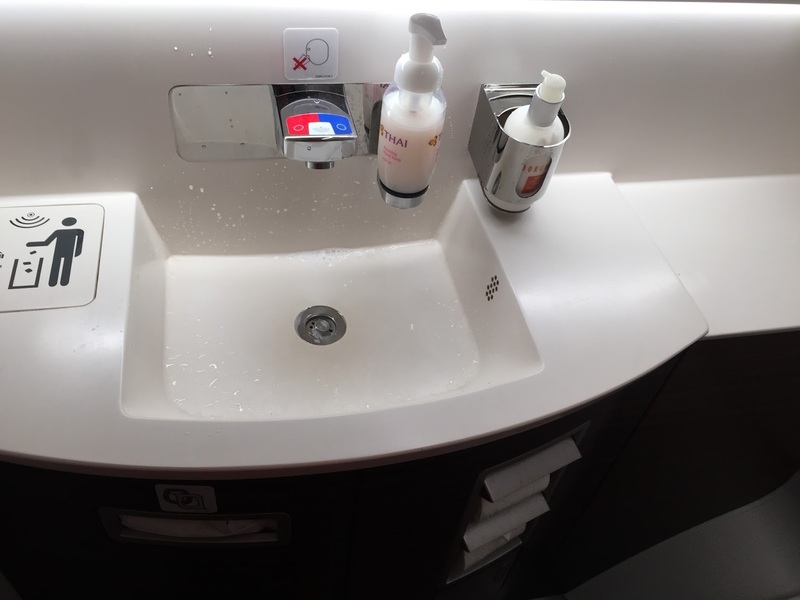 However unlike some airlines, there is no presence of mouth wash onboard the Thai Airways Business Class lavatory. 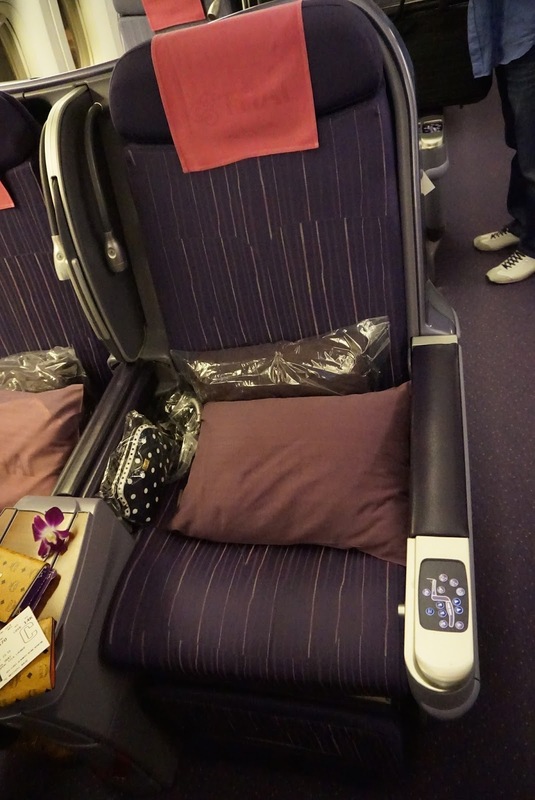 Thai Airways uses the shell designed seats on its 777-300, arranged in a 2-3-2 configuration. 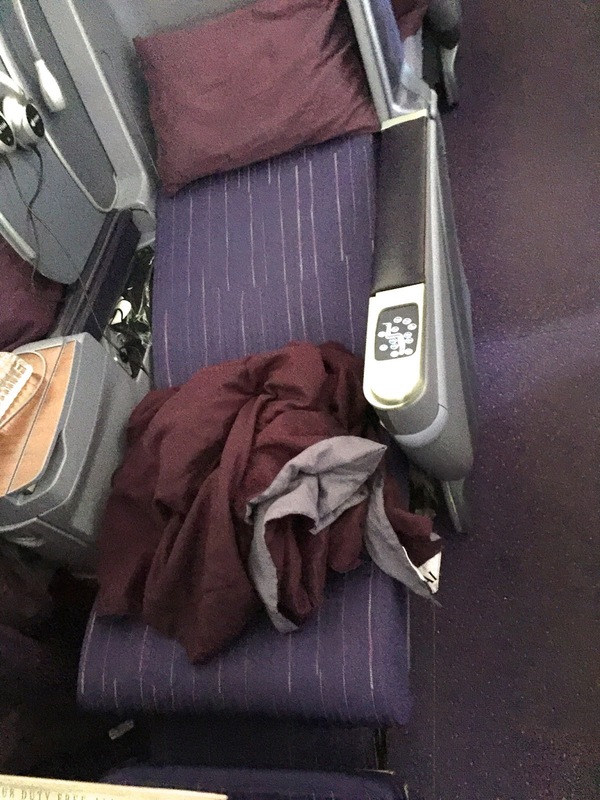 The seats in Business Class has a pitch of 70″ and measures 20″ wide. They are capable of reclining to almost flat, angled at 163 degrees. 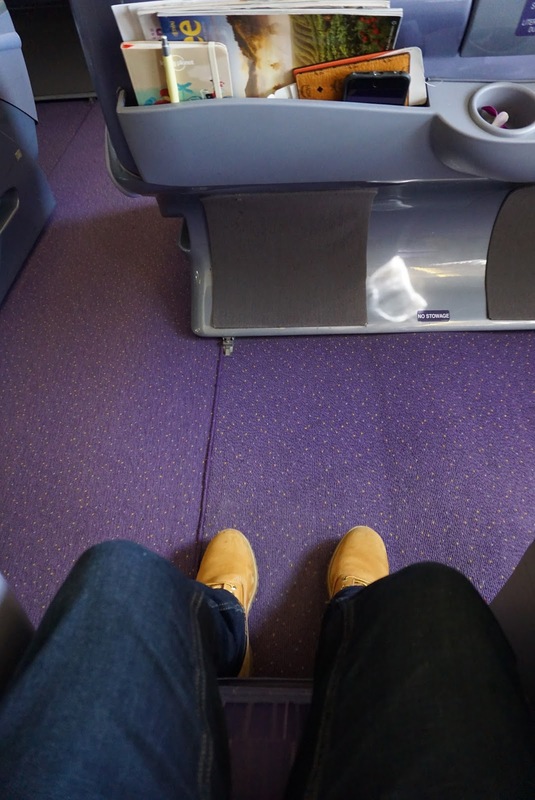 The legroom on its Business Class seats are superb, with sufficient space for the passenger seating away from the aisle to gain access to the aisle. Amenities such as pillows and blankets as well as the noise cancelling headphones are already made available on the seats when I boarded the aircraft. 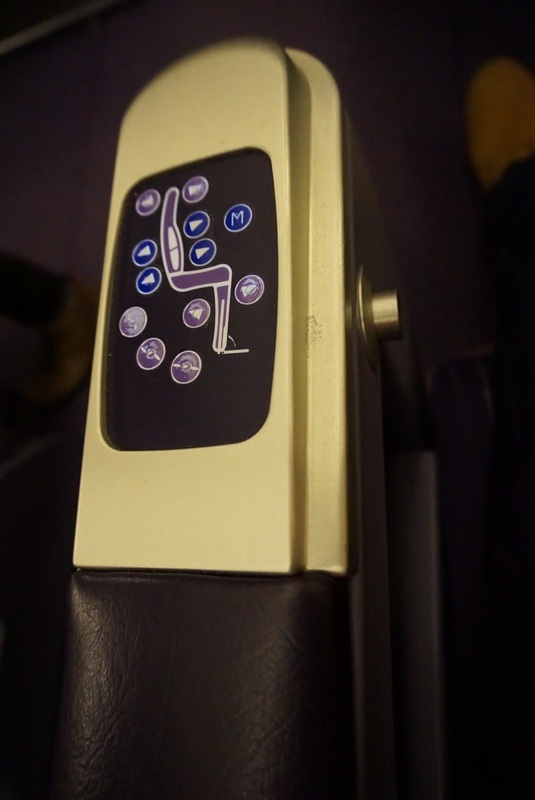 All Business Class seats comes with a massaging function for the lower back, deployable via the seat control panel on the armrest of the seat. The headphone jack is located under the armrest between 2 seats and a power socket is located across the headphone jack. 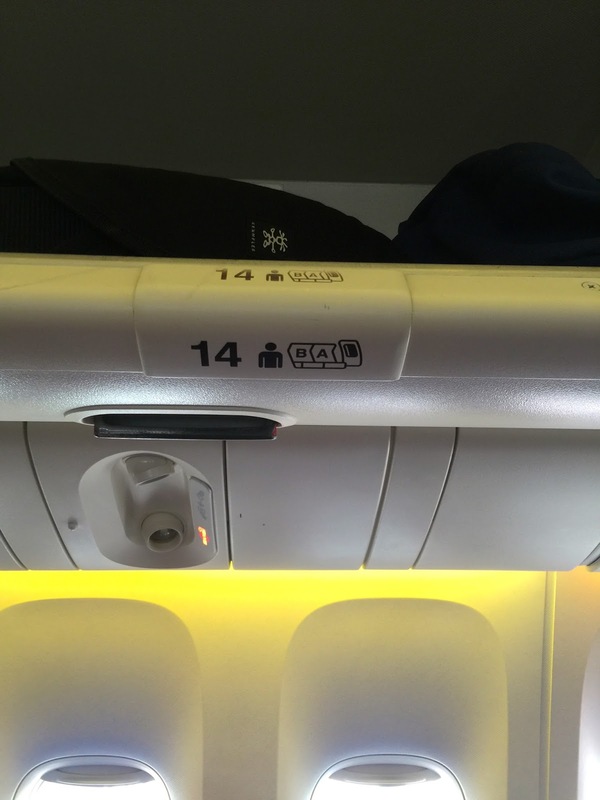 In addition to the overhead reading light, there is also another reading light located on the top left corner (depending on which seat one takes) of the seat. 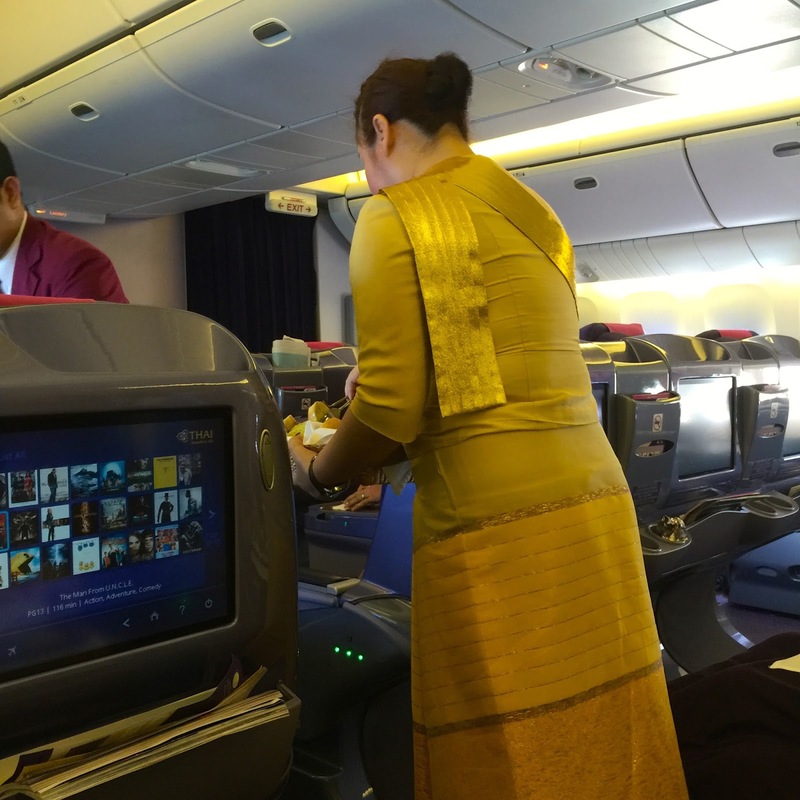 Thai Airways has fantastic AVOD system onboard, with wide variety of choices from movies to radio stations to music to games. The aircraft is fitted with 15″ LCD TV on the back of the seat in front of us. The AVOD is well organised in menus for ease in selection of entertainment. I particularly like the new movie menu, which immediately channeled me to the movies that I wanted to watch, especially useful for this short 2-hour flight from BKK to SIN. 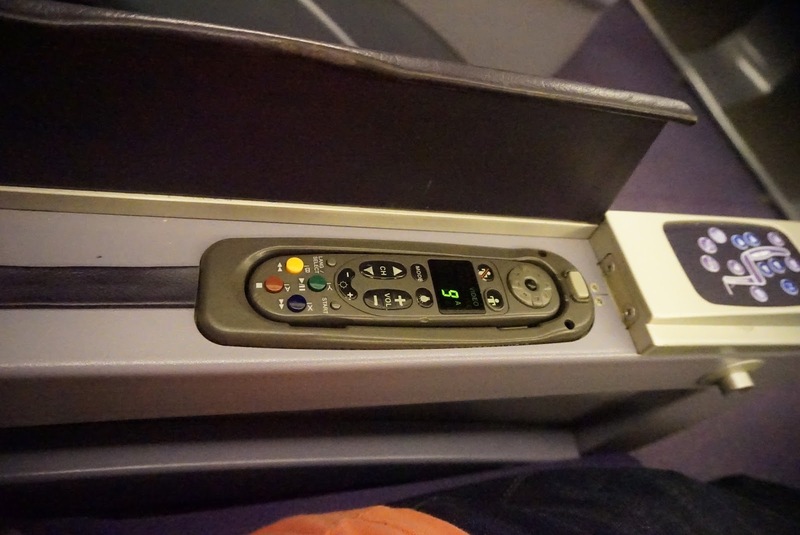 The controller for the AVOD is hidden under the cover of the armrest of the seat. 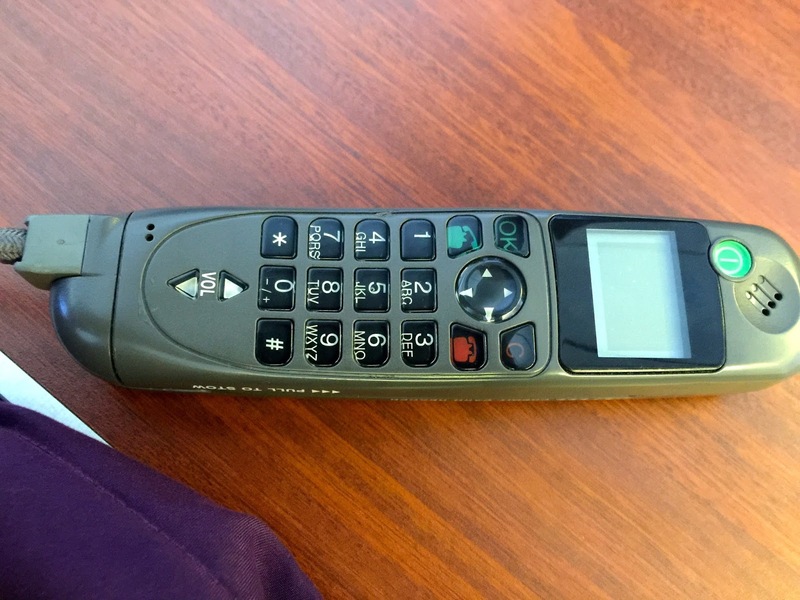 The AVOD controller is an older model with easy to use and functional buttons. However it is not as responsive as I would like it to be. The AVOD felt lag, perhaps due to the age of the controller system. 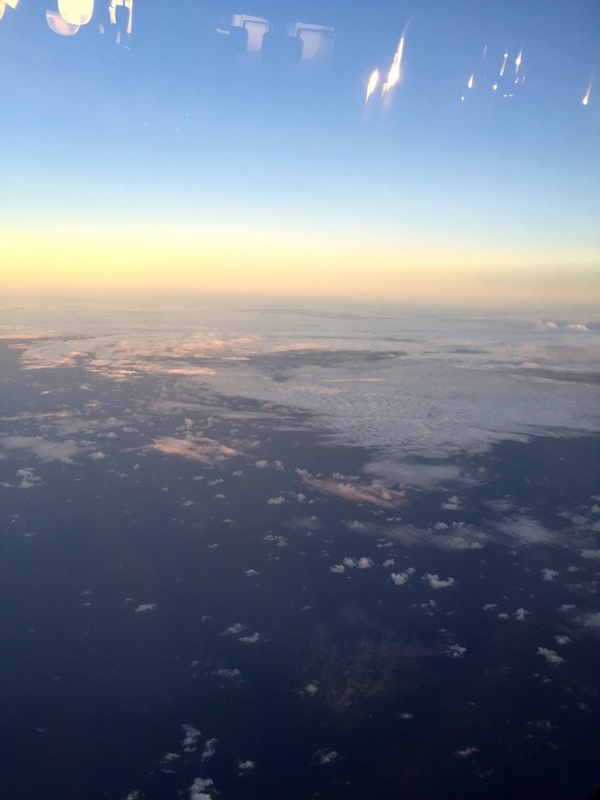 As with most Business Class services, the pursuers approached us with welcome drinks and wet towels as soon as we were settled into our seats. We enquired about the “Violet Bliss” and was gladly given by the pursuers. 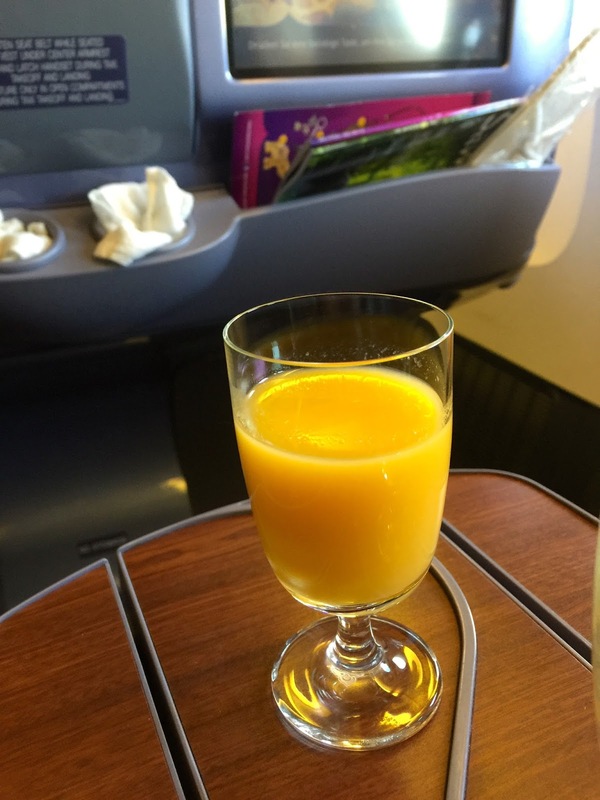 We were told this drink is the Thai Airways signature drink and limited quality were brought onboard on every flight. The pursuers came around with menus to be returned a little later to take our orders for meal. 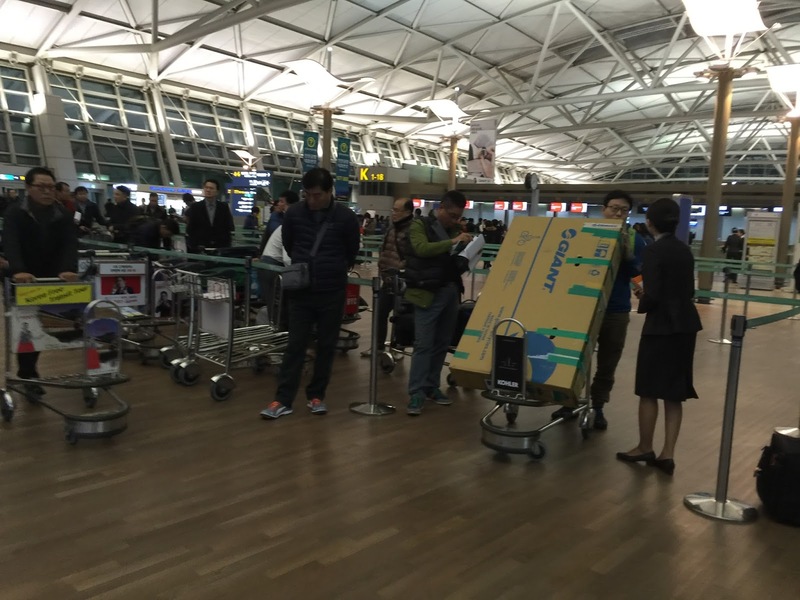 At the same time, pursuers came around distributing quilts for passengers in Business Class. As soon as the seat belt signs were switched off, the pursuers sprung into action doing their rounds serving warm almond nuts and doing another drink round. We opted for the “Violet Bliss” once again. About 45 mins into the flight, dinner was served. As this is a short flight, all courses of the meal was served at one go. I opted for the sea bass meal, which was delicious. The perfectly seasoned sea bass was thick and tasted fresh. The starter, salmon with duck, was served together with the meal course. I did not like the salmon as it tasted a tad salty for my liking. Neither did I like the Mango Passion Fruit dessert as it tasted a tad too sour for my liking. After serving all the passengers meal, the pursuers came around serving coffee and tea. I opted for a cup of cappuccino, which the pursuers gladly served to me. Starters, Main Course and Dessert was served all at one go due to the short flight time. I opted for the sea bass. 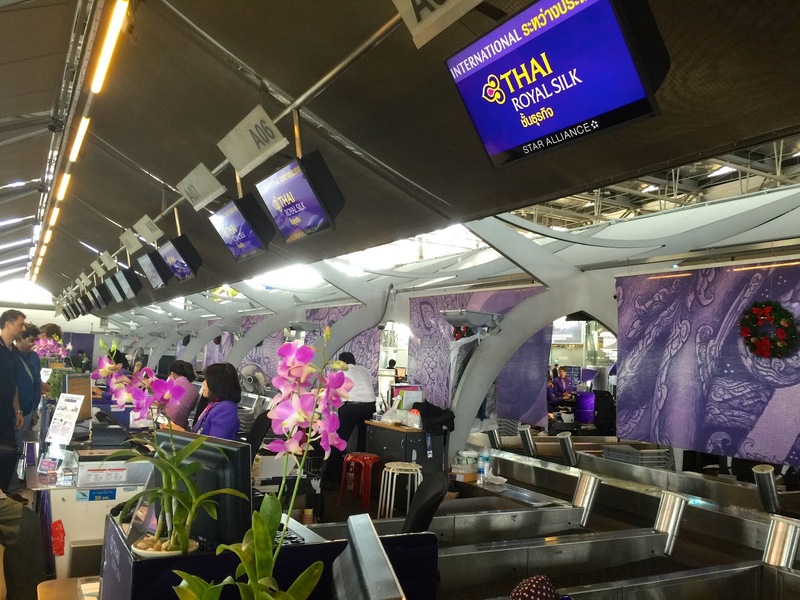 The good service from Thai Airways was felt at the moment of checking-in at the airport. The friendly and warmth ground staff struck conversation voluntarily and checked how was my stay in Bangkok. She patiently and efficiently processed my check-in and tagged my luggage professionally. 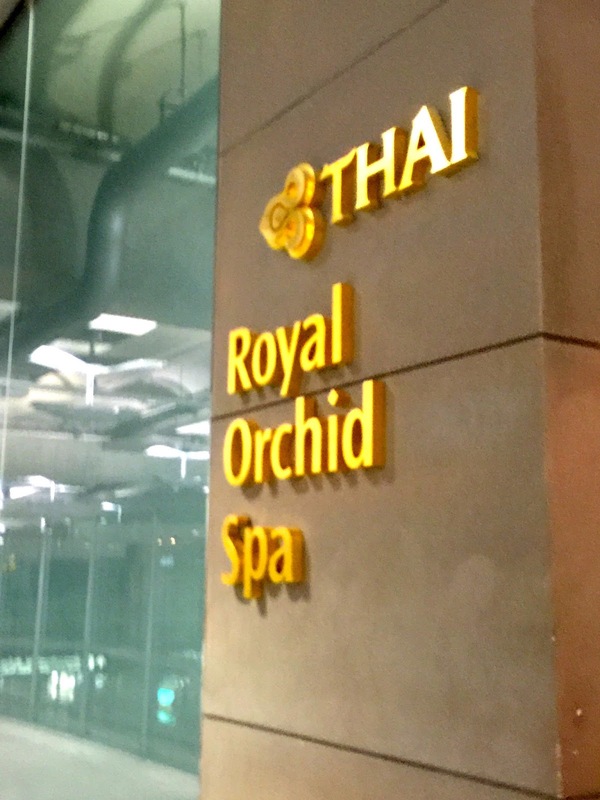 I can’t say enough how I loved the service rendered by the professional staff at the Royal Orchid Spa. 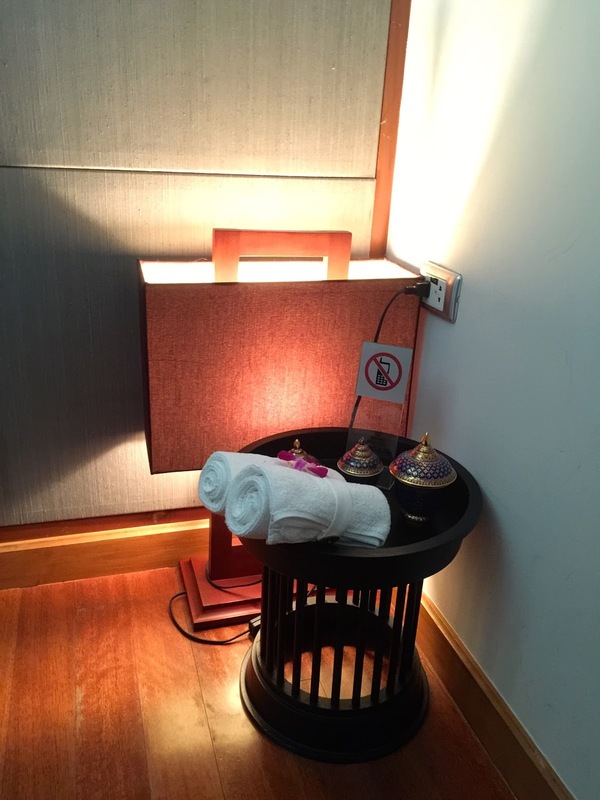 The staff was very professional and skillful and the massage rendered was as good if not better than those one can find in some of the massage palours in downtown Bangkok. The service I received onboard TG409 was impeccable. The pursuers felt warmth and sincere and did not make me feel they are going through motion. 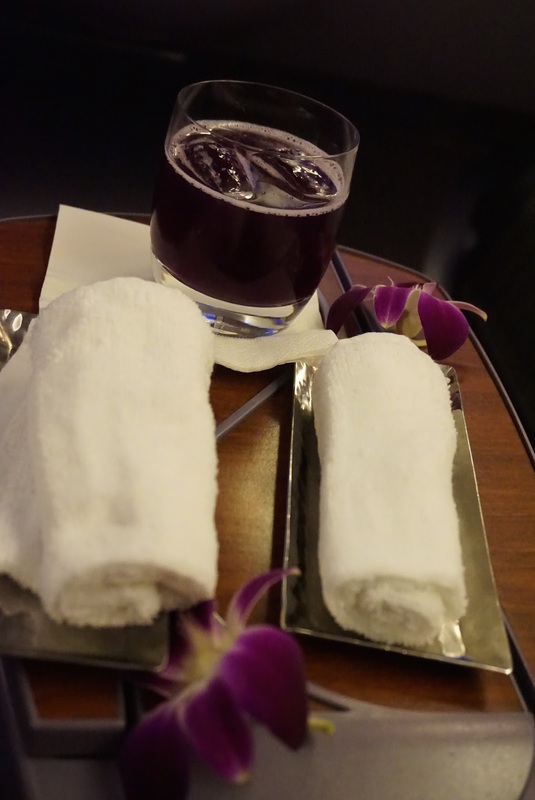 The pursuers took note of my preference for “Violet Bliss” and even suggested how the drink can be best consumed. She suggested adding Pierre water to bring out the taste of the drink better. And she was right. A fresh glass of “Violet Bliss” always appear on my table whenever the pursuers saw my glass empty, without me having to ask. The pursuers truly portray the friendliness and warmth of the Thais that many came to know. They went around serving passengers with a smile and their attention to details is superb. 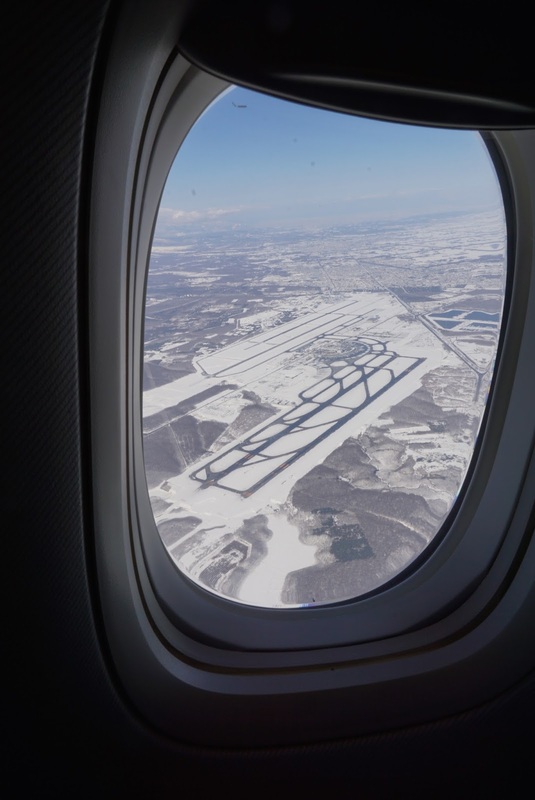 Despite being busy for this short 2-hour flight, the pursuers did not show signs of frustration and rush. 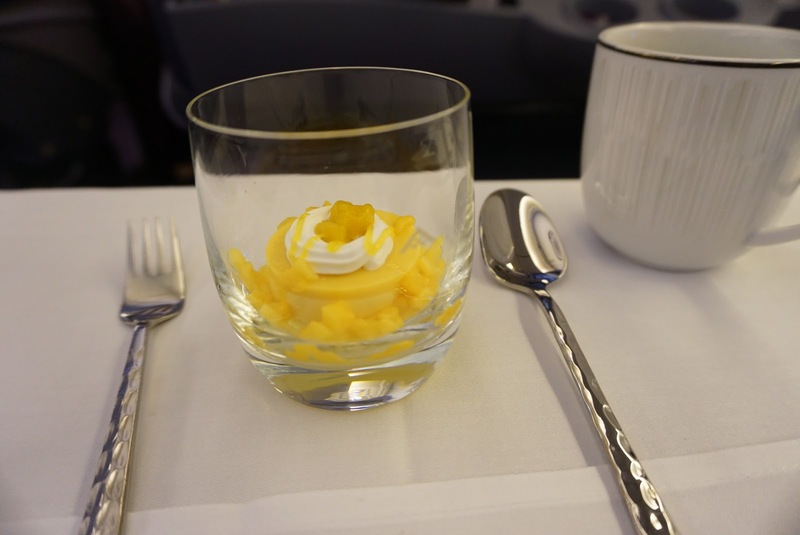 They went around doing their best to satisfy all passengers in the Business Class Cabin. 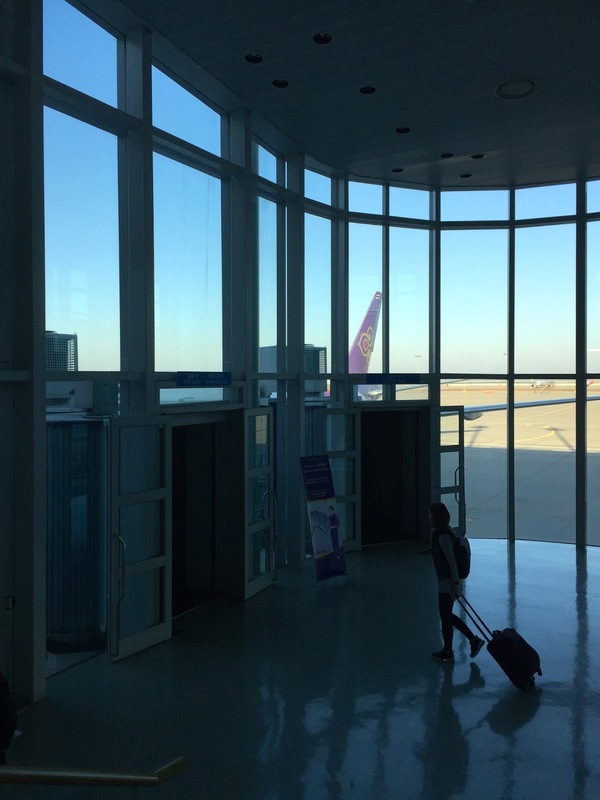 My experience with Thai Airways is more positive. Despite the ageing hardware on the 777-300 aircraft, as seen in the degrading AVOD controller, however the service I received more than make up for it. 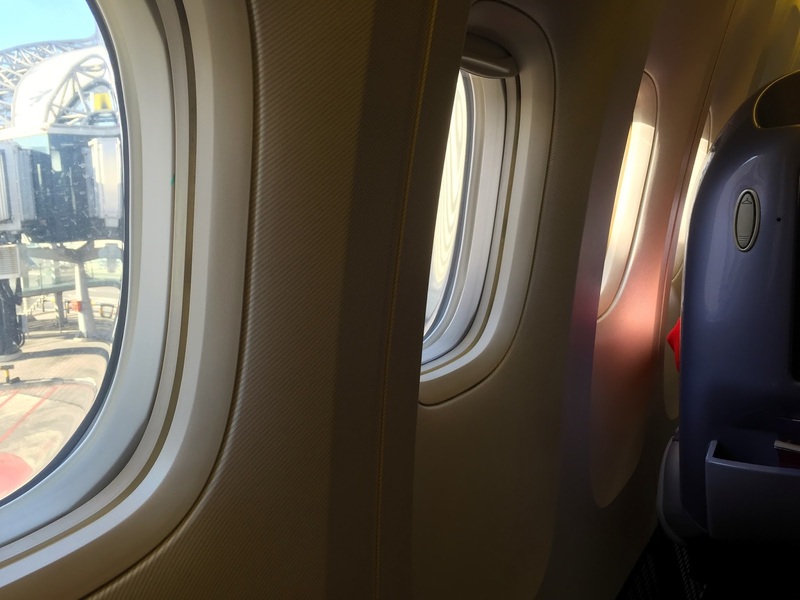 Despite being ageing, the seats are still comfortable, but the cabin can be a little stuffy as the air conditioning does not seem to be functioning well. 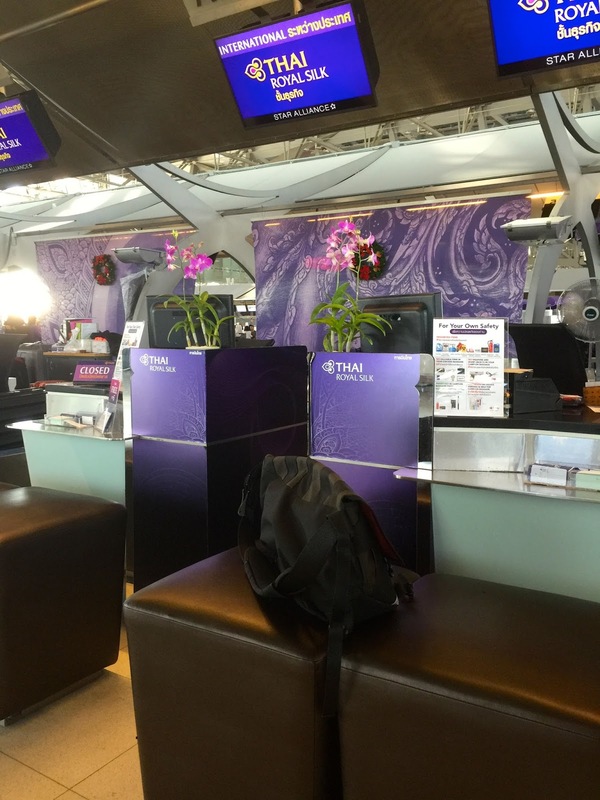 Thai Airways has wonderful service, which made me felt welcome from check-in to onboard services. The ground staff as well as the pursuers onboard felt warm and sincere. 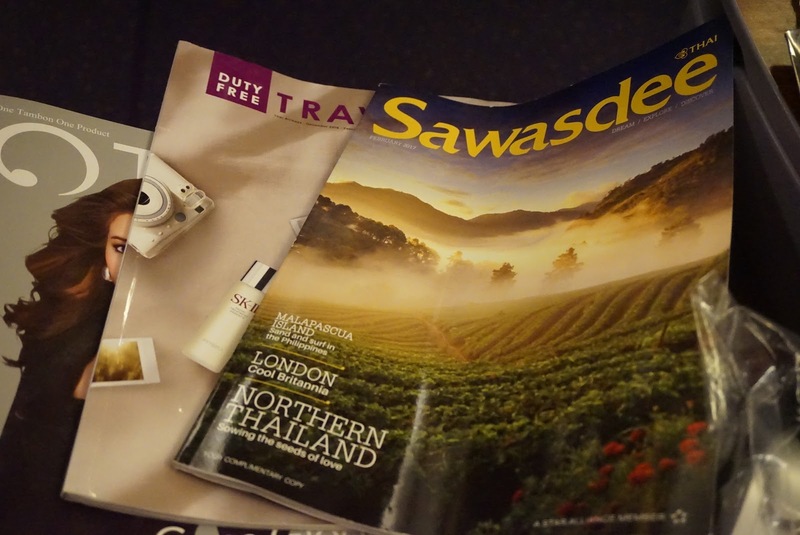 They even took note of small details that makes flying with Thai Airways a pleasant experience. 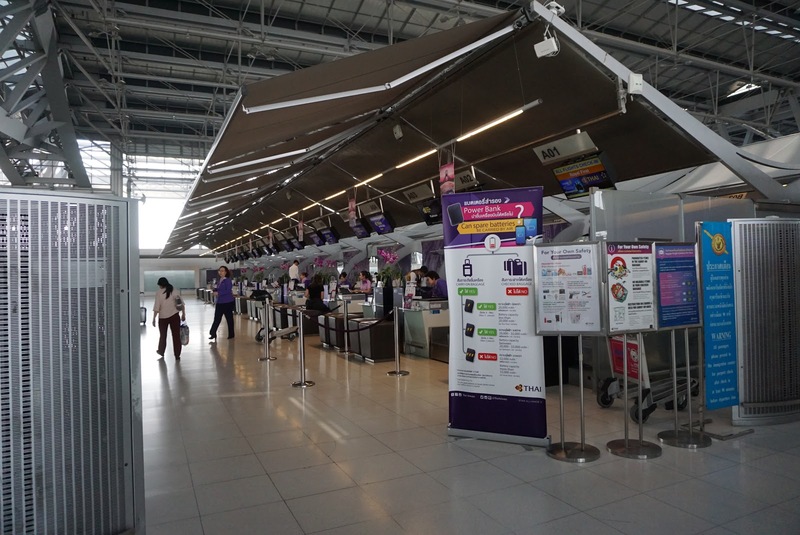 Thai Airways check-in area is located at row J, to the left side of the terminal on level 3. 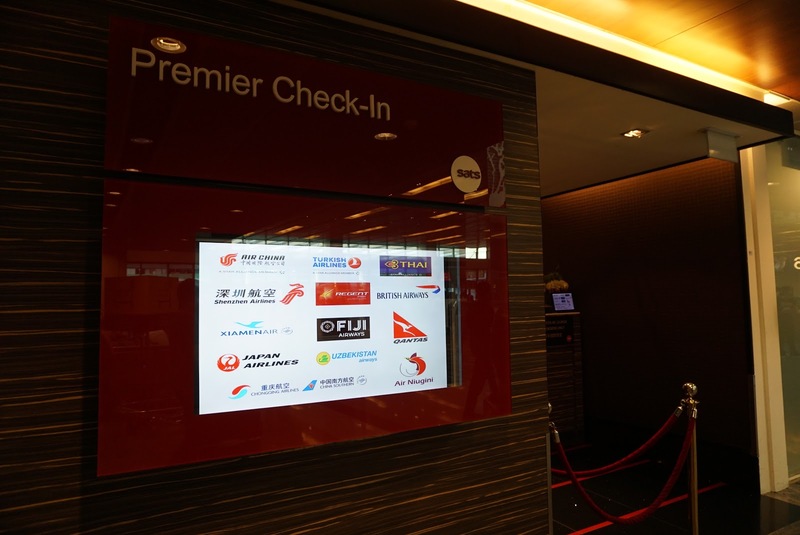 As with most other airlines, Business Class passengers has a dedicated check-in counter (J21 and J22). 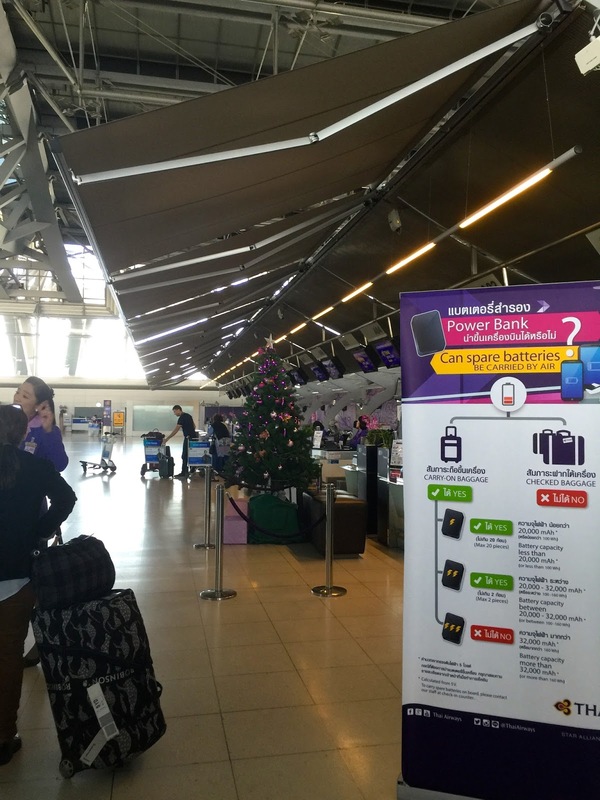 Check-in was swift, thanks to the mobile check-in on the Thai Airways app. However after checking in our luggages, the staff at the check-in desk requested us to wait by the side for around 5 mins for our luggage to be x-rayed before proceeding to the airside as we were informed that there was some problems with the x-ray machine. There was however no one to inform us if our luggages has cleared the x-ray machines and we were free to proceed to the immigration area. 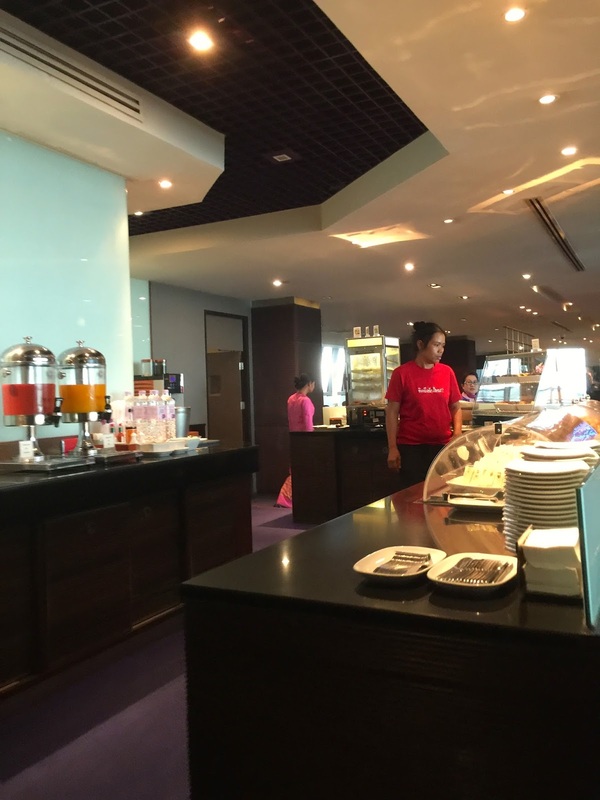 Thai Airways uses Asiana Airlines Lounge for its premium passengers. 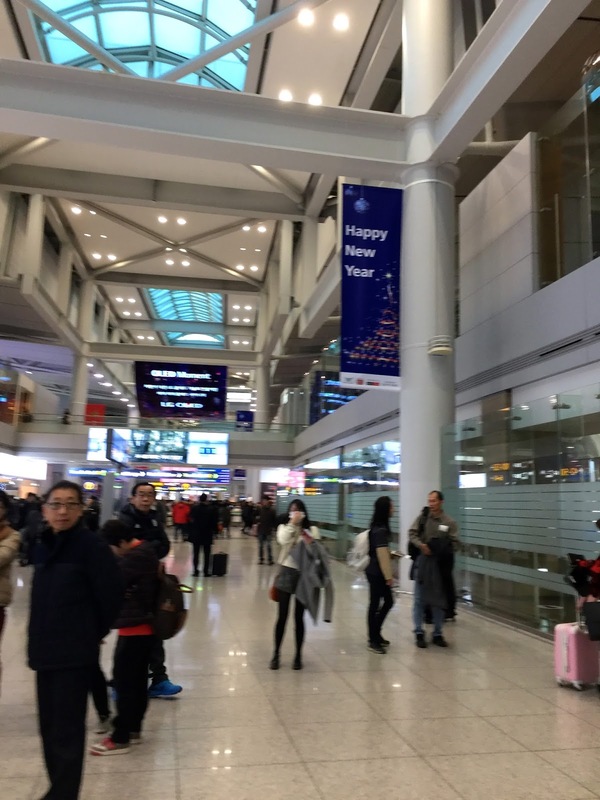 There is one located at the satellite terminal of Incheon Airport. 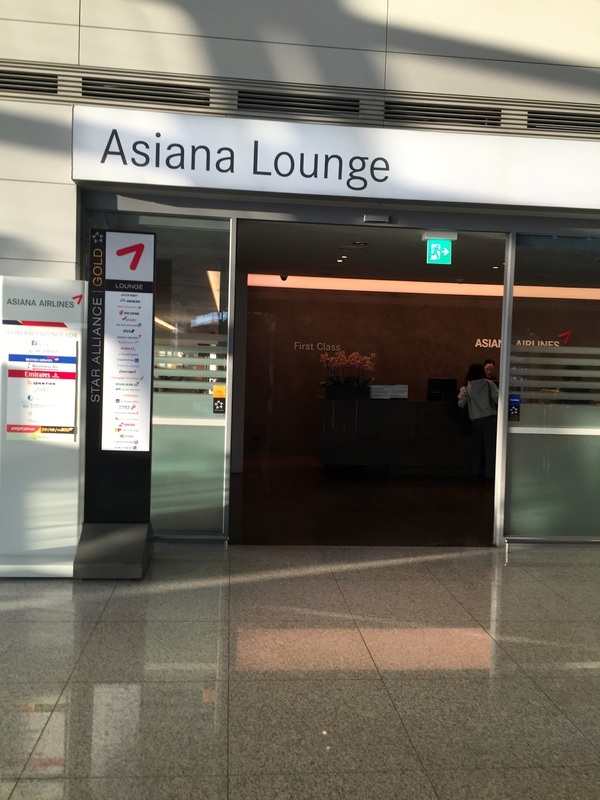 A friendly staff (from Asiana Airlines) greeted passengers when collecting their boarding pass for verification. 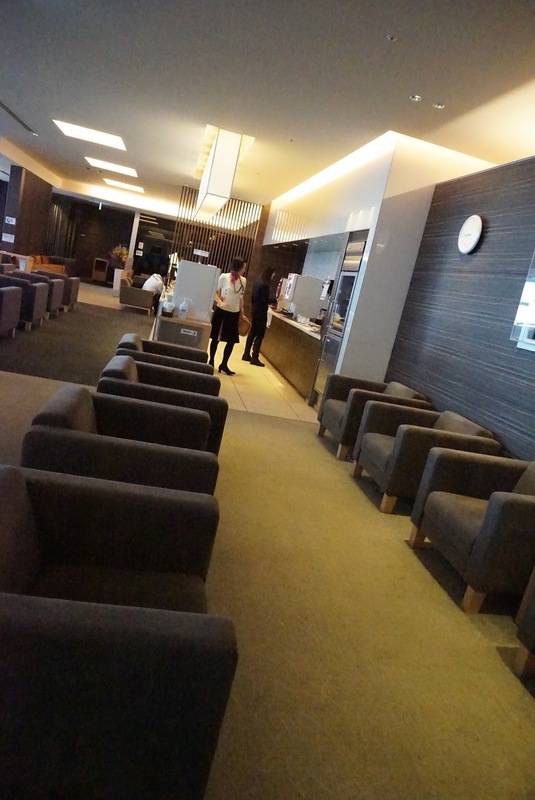 After the verification, the staff directed us to the Business Class section of the lounge, whose entrance is located to the right of the lounge. Past the entrance, the earth-toned lounge opens up to the lounge area, furnished with arm chairs and small coffee tables, the lounge is rather conducive for one to relax in while waiting for one’s flight. There is also a small dinning area, with dinner tables for 2 located next to the buffet area. The buffet area is tucked in one corner on a kitchen island, with mainly sandwiches, bread and salads on offering. 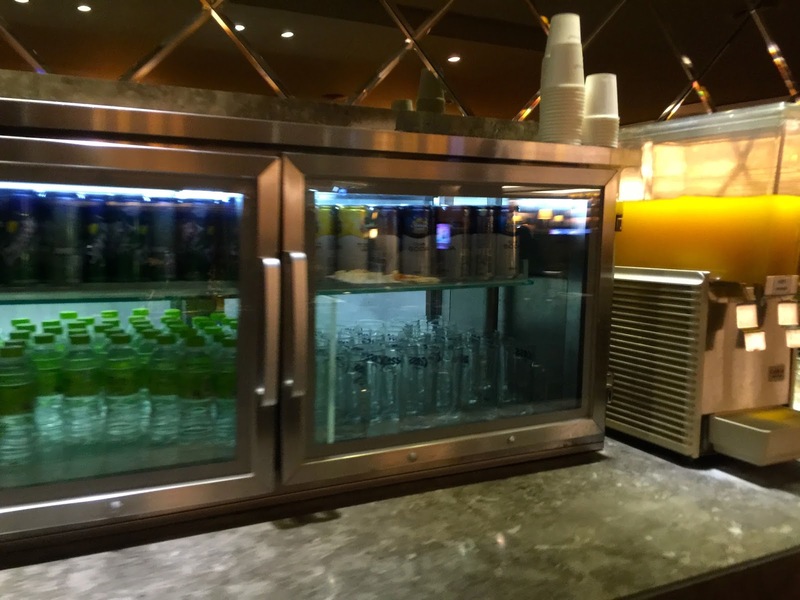 The beverage area is located behind the buffet island with both hot and cold options. 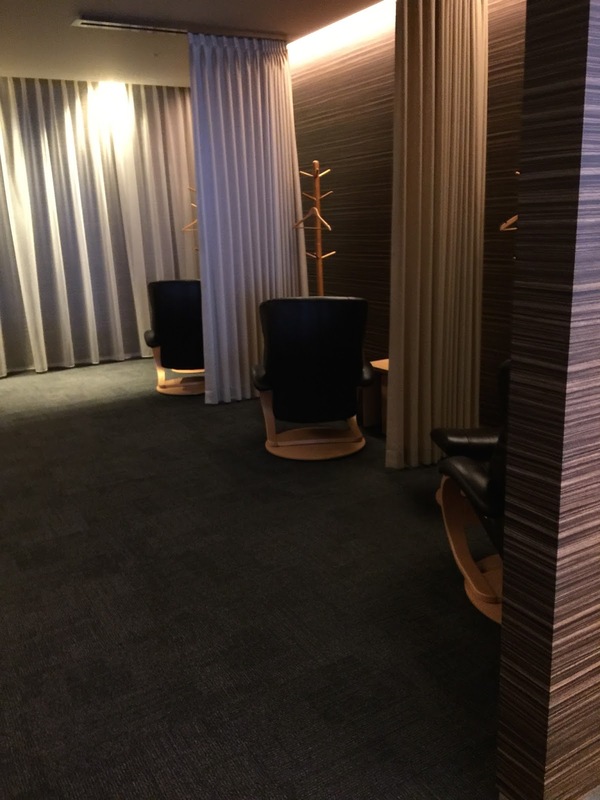 There are rest areas, with massage chairs, and shower/toilet area tucked in one corner of the lounge. The staffs at the lounge are very friendly and welcoming. They are also attentive and cleared empty plates fairly quickly. There are no lack of shopping at the airside in the main terminal. Luxury brands such as LV, Bottega Veneta are found in the main terminal. 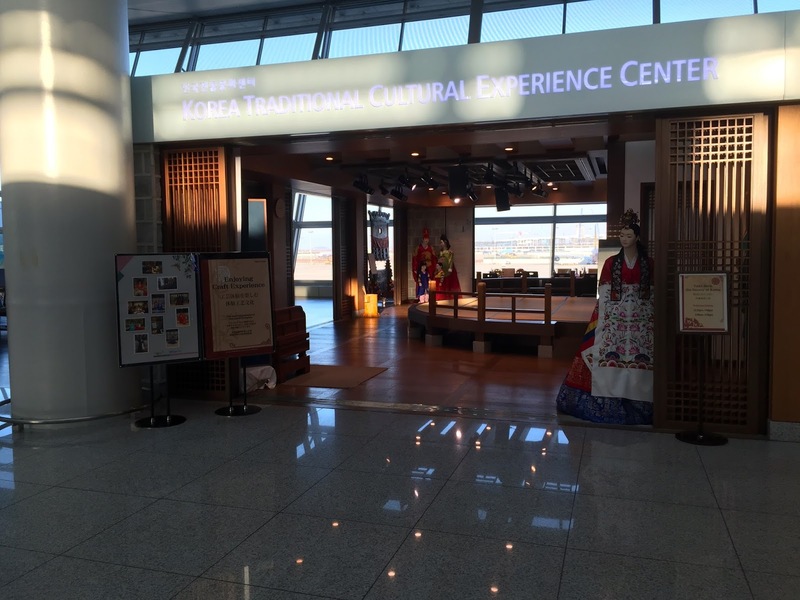 There is also an area for passengers to experience Korean Culture through arts and craft. However at the satellite terminal, shopping options are rather minimal. 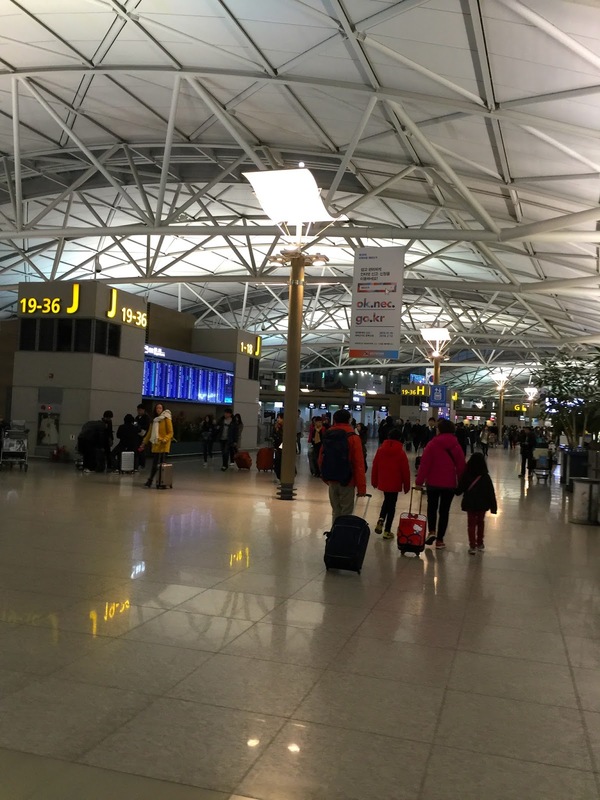 Incheon Airport has open waiting area concept and the gates are not separated by rooms or partitions. TG operates 777-300 for this ICN-BKK leg. 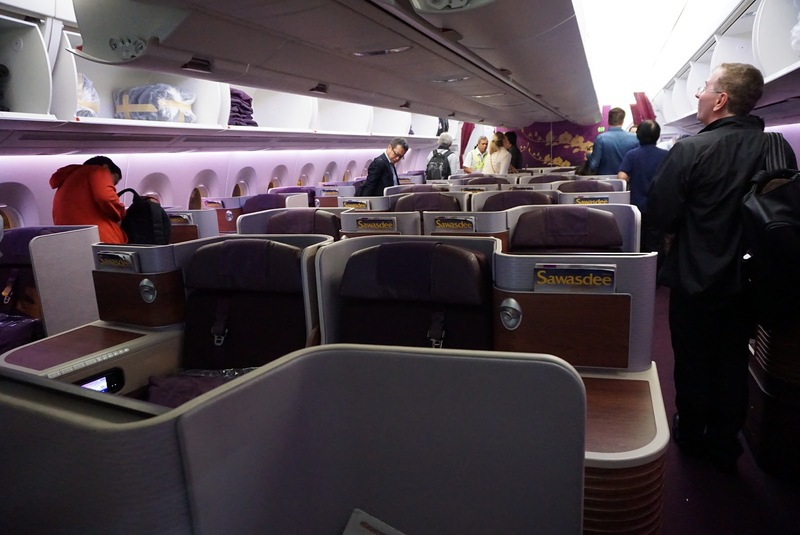 Entering the iconic Thai airways purple themed cabin, 34 seats Business Class cabin with 2-3-2 configuration, expect for one row which has 2 seats in the centre, welcomes the passengers onboard. 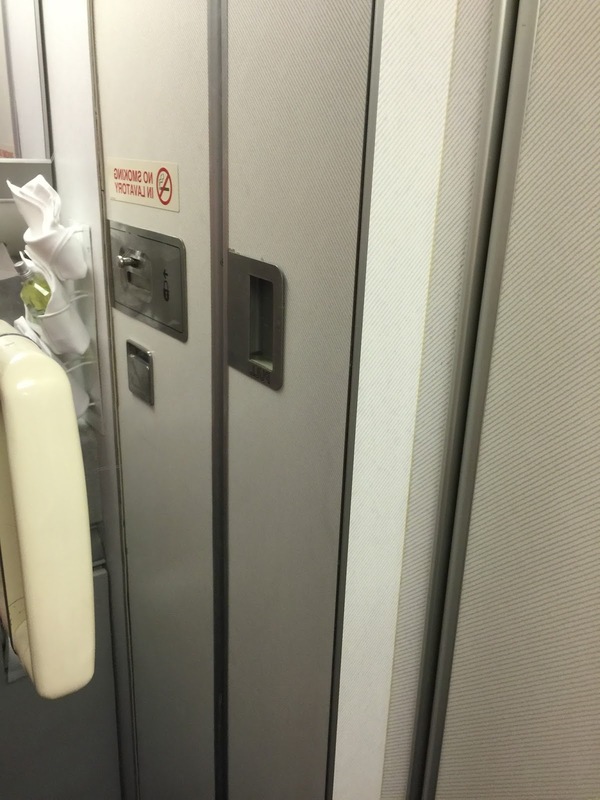 There are 2 lavatories in Business Class and both were located just before the entrance to the cockpit. The lavatories were a tad cramp. Amenities available in the premium class lavatories include hand soap, moisturiser and eau-de-toilet. 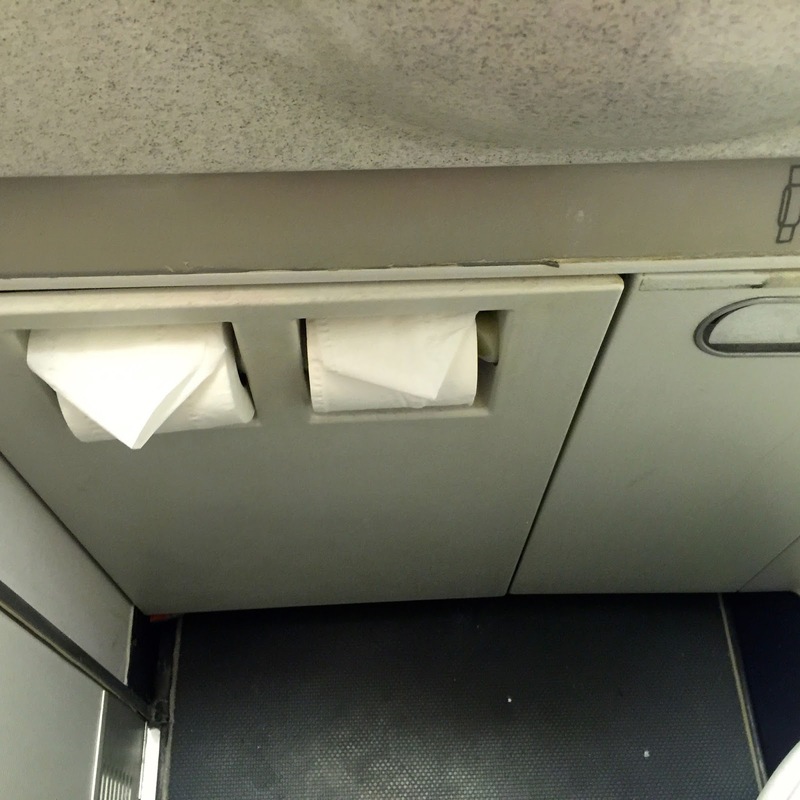 Other than using tissue papers, handkerchiefs were available in the lavatory. 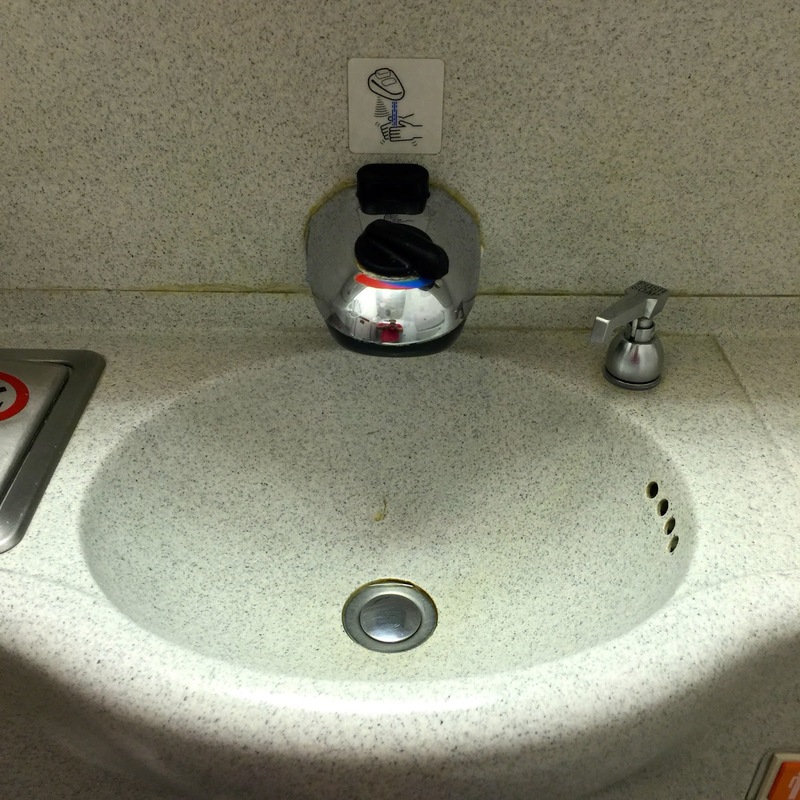 I particularly like the sensor tap in the lavatory. 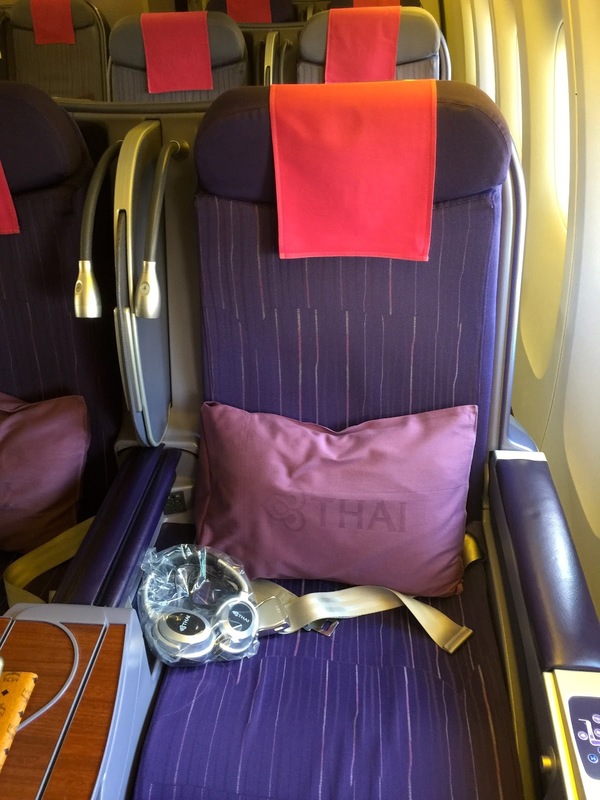 As with most TG flights, Thai Airways uses shell seats in its Business Class cabin. Each seat has a pitch of 70″ and width of 20″. The seats can be reclined to an angle of 170 degrees, which provided an almost flat bed for passengers whom would like to snooze during the flight. 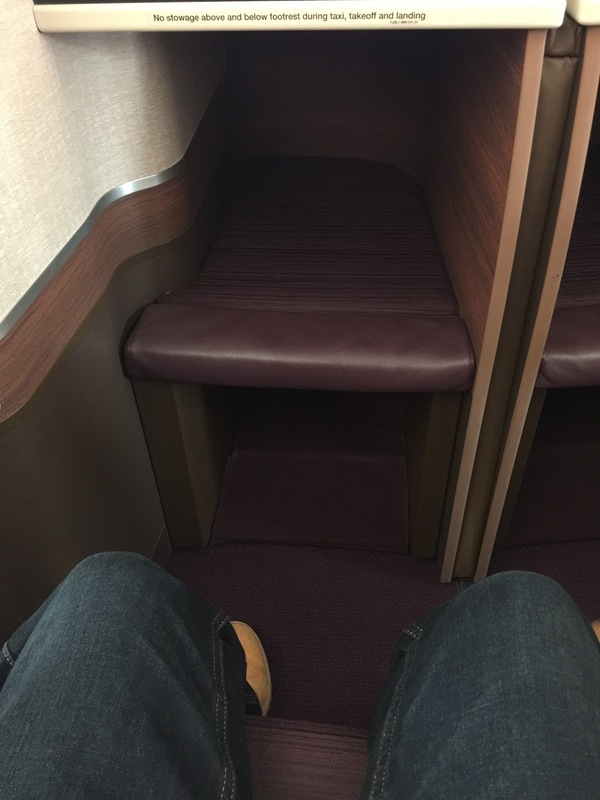 Leg room is superb in this cabin. The seats comes with a massage function in the form of vibration. Seat controls are located on the left side of the seat. The headphone jack is located under the right armrest, together with a power socket. 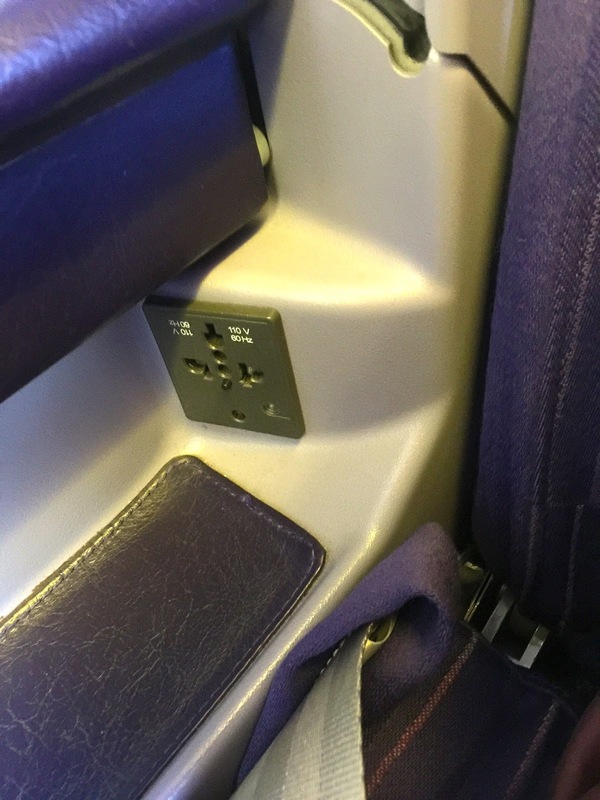 There are no USB plugs on the seats. 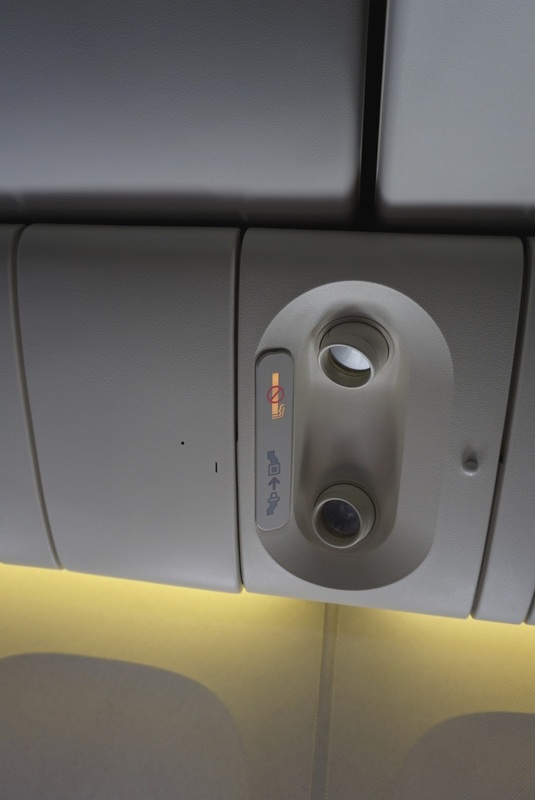 An additional reading light is located on the top of the seat, other than the ones on the ceiling of the cabin. There are a couple of cup holders and some slots for reading materials behind the seat in front of us. 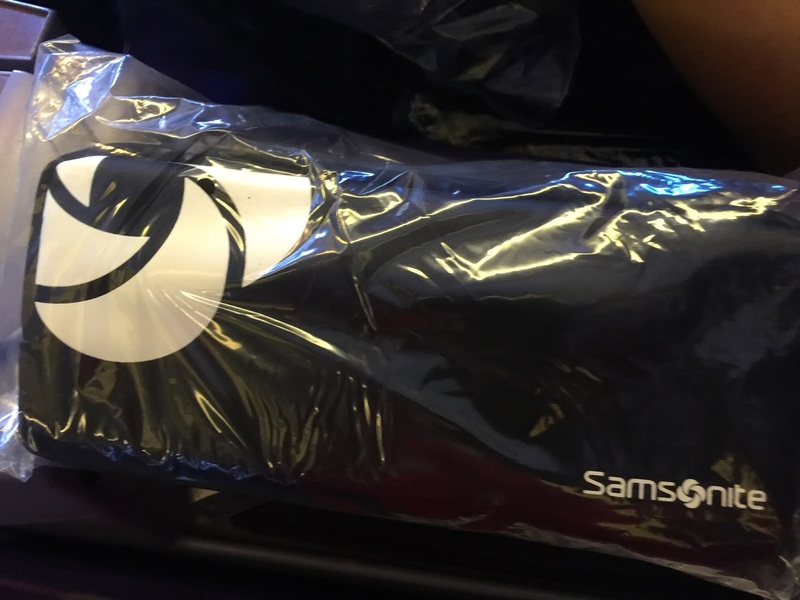 Amenity kits and pillows as well as blankets are already distributed on the seats waiting for passengers at the time of our boarding. Once settled into my seat, a friendly pursuer me by and distribute welcome drinks as well as warm towel. 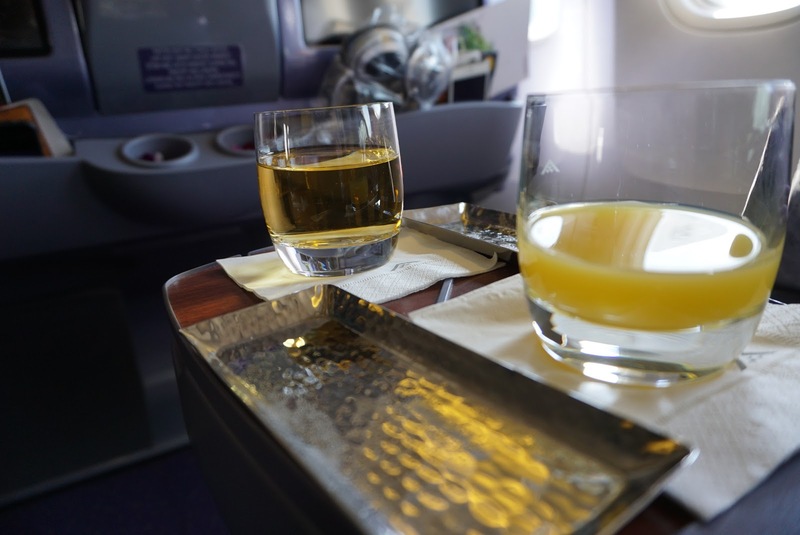 Drinks options include the signature Thai Airways “Violet Bliss” (I highly recommend this drink, it goes very well with Pierre Carbonated Water), Champagne, Orange and Apple Juices. As soon as the seat belt sign went off, the pursuers were seen springing into action and served nuts and more drinks. Another pursuer came around distributing menus and returned moments later to take our orders. Due to the long flight time, meals were served course by course. First meal was served about 1 hour into the flight. Pursuers came around setting the table with white table cloths. Moments later, they came back and served the appetiser. We had fried shrimp roll for appetiser. The prawn was still crispy, and tasted very well especially when eaten with the Thai Sweet Chilli Sauce that served with the appetiser. After seeing that we have emptied our plates, the pursuers came by with the second course – Salmon with Black Sesame Seed. The smoked salmon tasted fresh and goes very well with the salad that came with the dish. Soon plates were cleared and we were served the main course. I opted for the marinated pomfret with steam rice. The pomfret tasted a little sticky, however it tasted good with the sauce that comes with it. My friend opted for the curry chicken. The dessert served was 3 grapes a slice of pear, which looked rather pathetic on the plate. 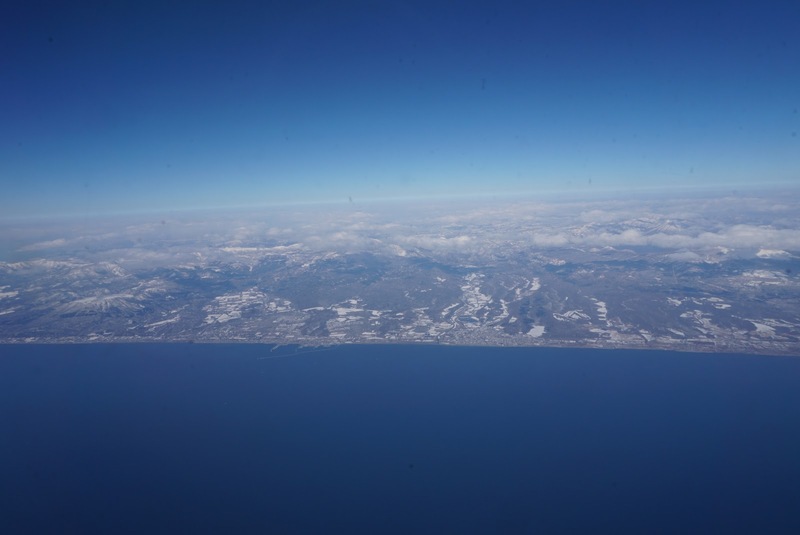 Around 1 hour before landing, the pursuers came around distributed chicken wrap. I particularly like the chicken wrap, which has a tingle of spiciness, but too over powering. Drinks were available throughout the flight. 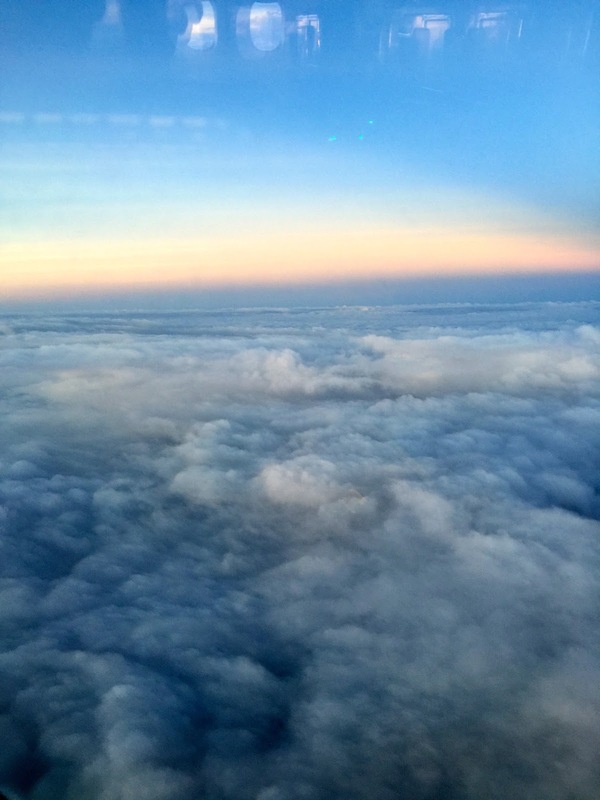 The pursuers were extremely friendly and caring on this flight. They truly embraced the warmth and friendliness that Thais are famously known for. They took note of our preferences and came around asking if we need more of the beverage we had been having. They were very observant and plates were cleared shortly after we finished our food. Pursuers were seen patrolling the cabin whenever the seat belt signs were off. One particular pursuer strike conversation with me and was very knowledgeable. She was seen coming to our side of the cabin and constantly asked if we need our drinks topped up. Despite the cabin being a little aged, the angled flat seat still was able to provide good rest. The leg room was superb and the seat felt very comfortable. The pursuers were attentive and made me feel like a VIP when flying with them. Food kept on coming and if we were hungry, the pursuers gladly fixed something for us. 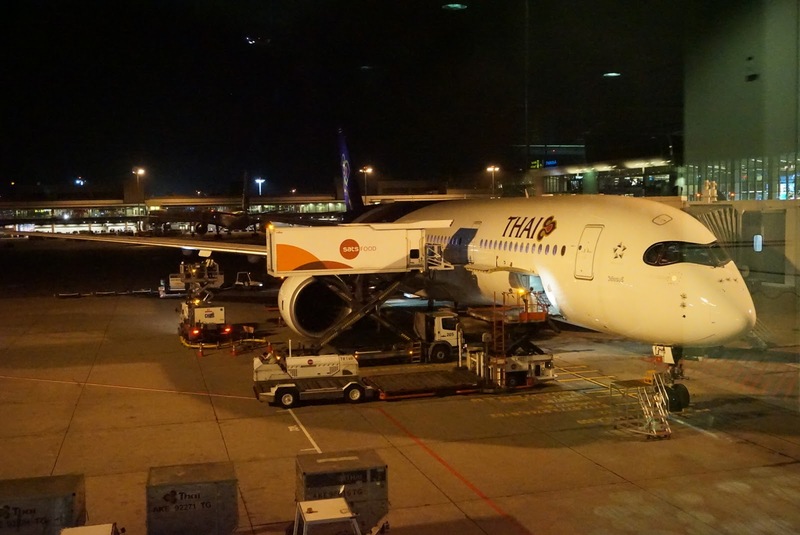 Overall, I enjoyed this ICN-BKK flight on Thai Airways.